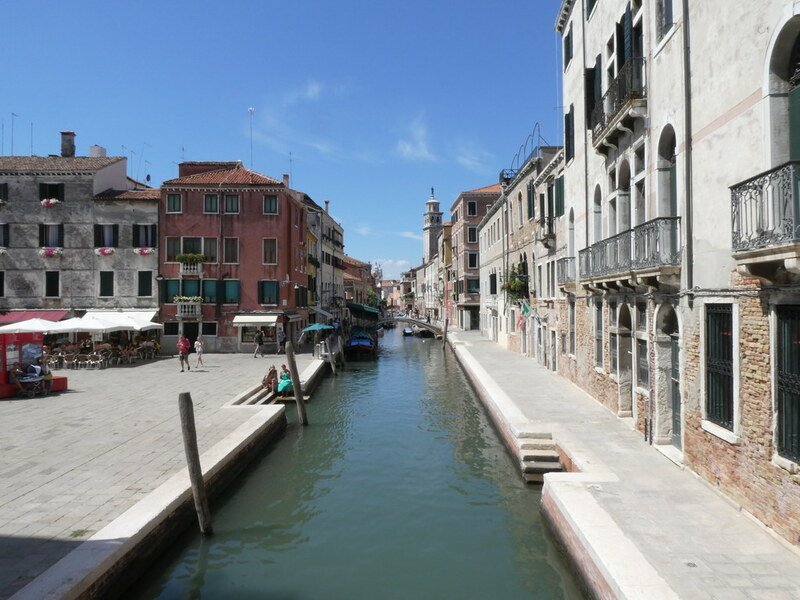 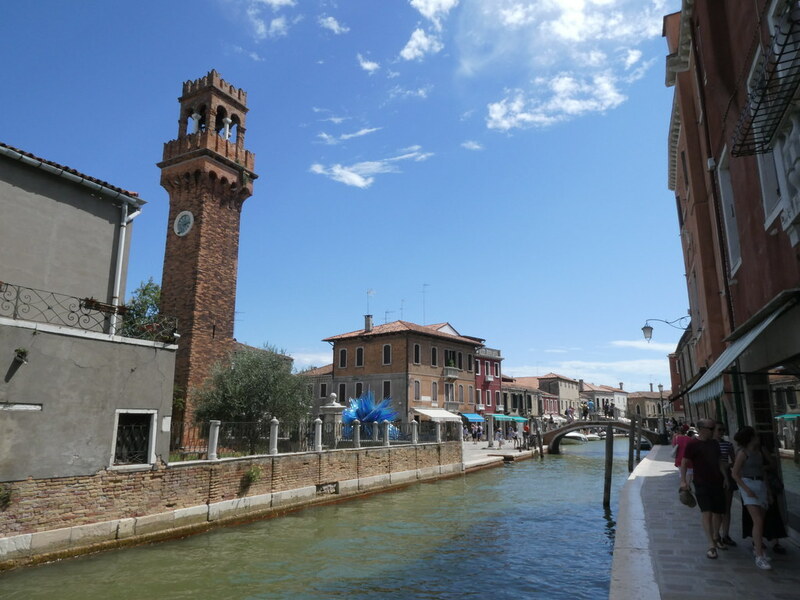 On our last day we made a plan to head for one of the districts we hadn’t been to, the Dorsoduro on the SW side of the city. 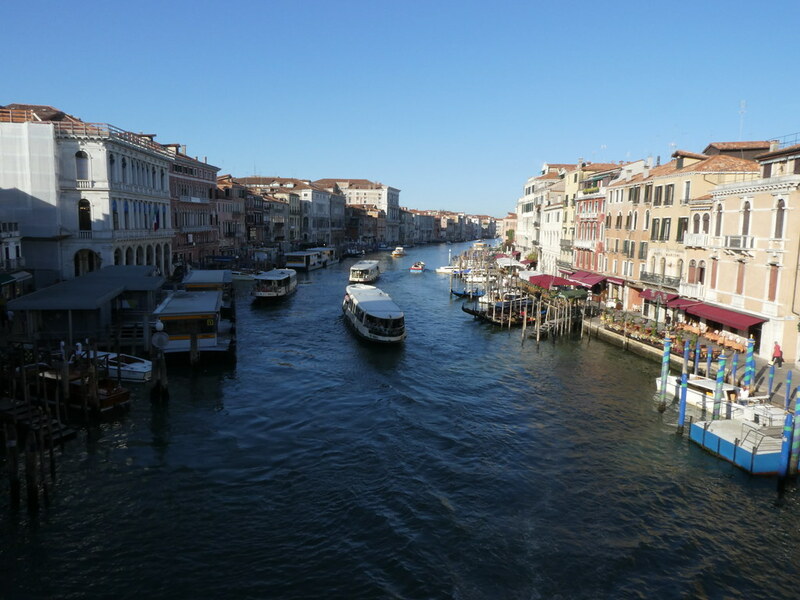 The main water artery through the city and we hadn’t seen it other than a brief view from the Rialto and Accademia bridges and outside the train station in the rain. 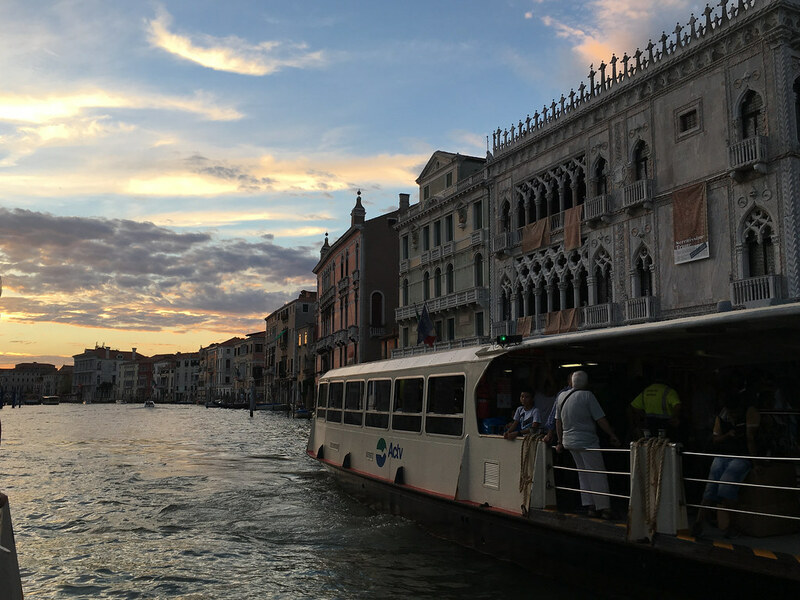 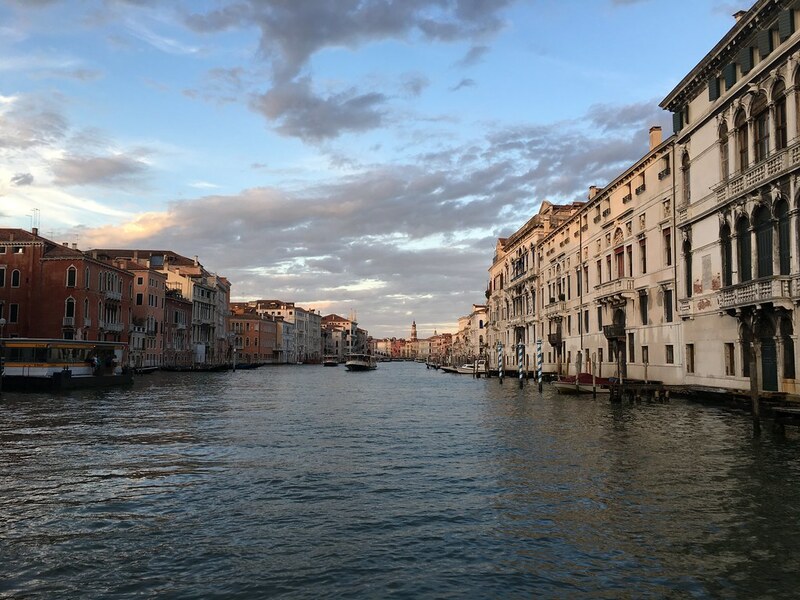 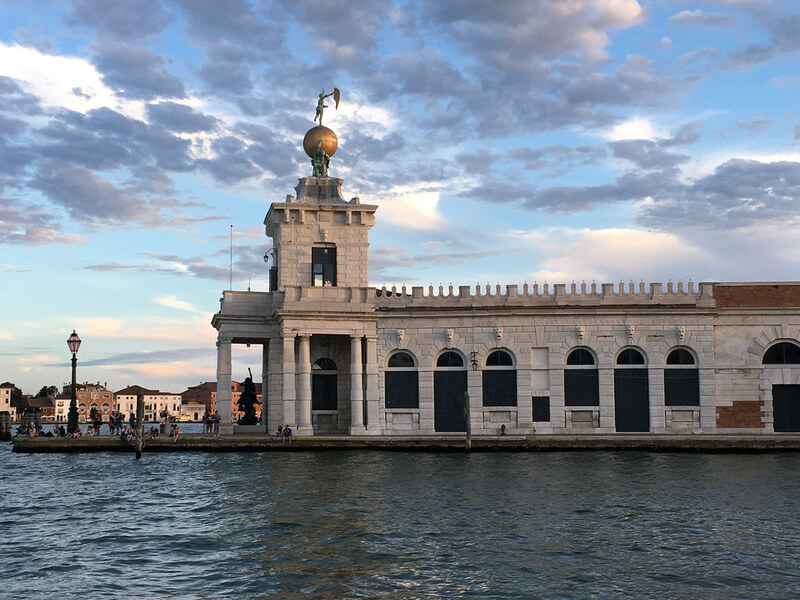 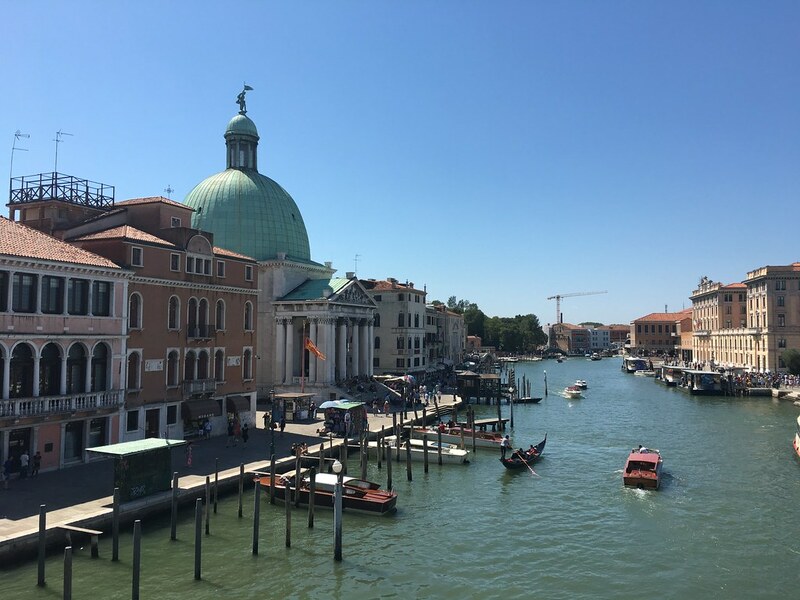 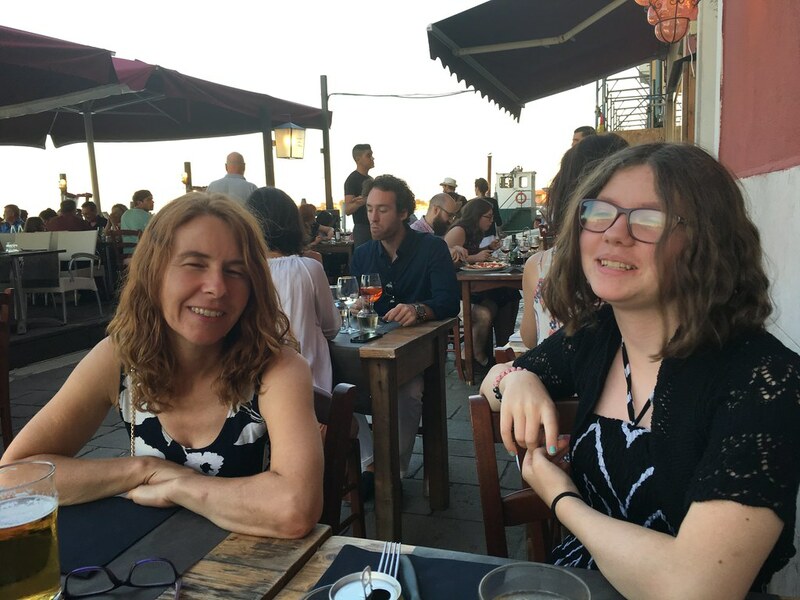 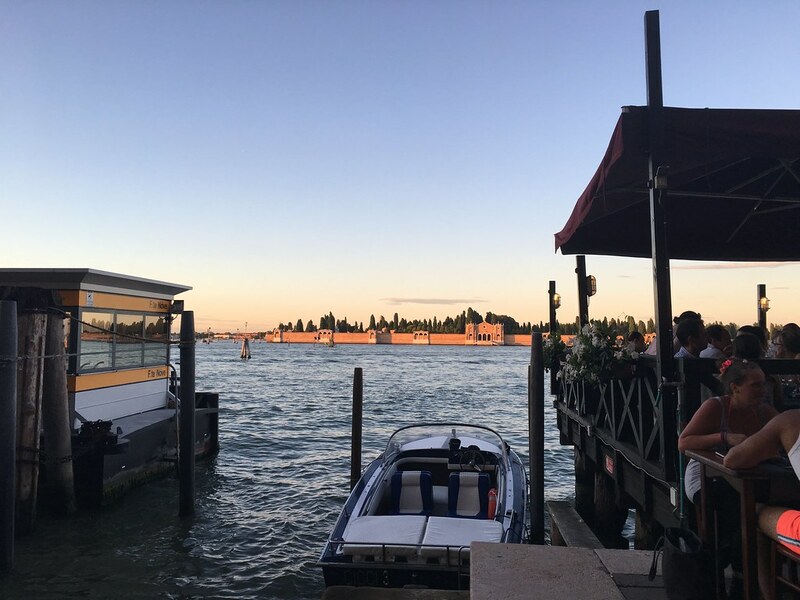 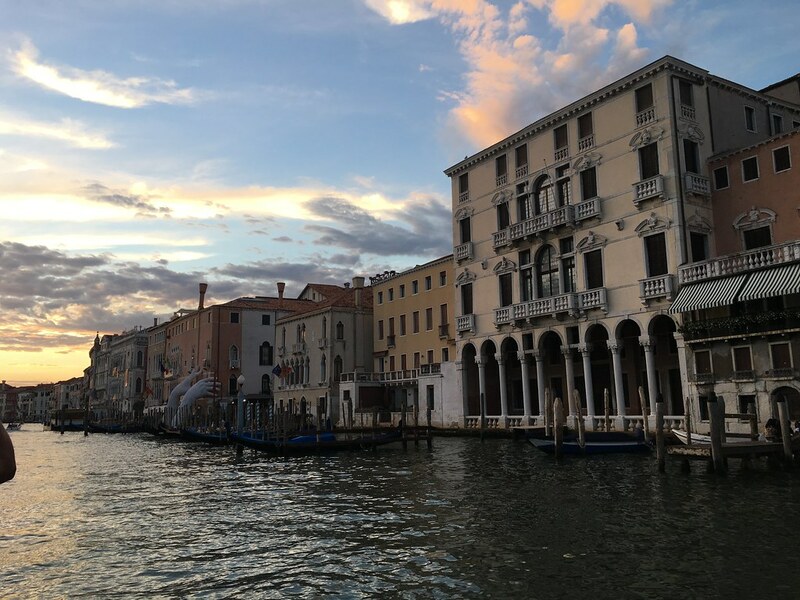 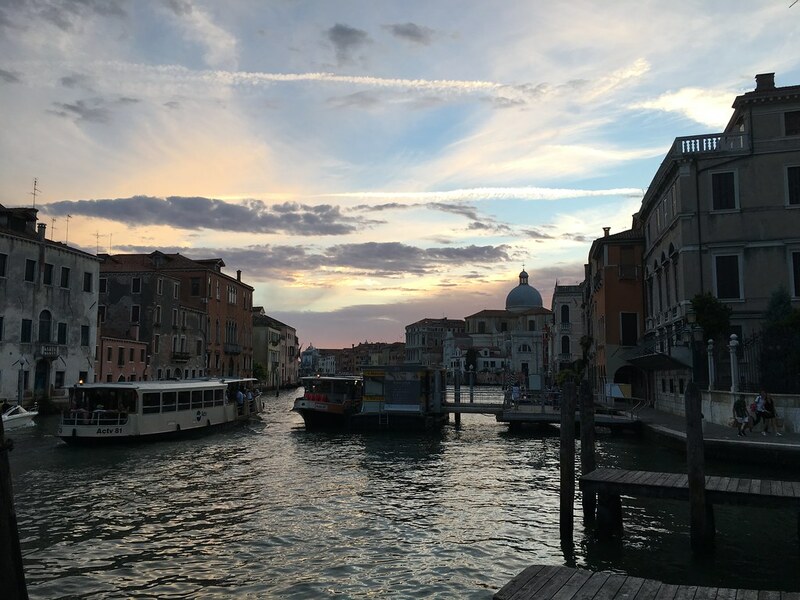 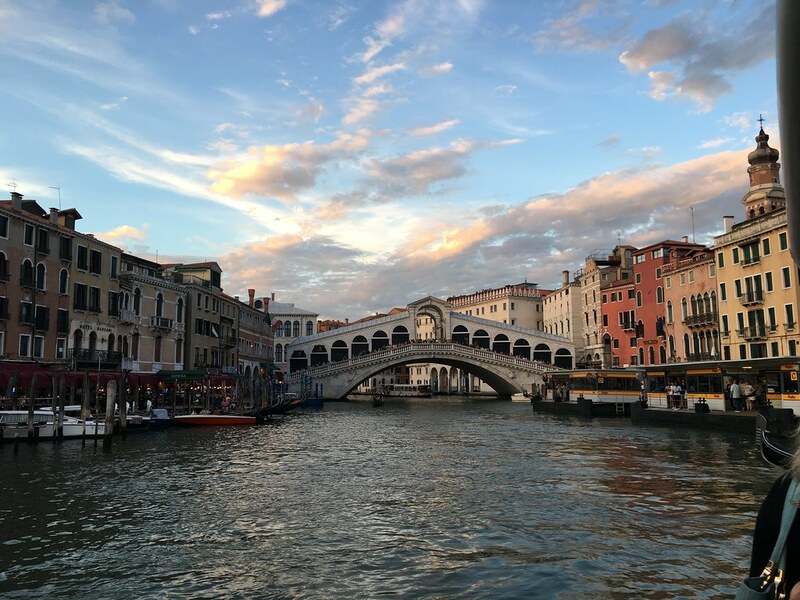 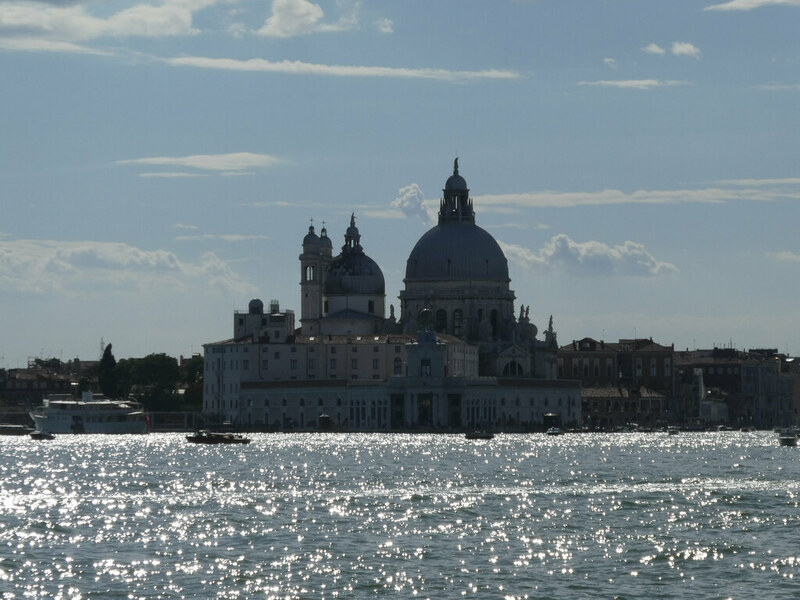 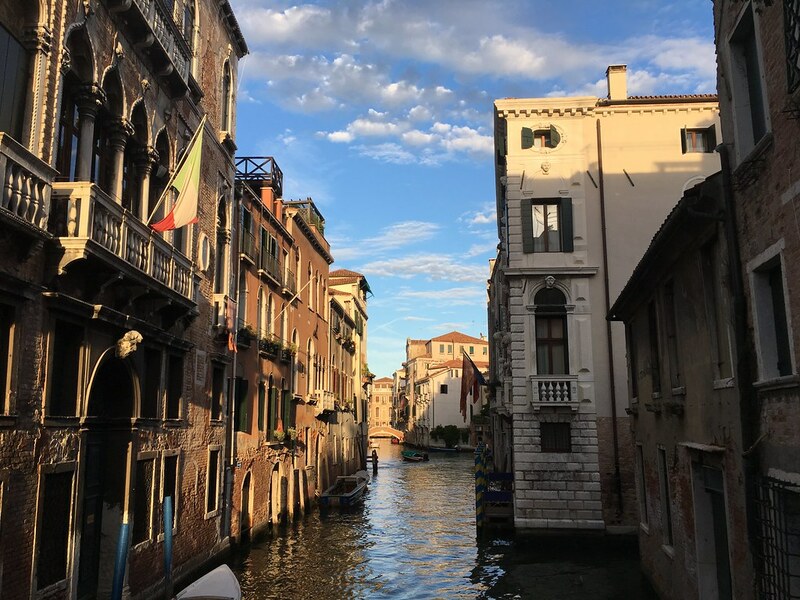 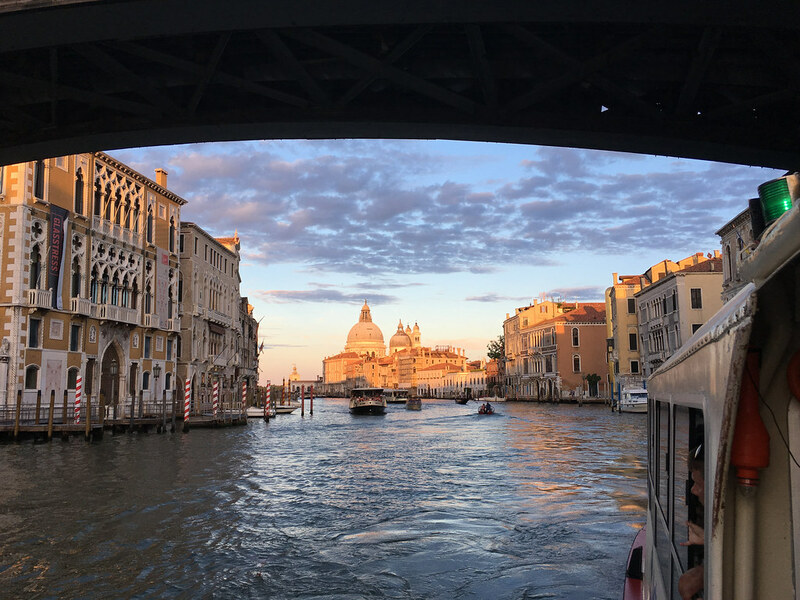 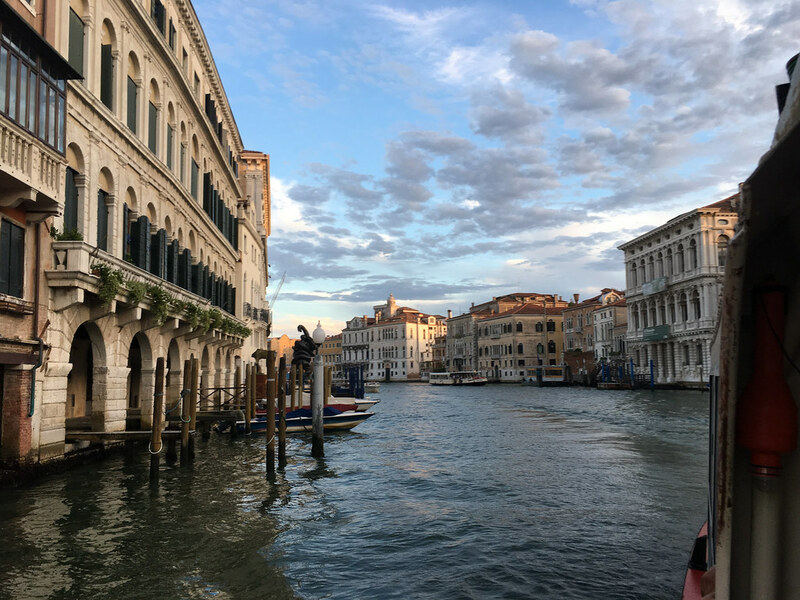 After our beach day we headed back out for an evening meal via Piazza San Marco and a Vaporetto ride along the Grand Canal. 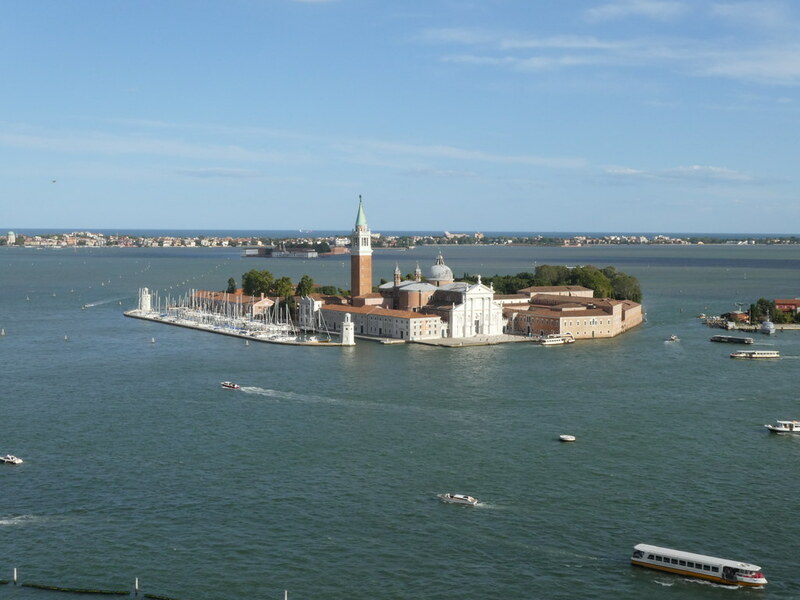 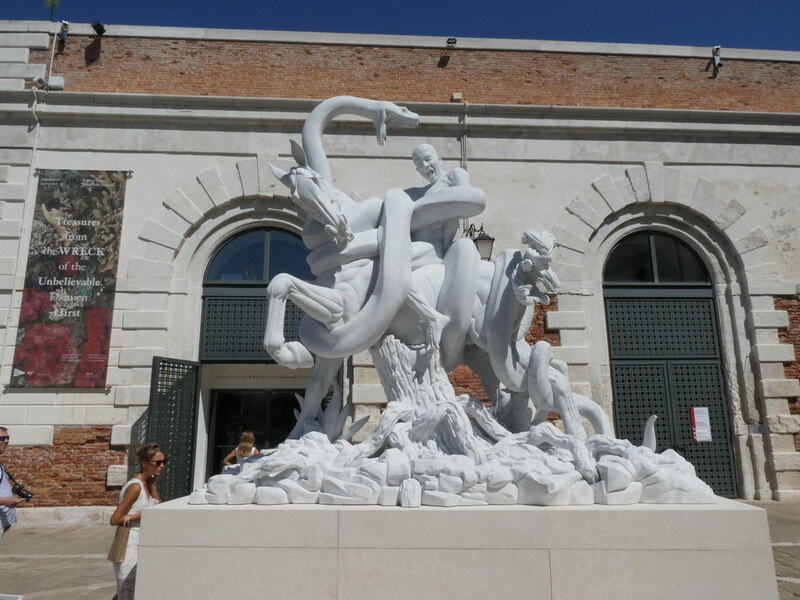 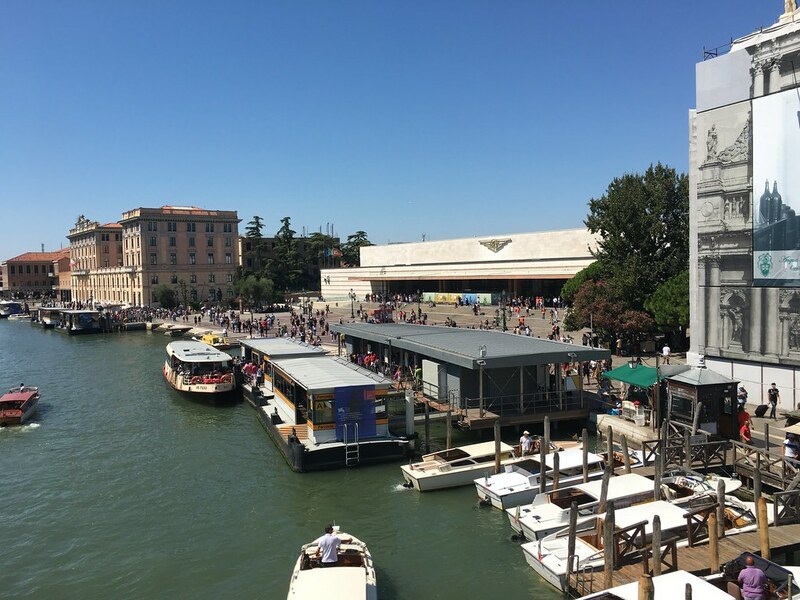 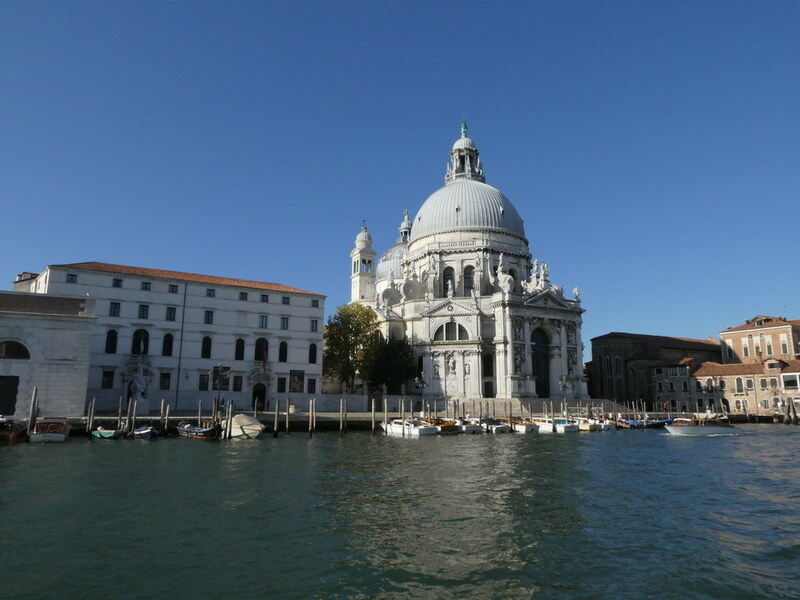 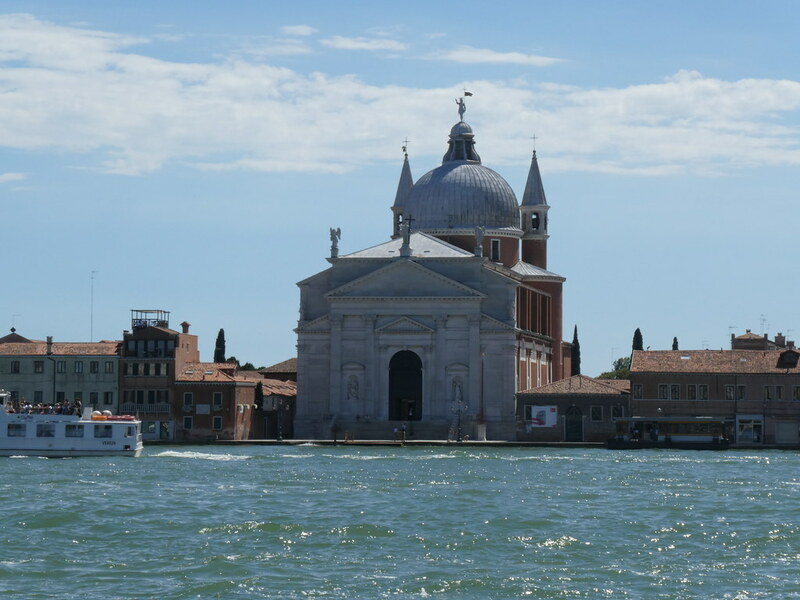 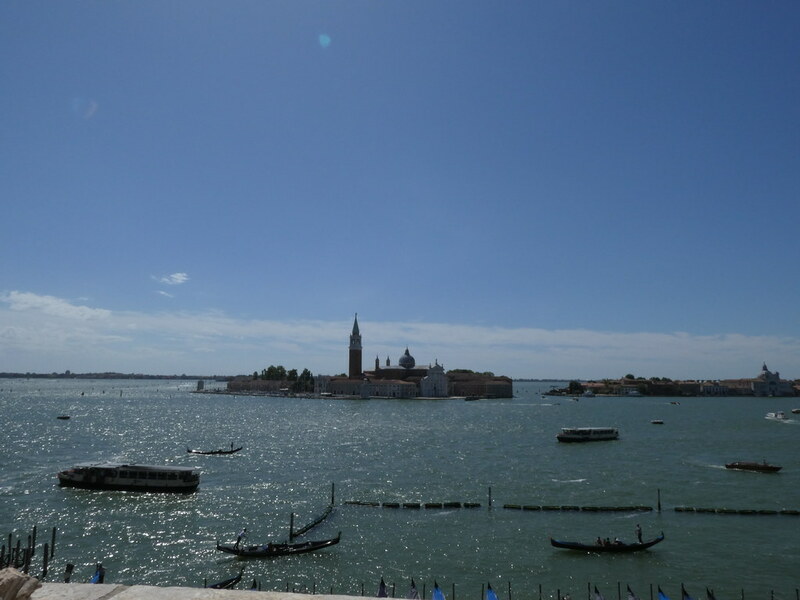 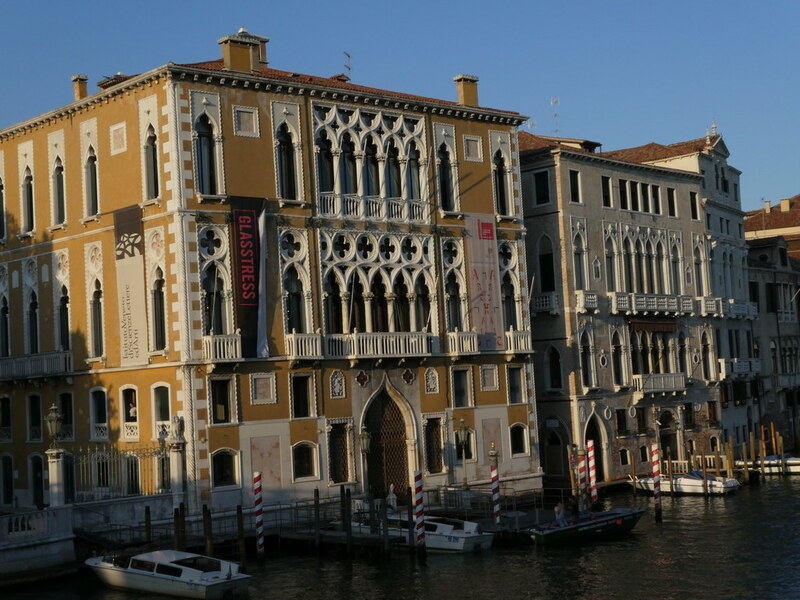 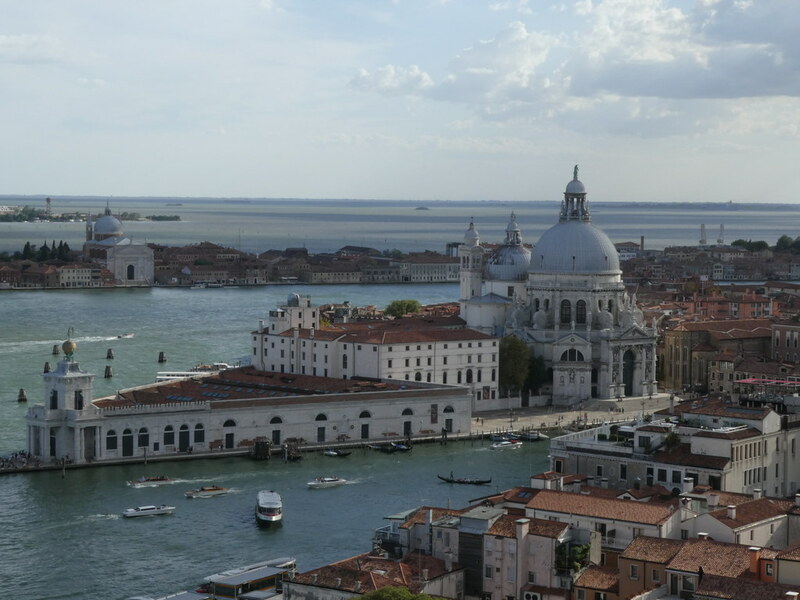 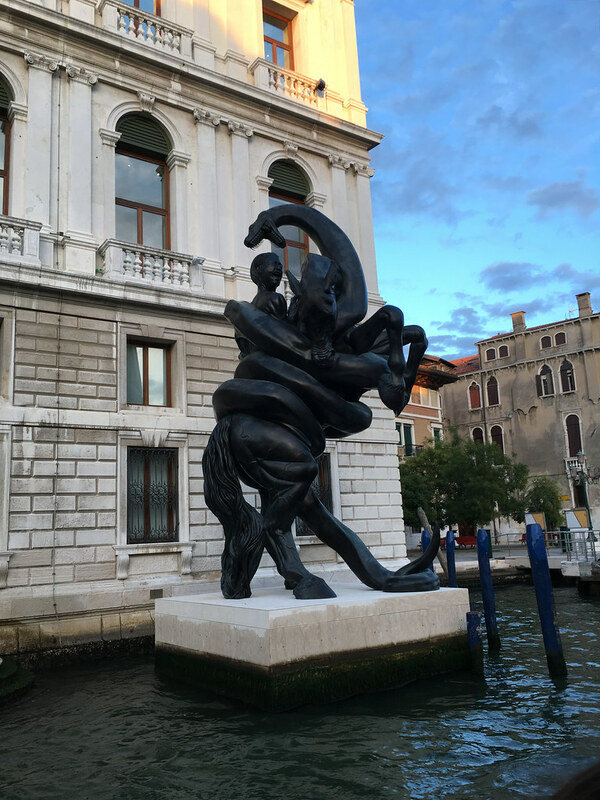 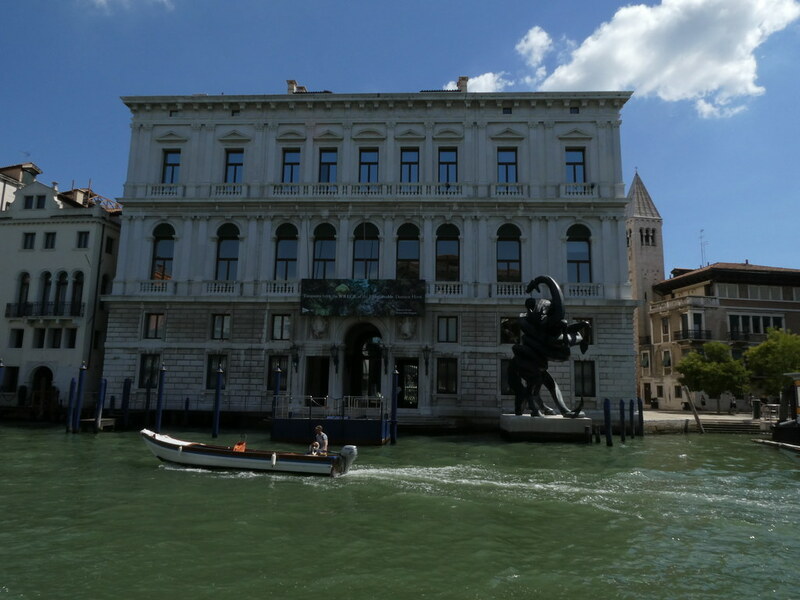 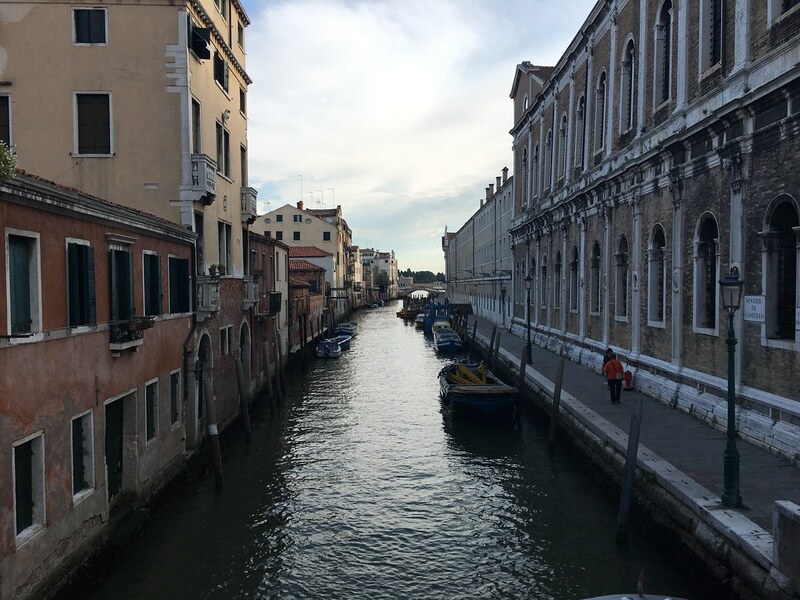 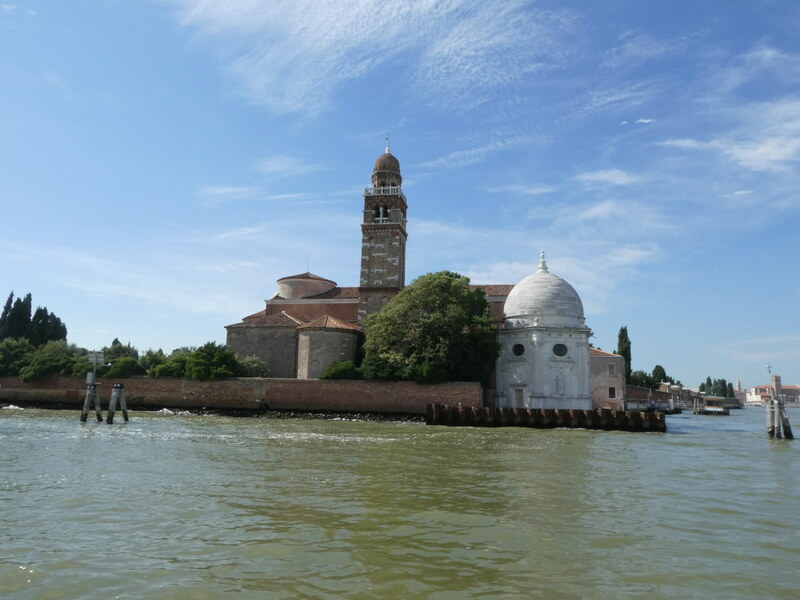 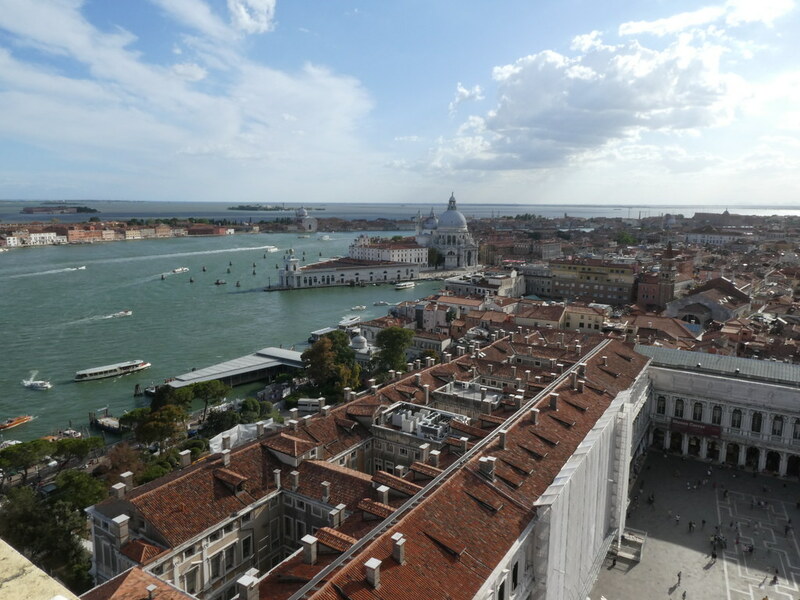 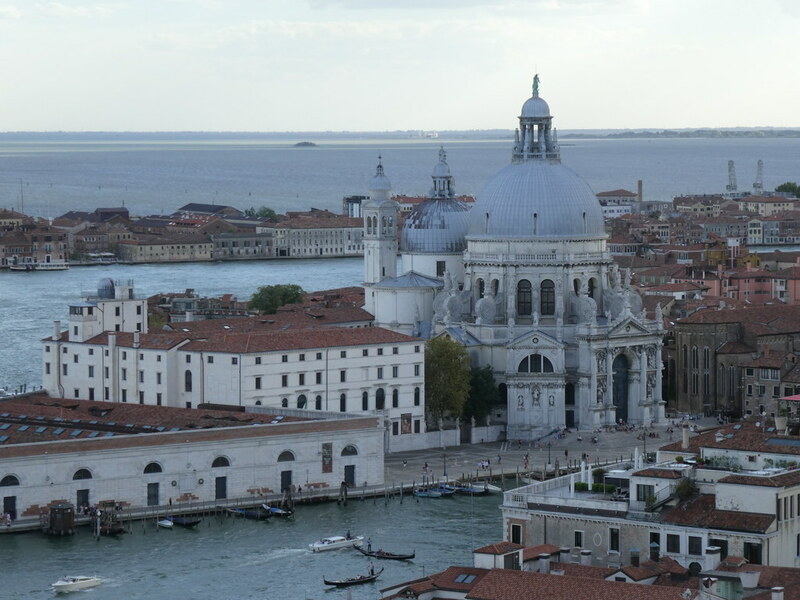 The museum of the Punta della Dogana that marks the start of the Grand Canal. 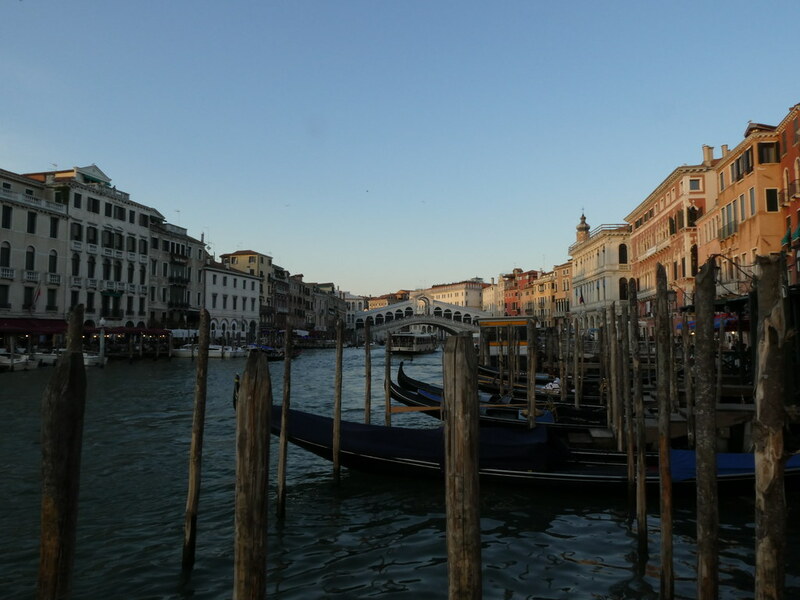 We hopped off just beyond the Rialto as it was getting pretty dark. 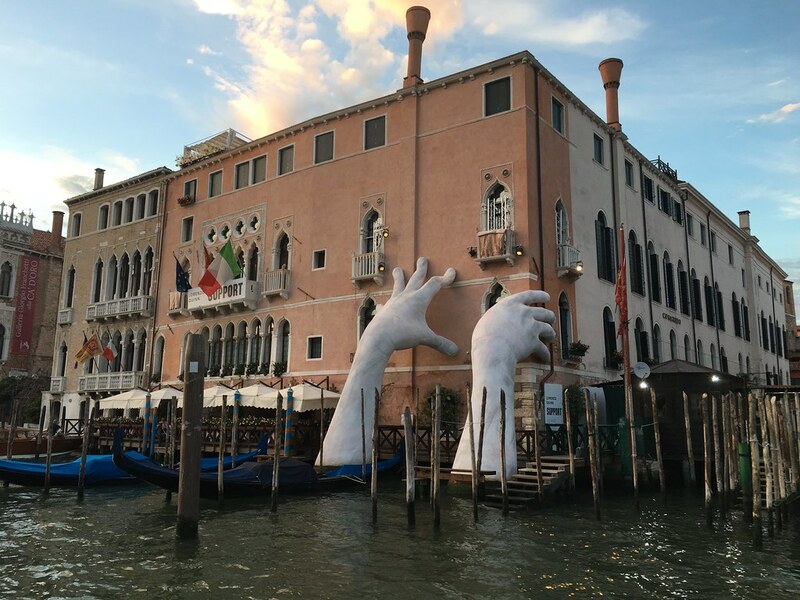 I liked these hands! 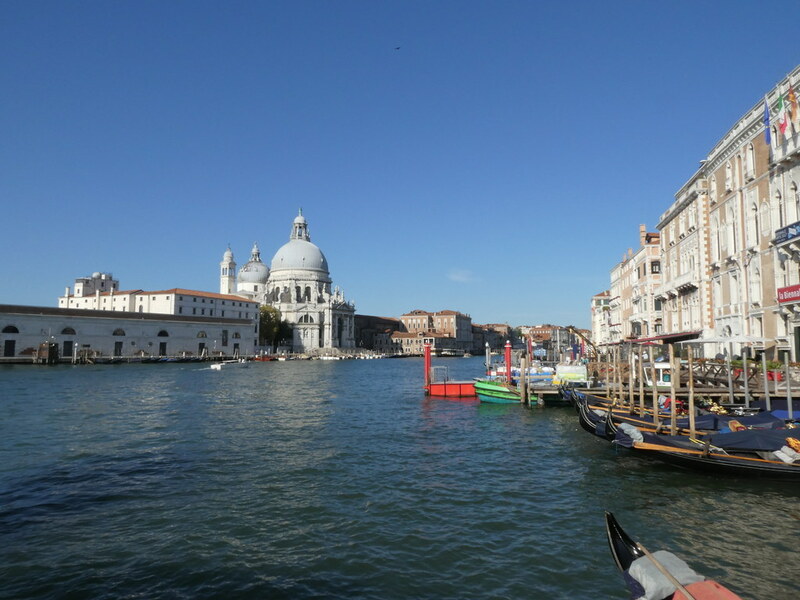 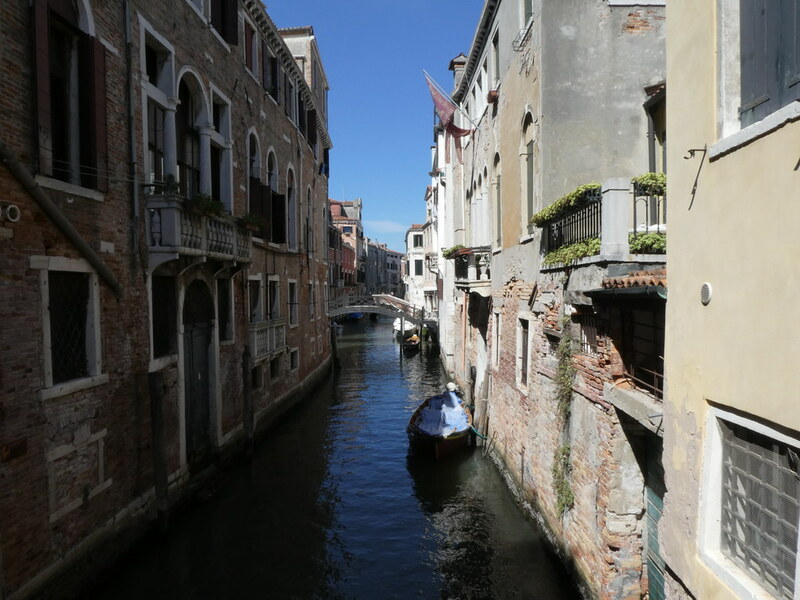 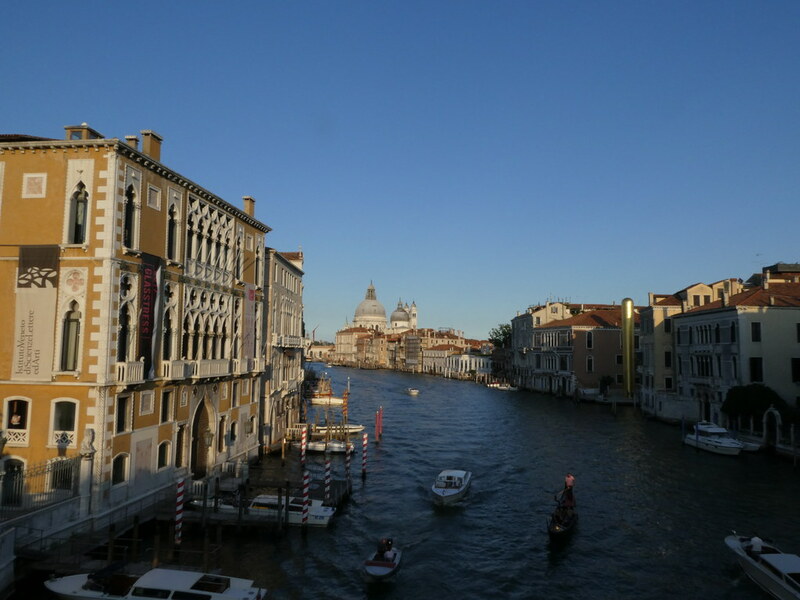 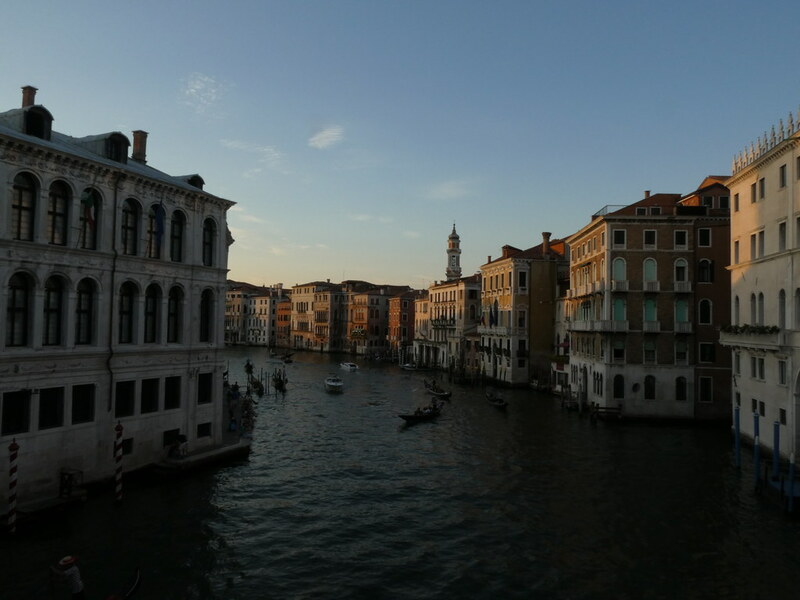 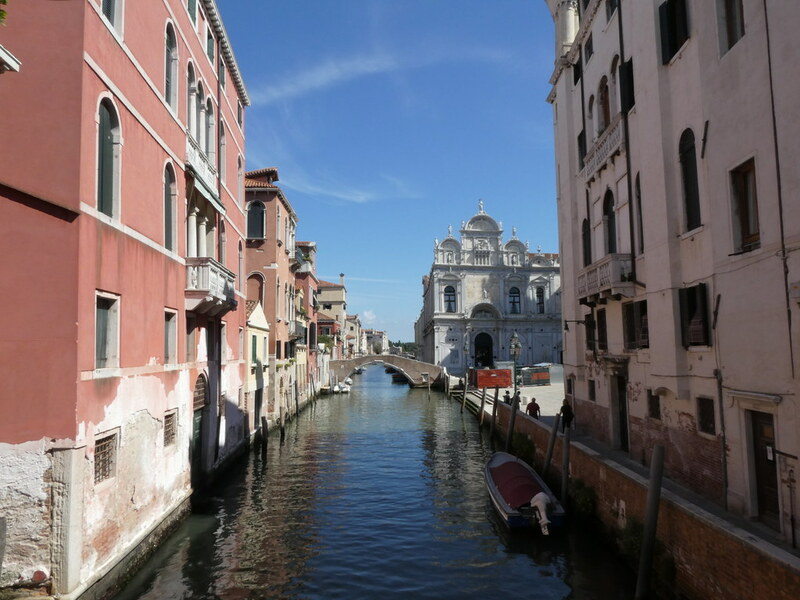 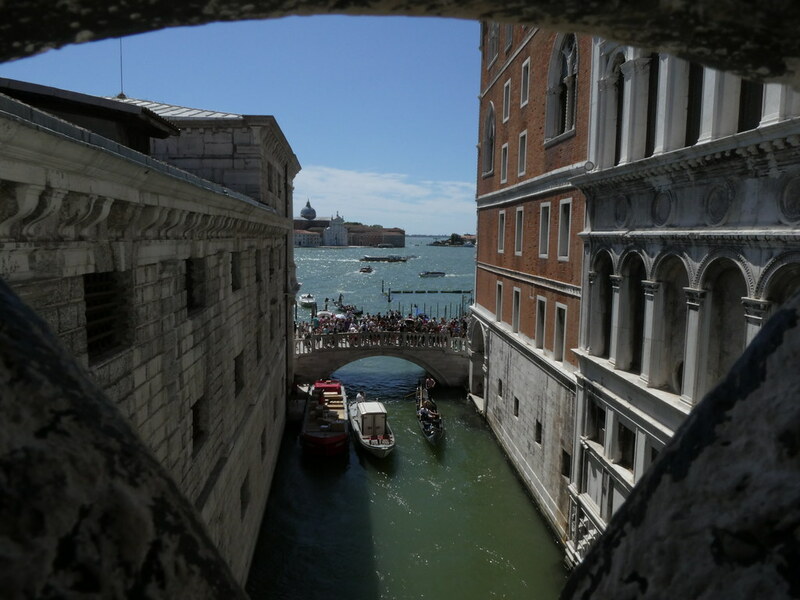 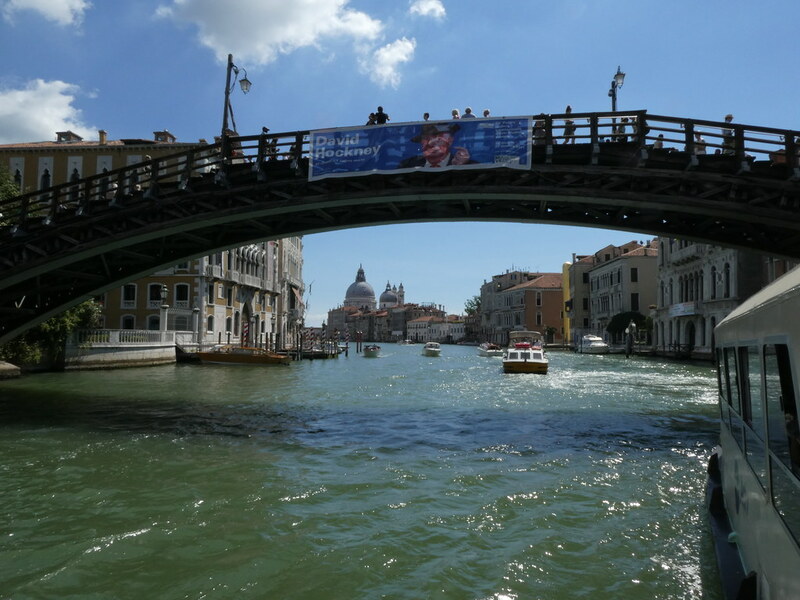 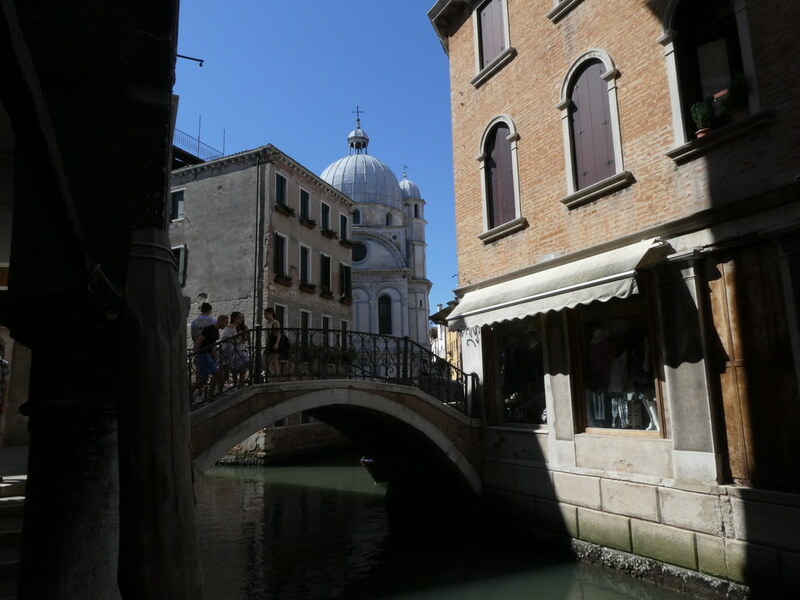 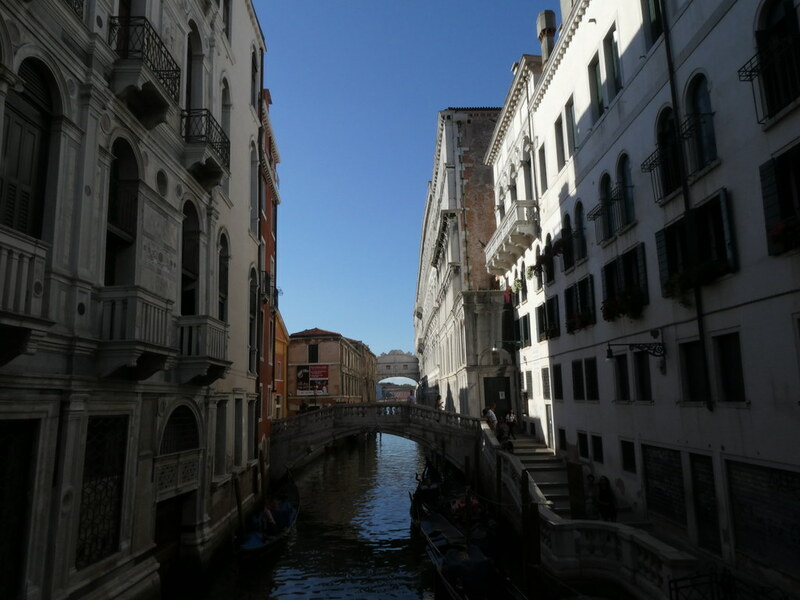 Next morning I got a bit lost on my breakfast stroll and ended up surprisingly on the Rialto. 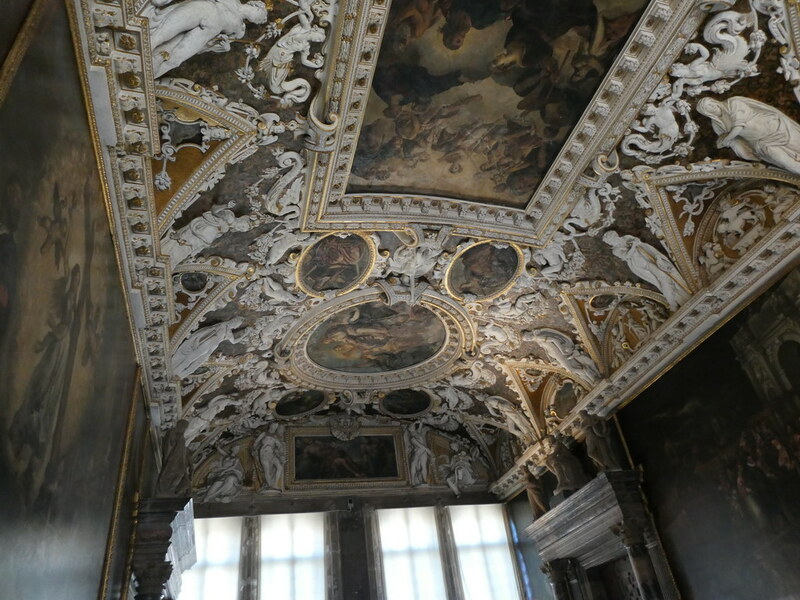 Every house seems uniquely designed and built, no two the same. 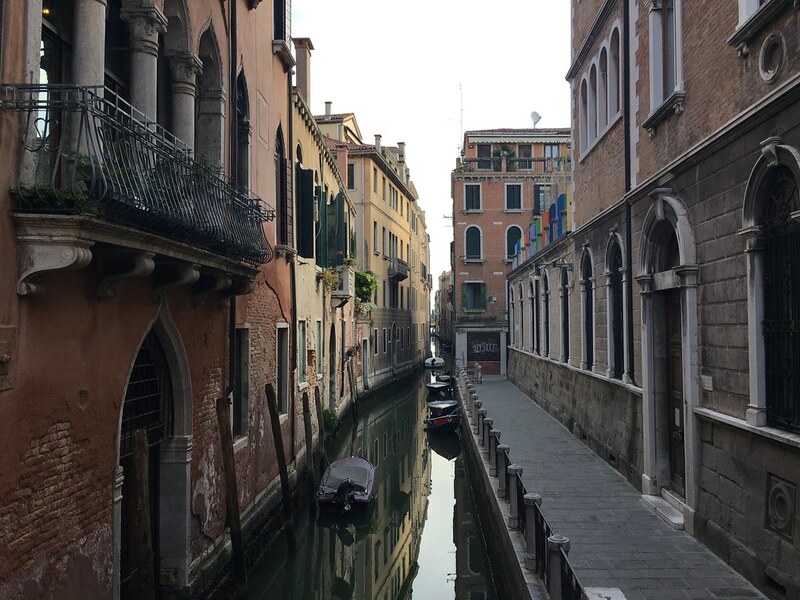 It’s a visual treat and its hard to know where to look. 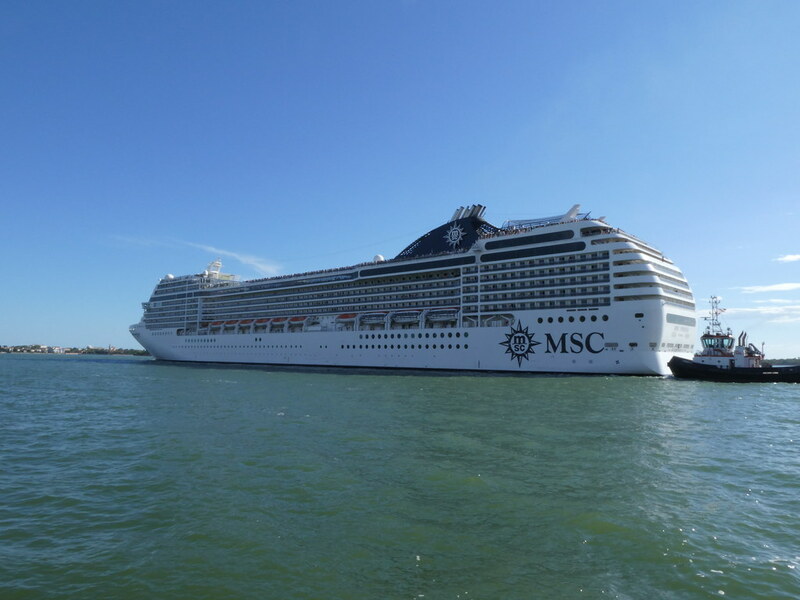 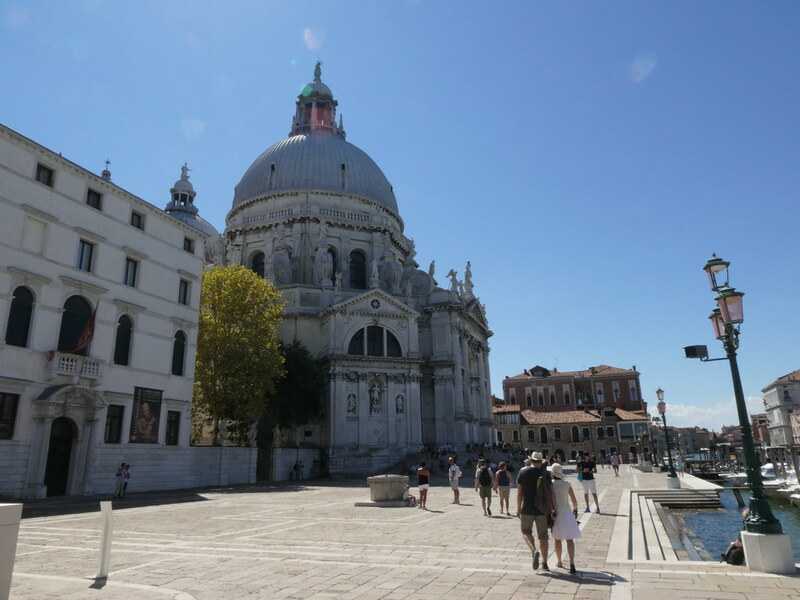 My one regret is that I didn’t find time to take a trip along and back the full length from San Marco to the station with a map and audio guide. 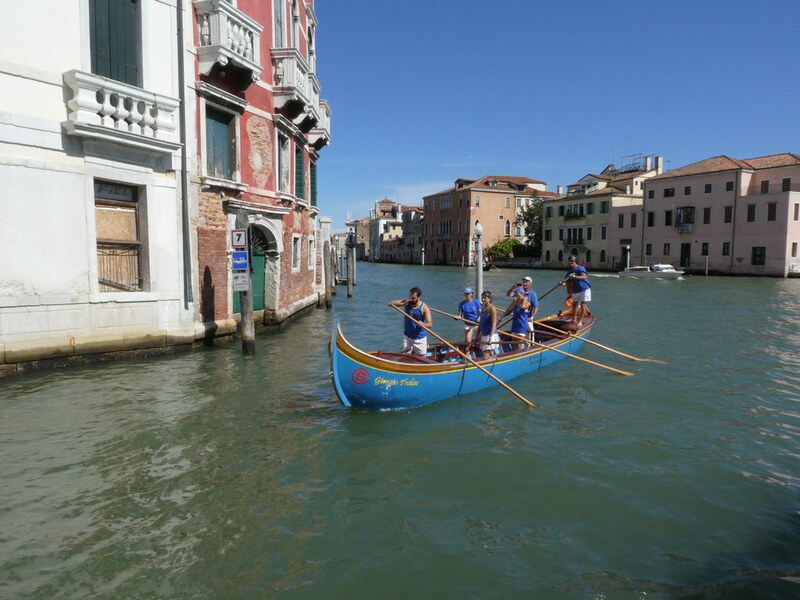 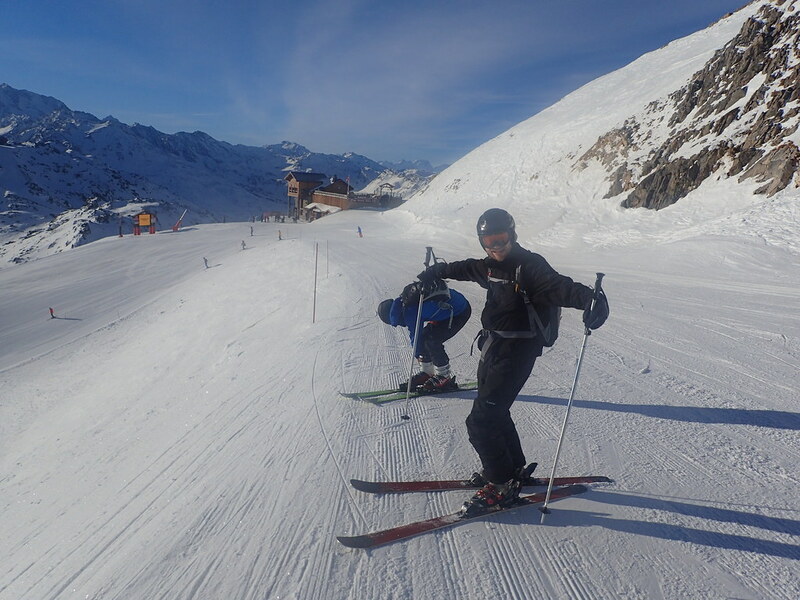 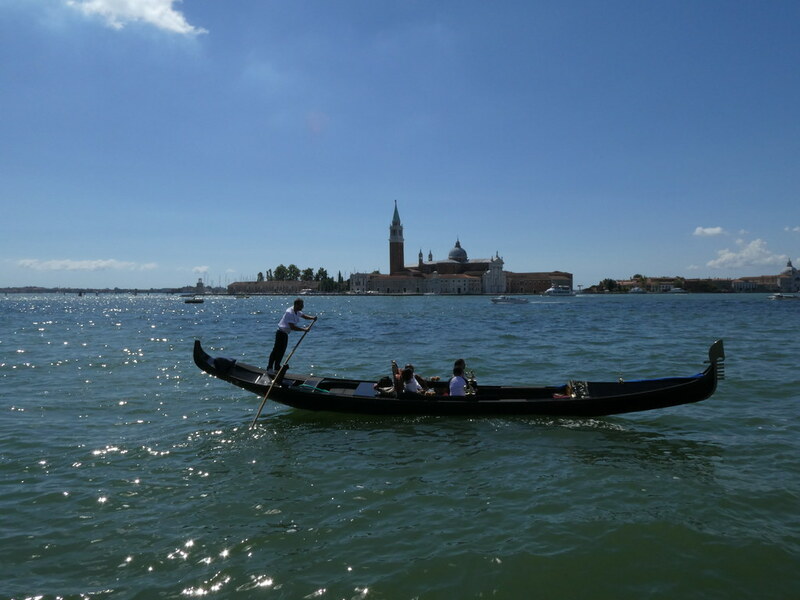 Gondolas earning their 80 Euros! 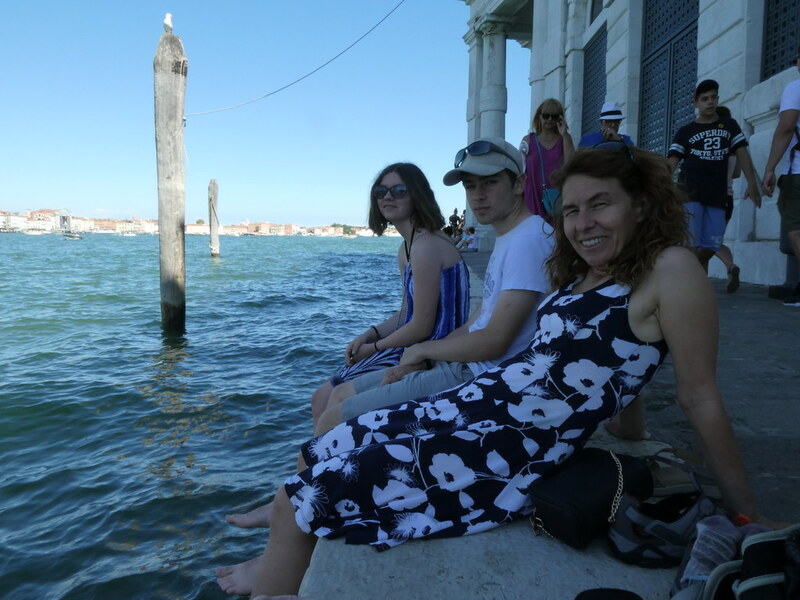 I should have taken more video. 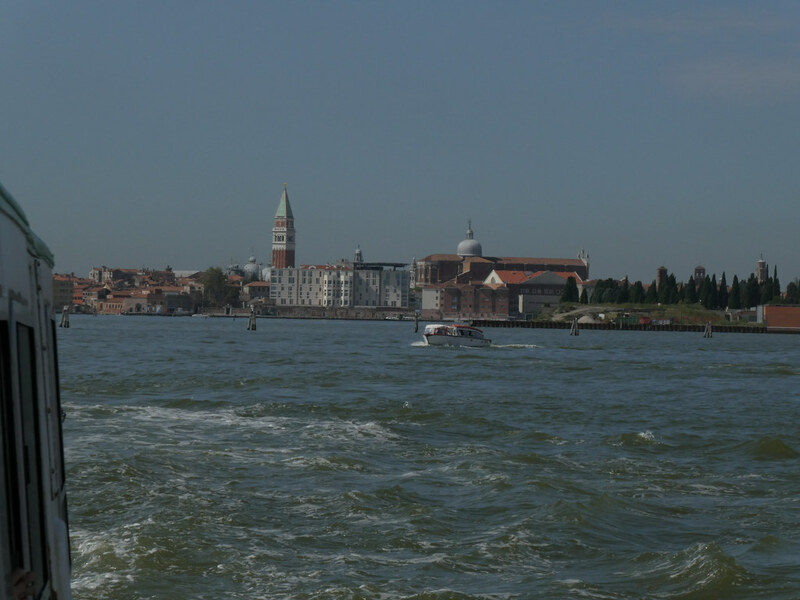 Most of my other small cameras have always taken pretty poor video so I don’t take much. 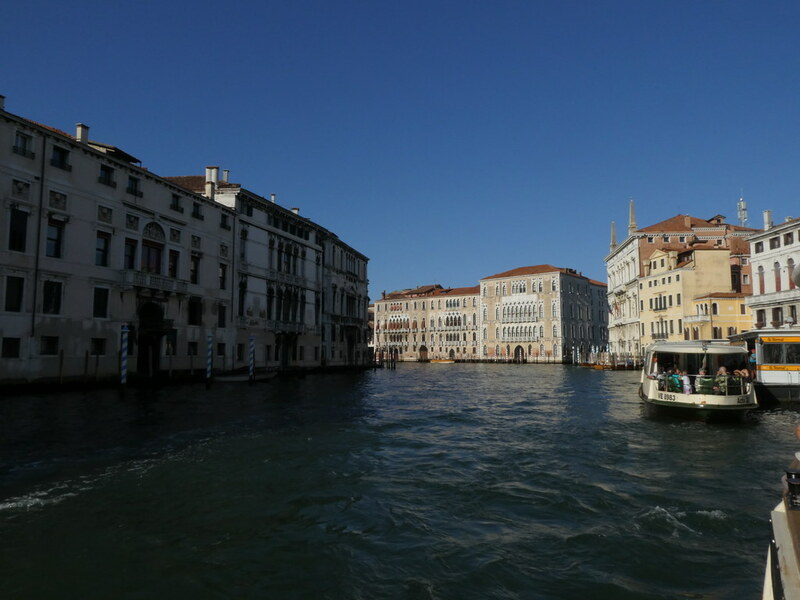 My new camera takes excellent video so it was a bit of shame I didn’t use it more. 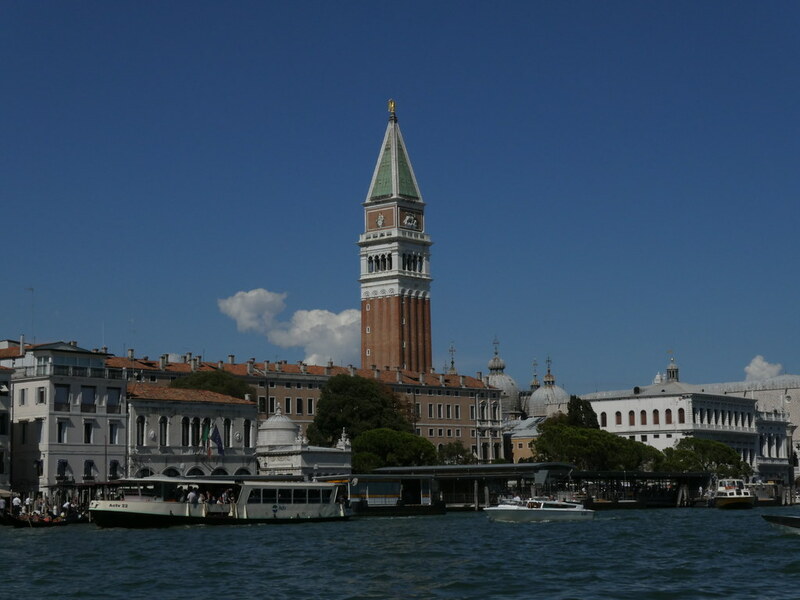 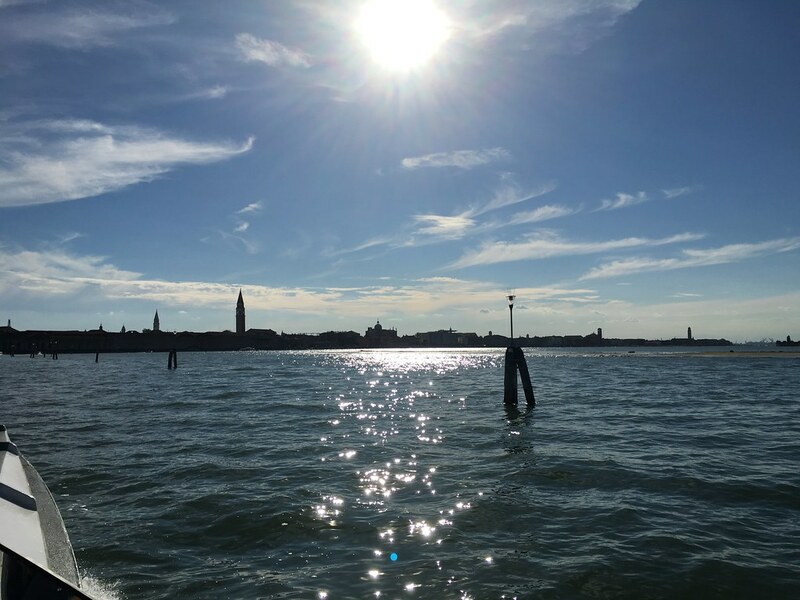 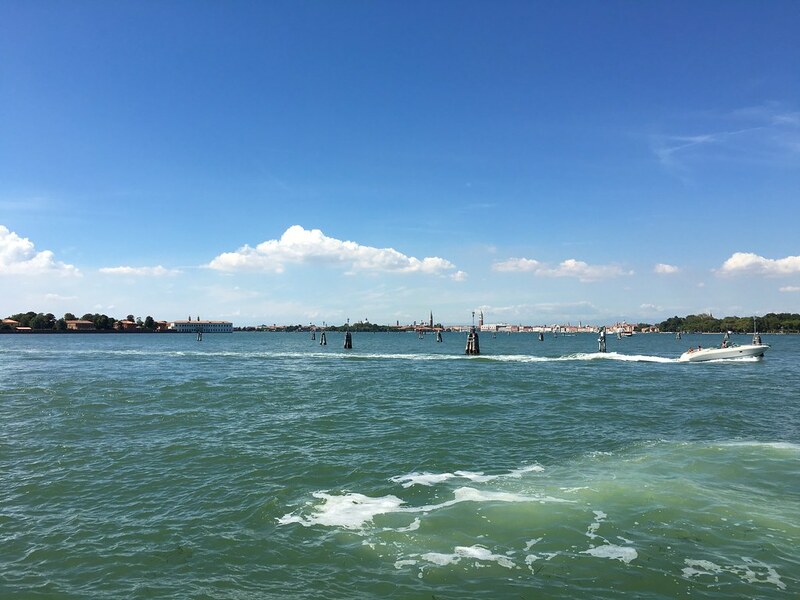 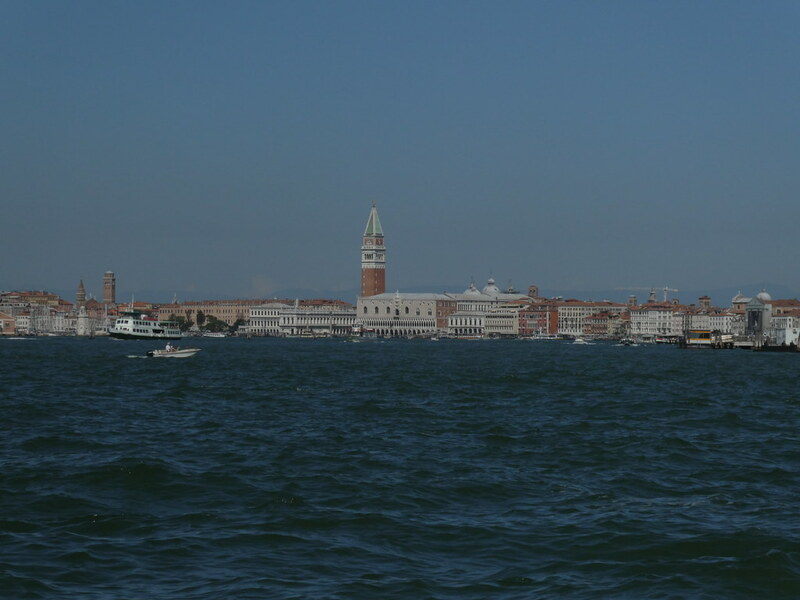 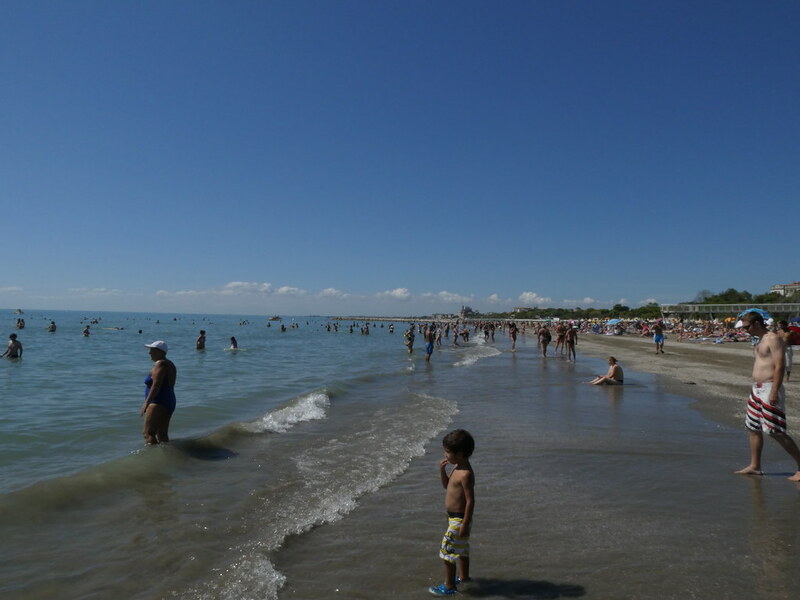 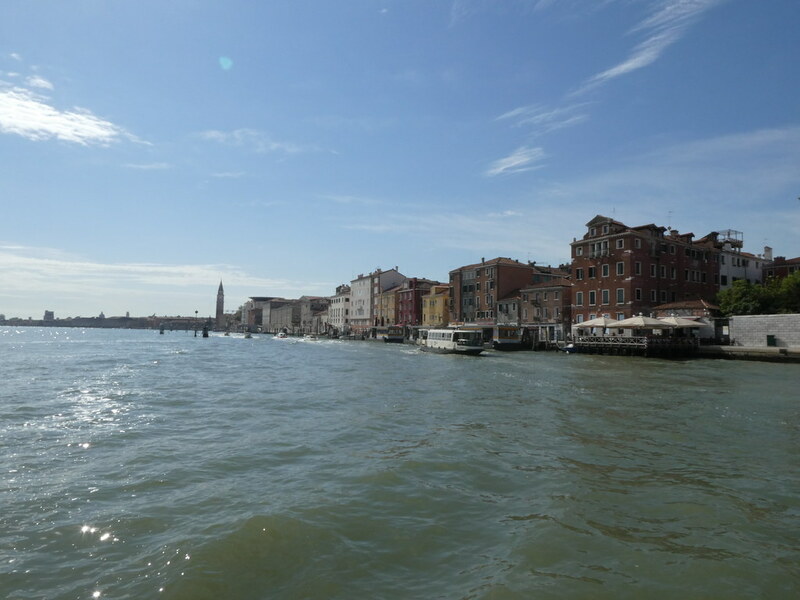 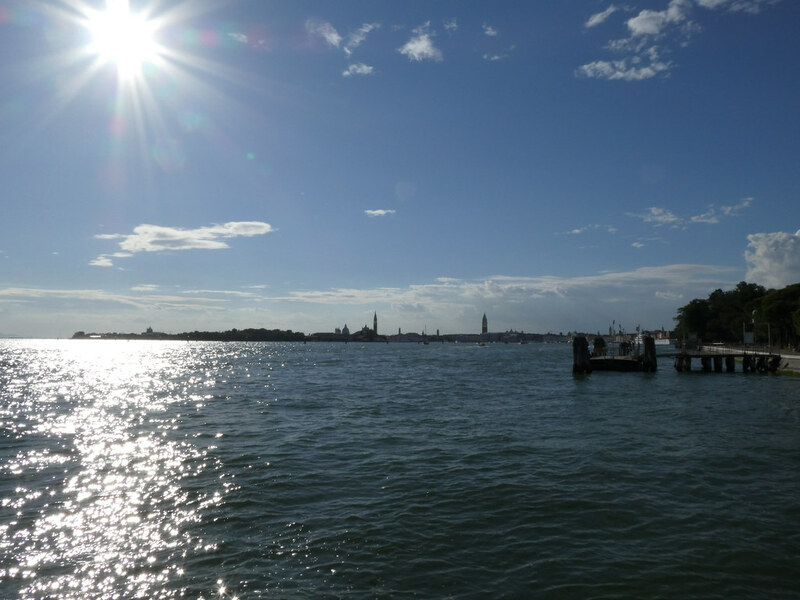 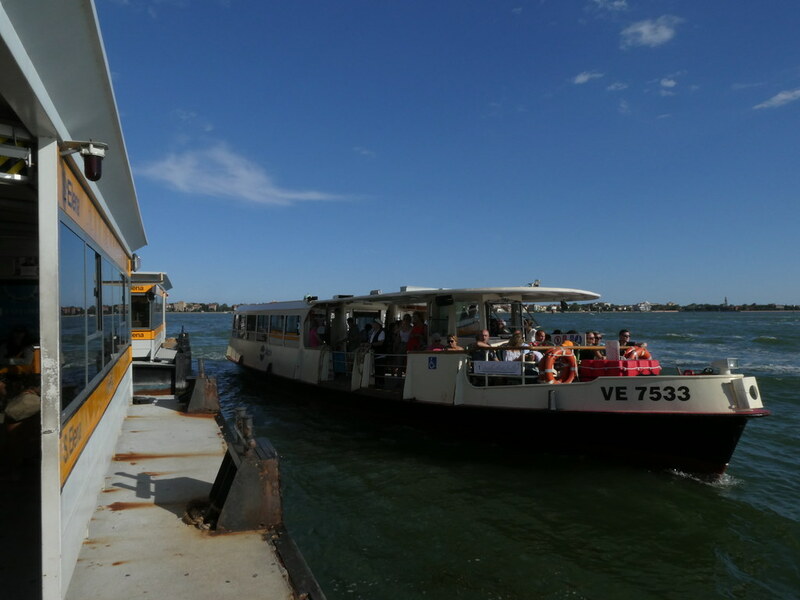 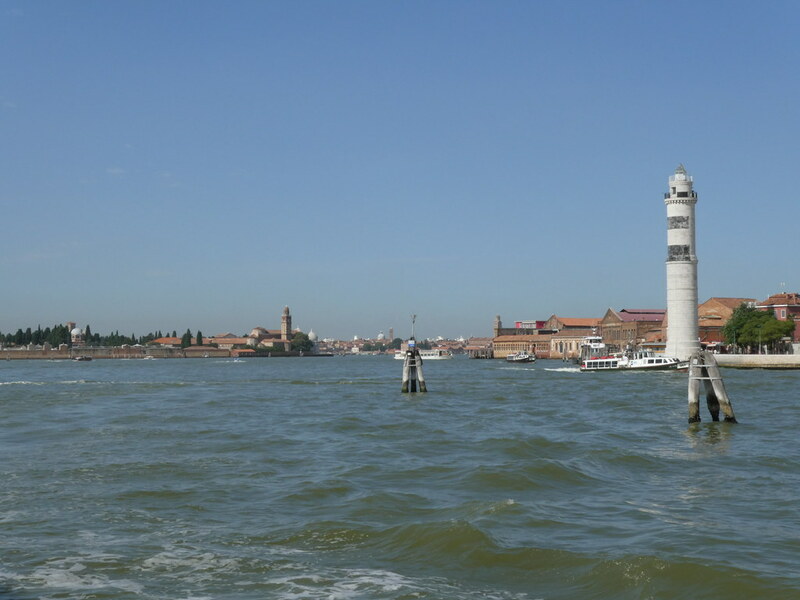 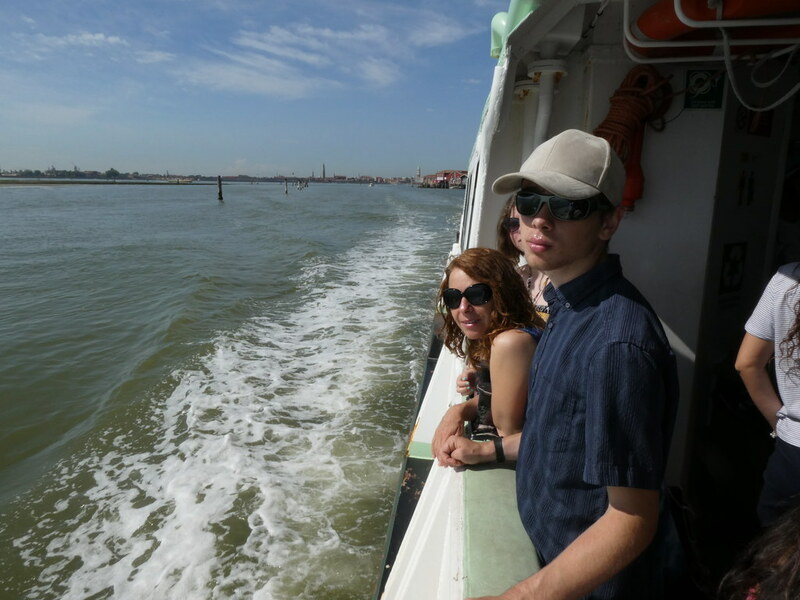 With bags packed with towels and beach rugs we were off on the Vaporetto to the Lido, the island that separates Venice from the Adriatic. 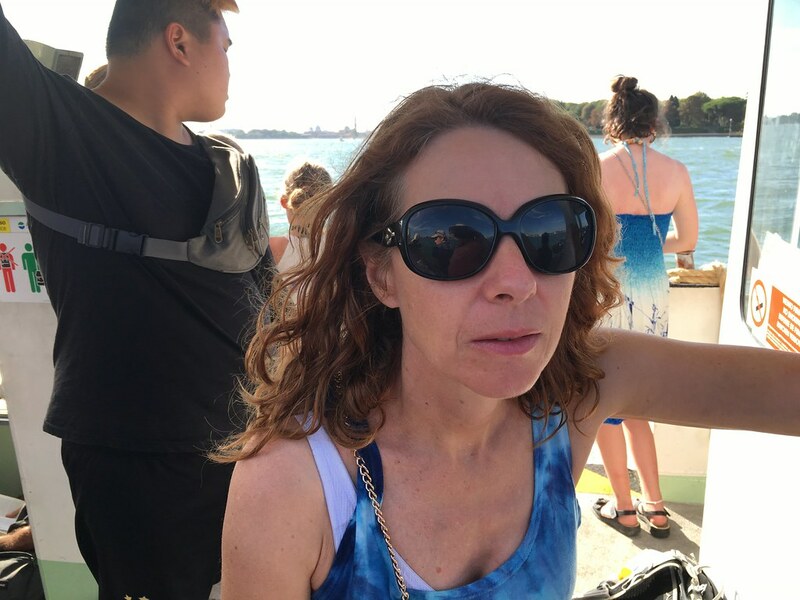 As always the boat ride was a delight. 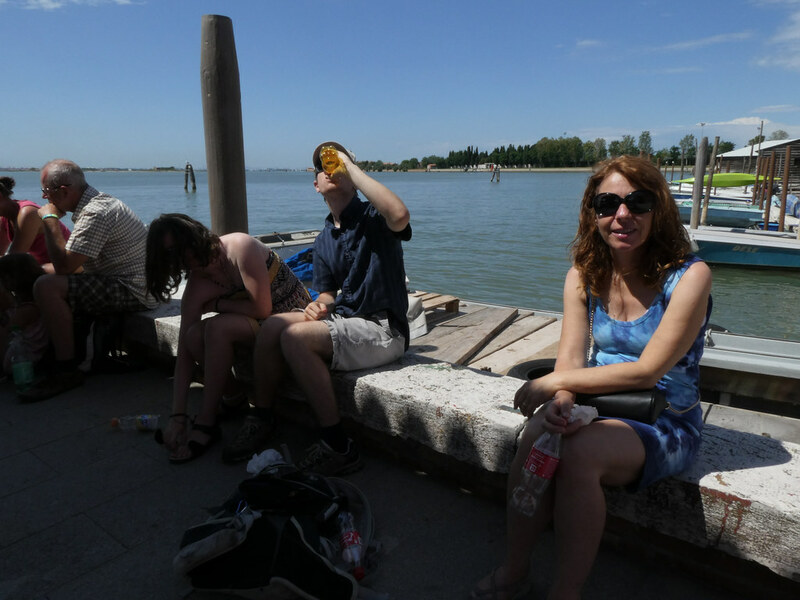 Sitting on a beach for a couple of hours is hungry and more importantly thirsty work. 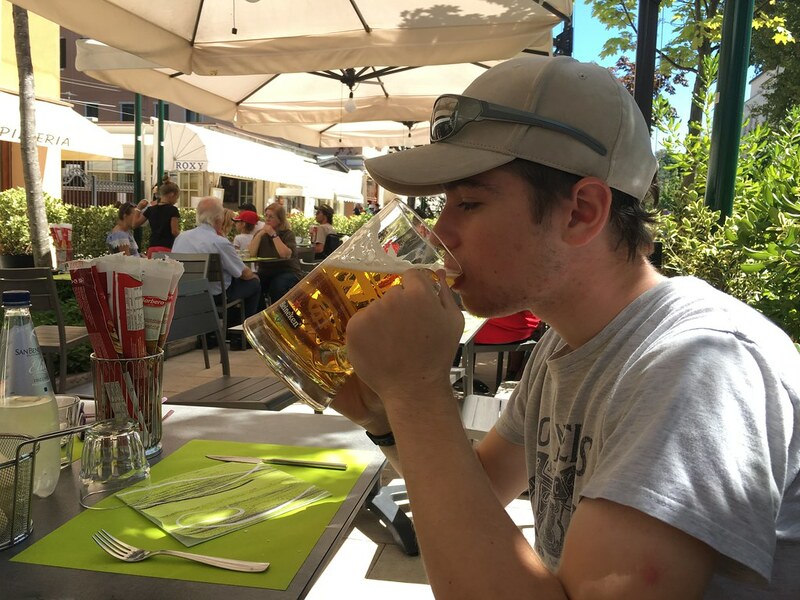 We decided we needed a large beer and we certainly got one! 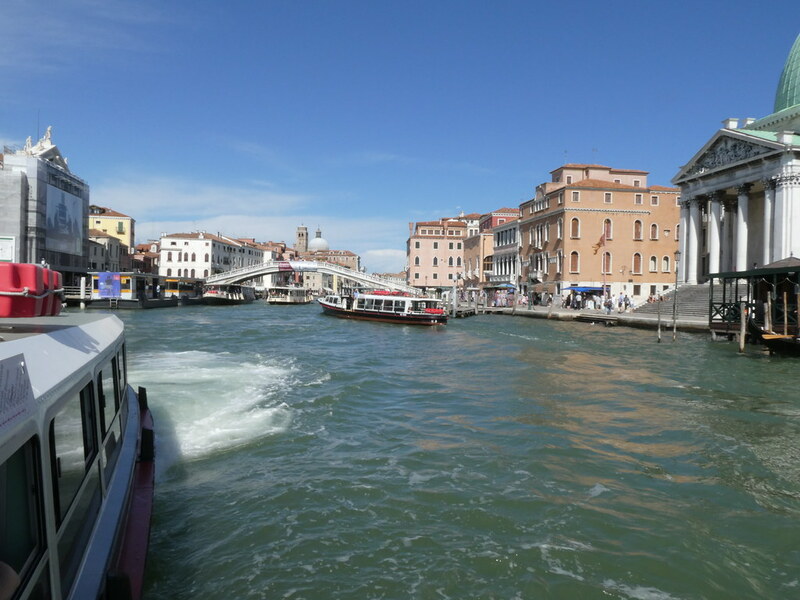 Our Vaporetto tickets also covered the buses on the Lido so we decided to take a ride. 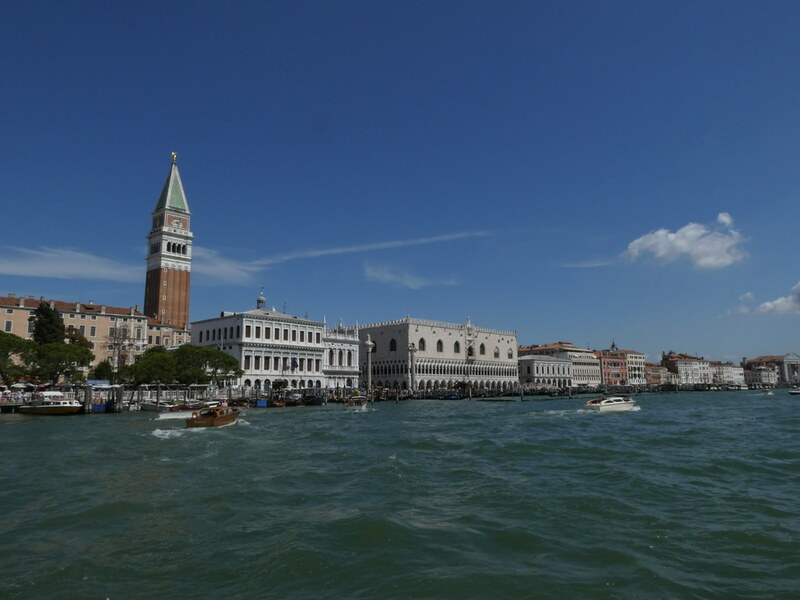 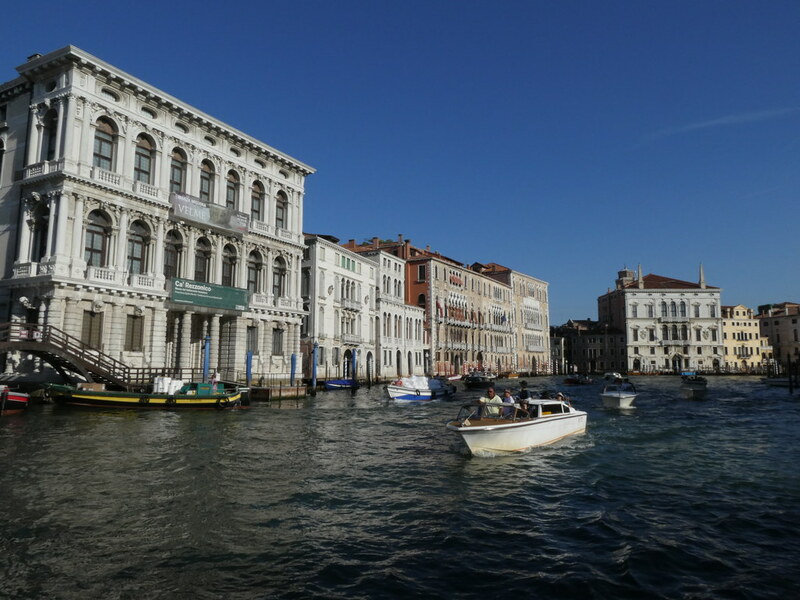 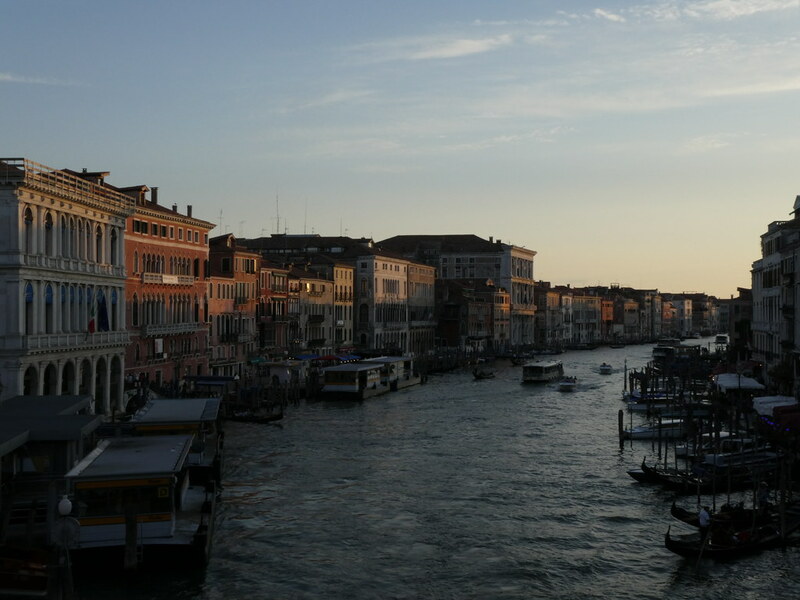 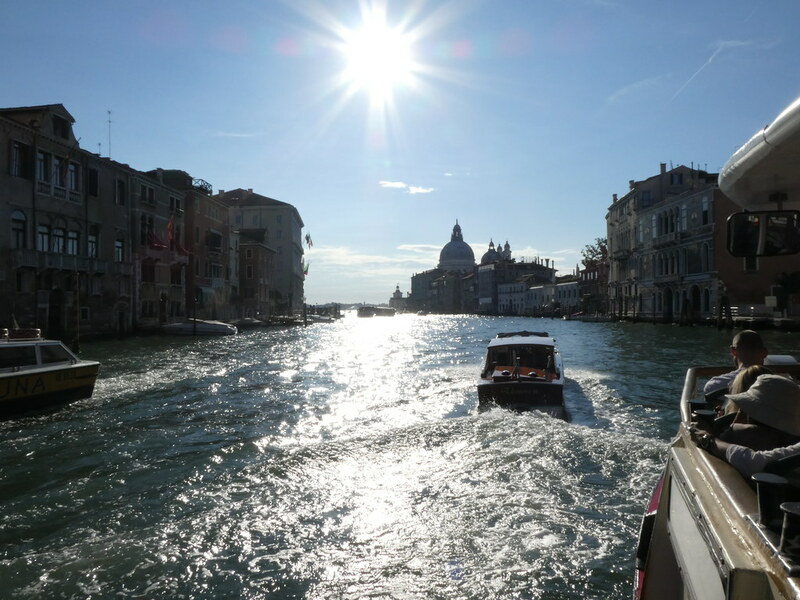 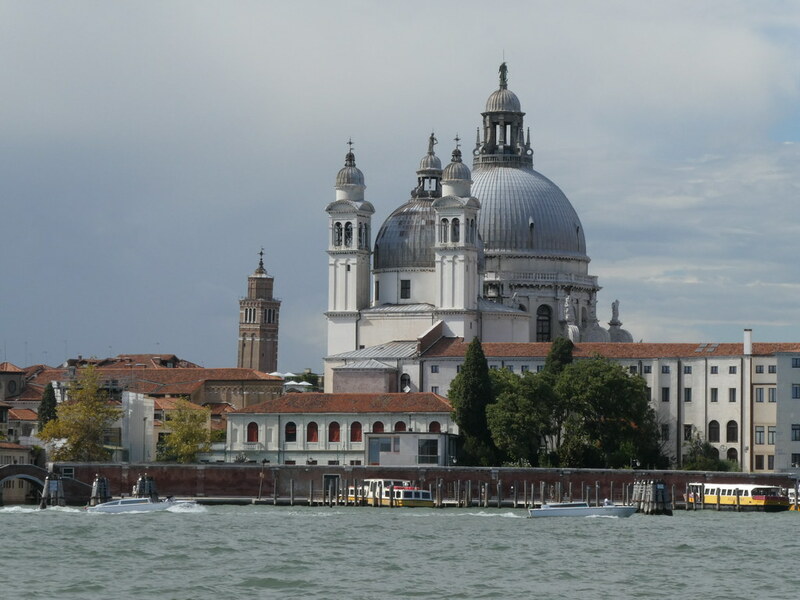 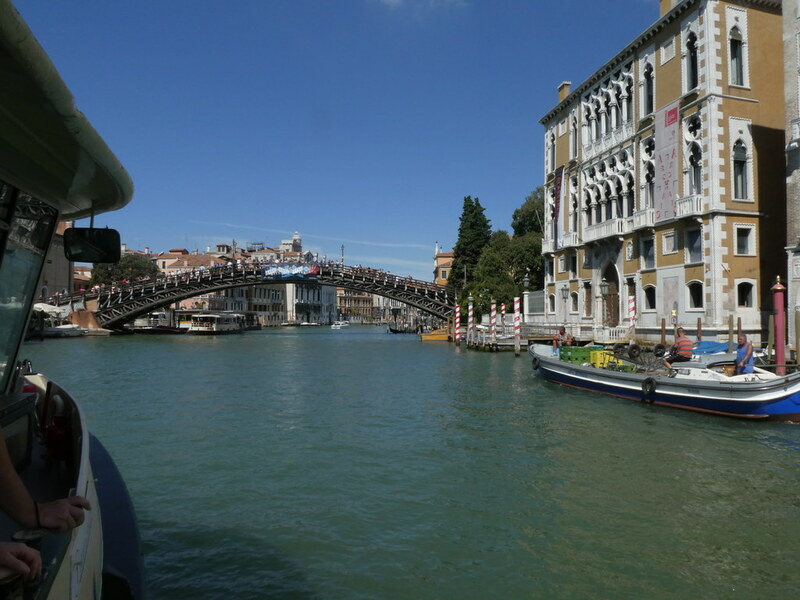 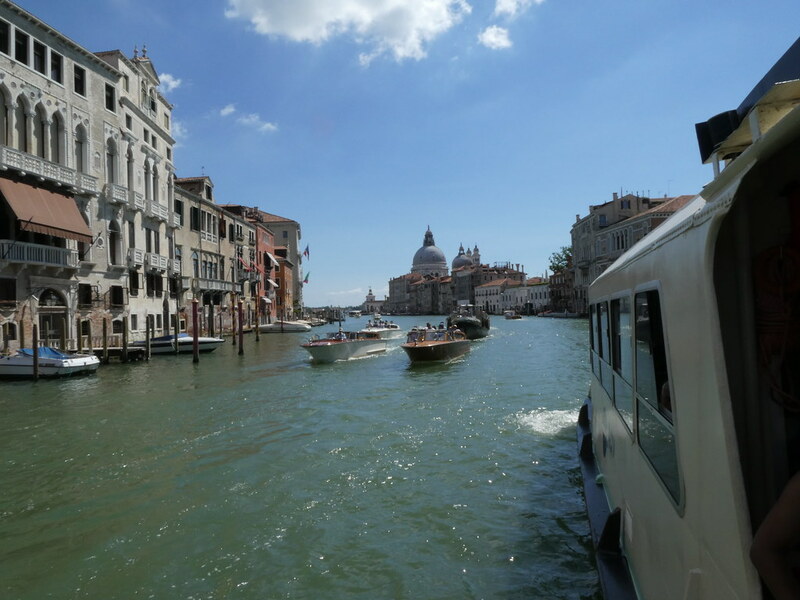 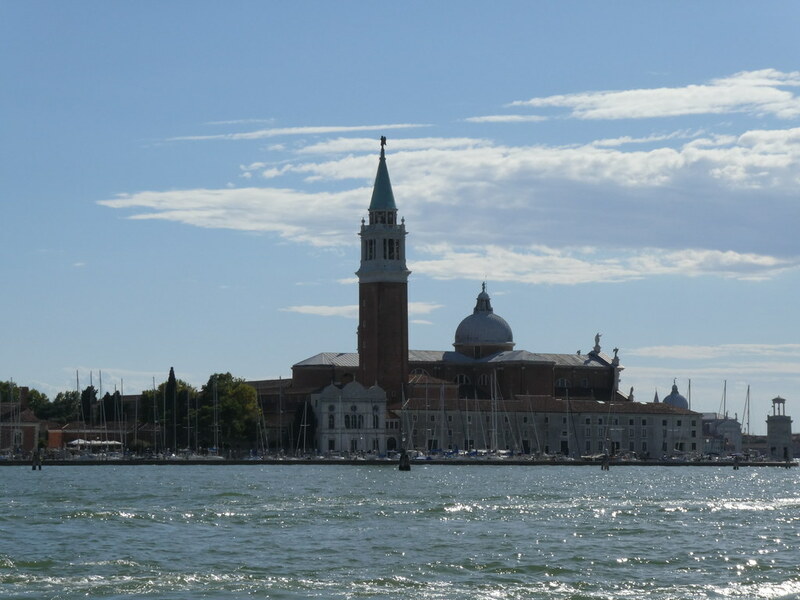 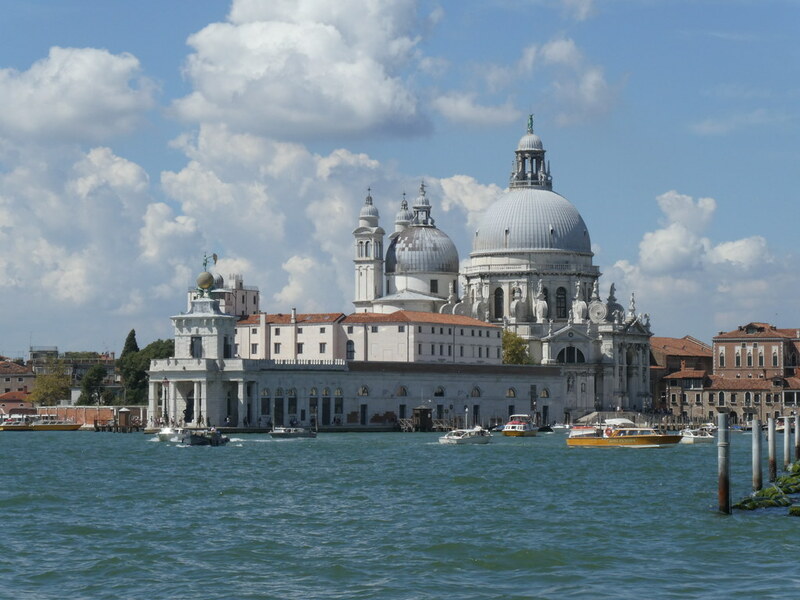 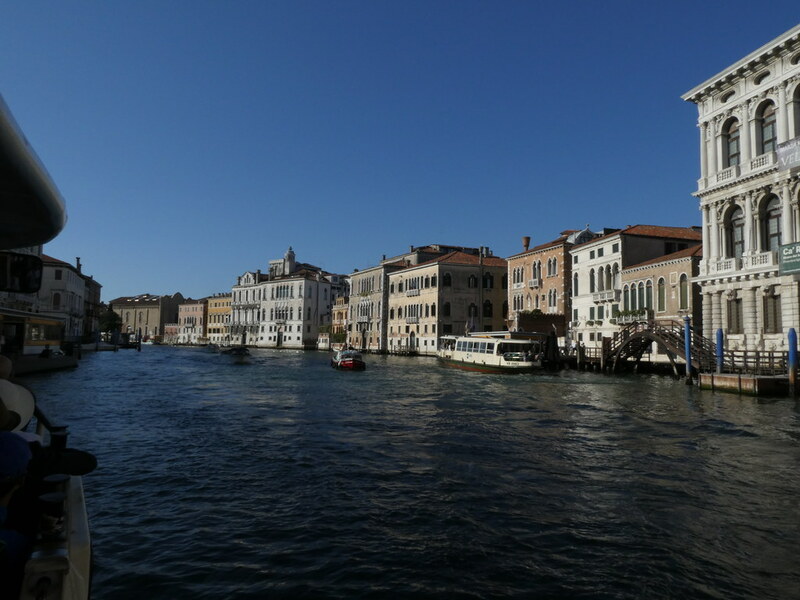 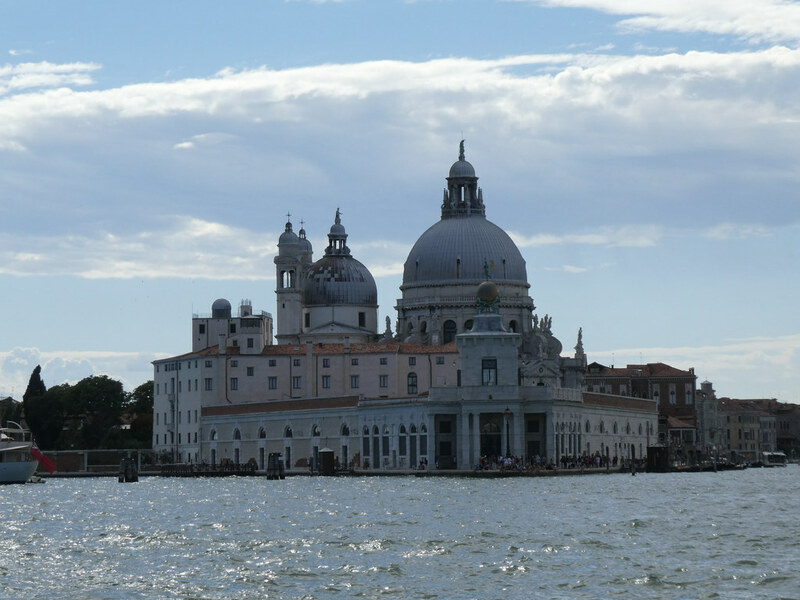 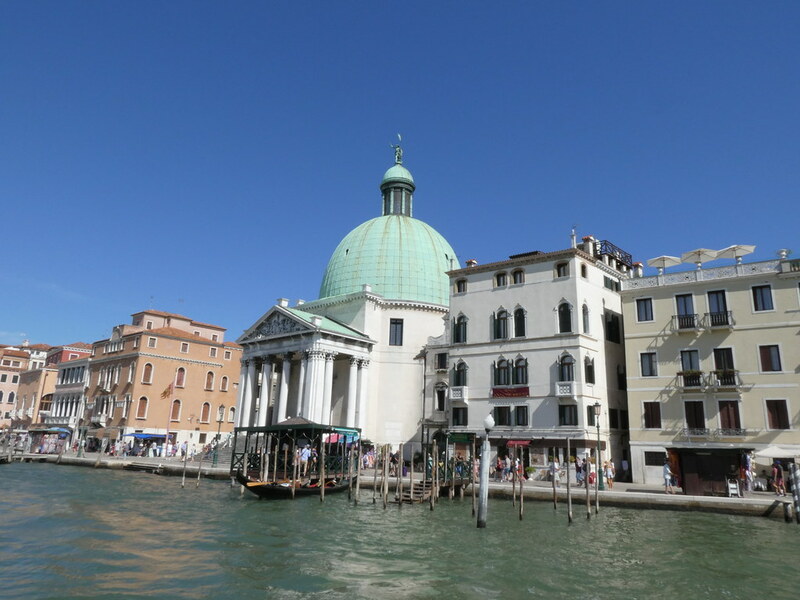 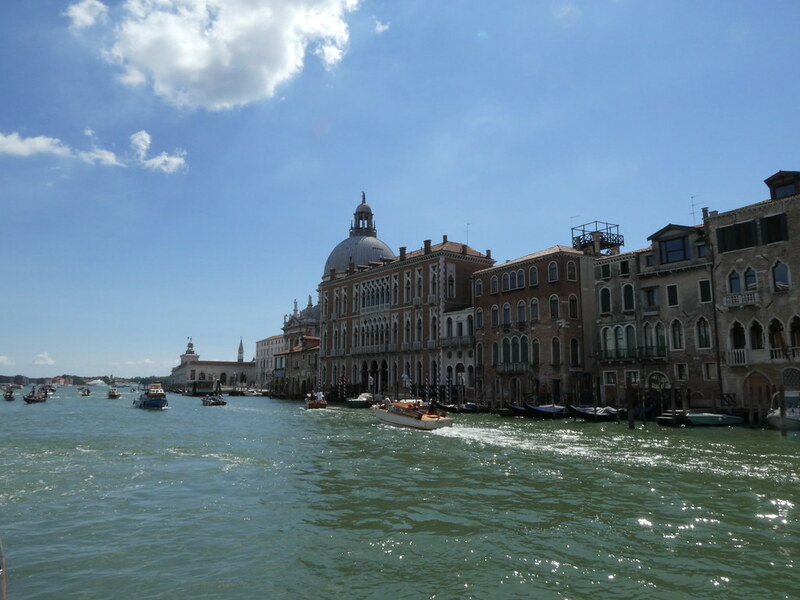 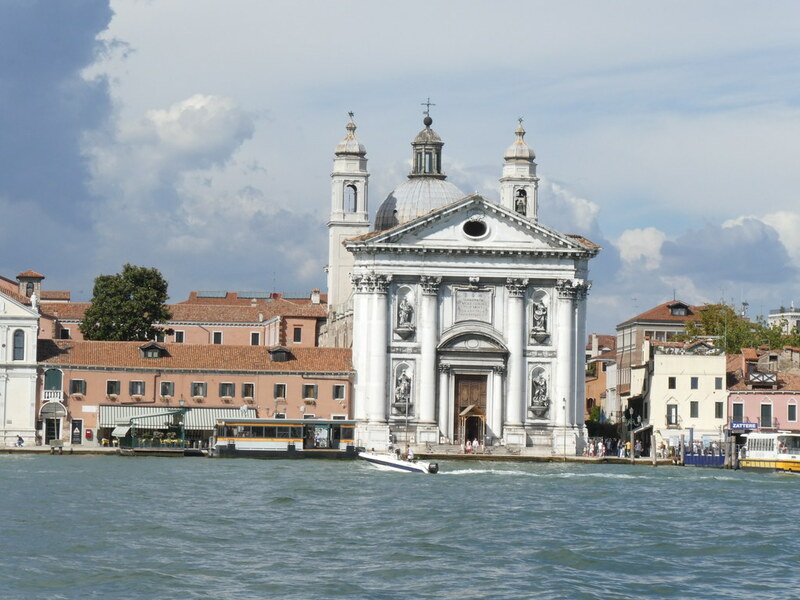 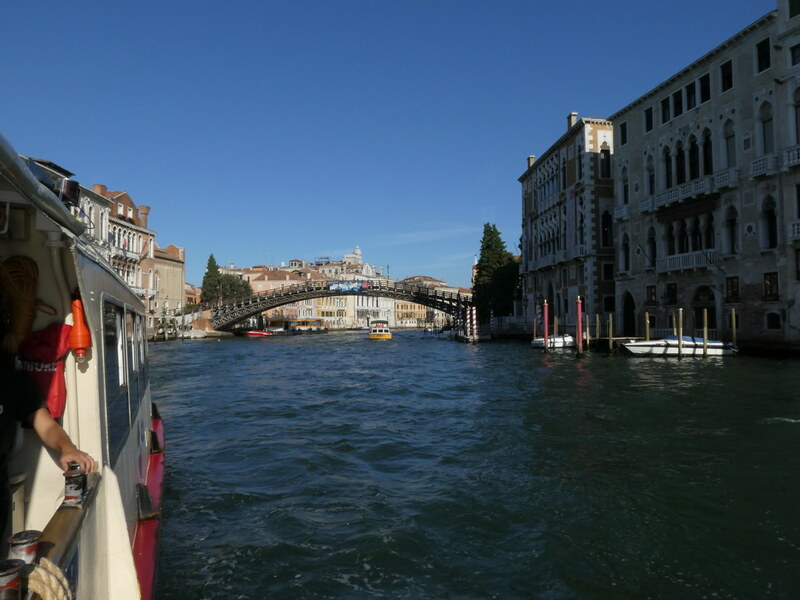 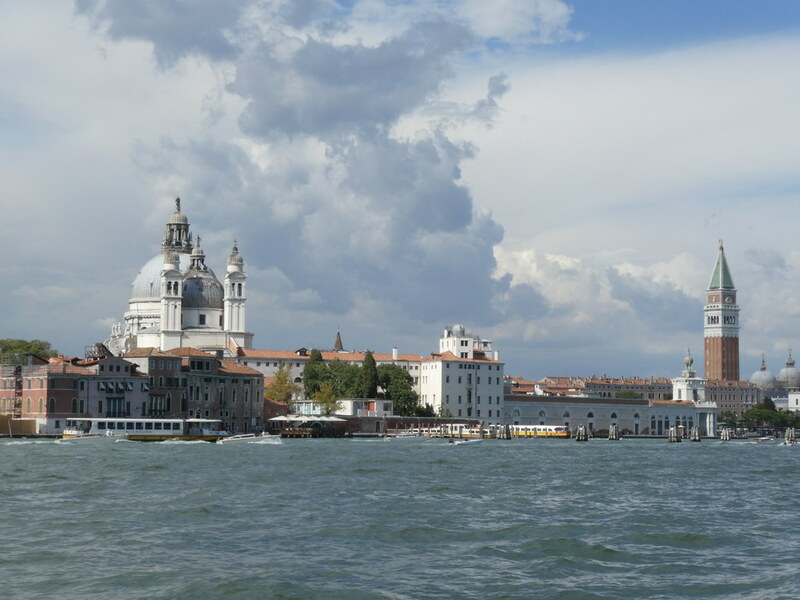 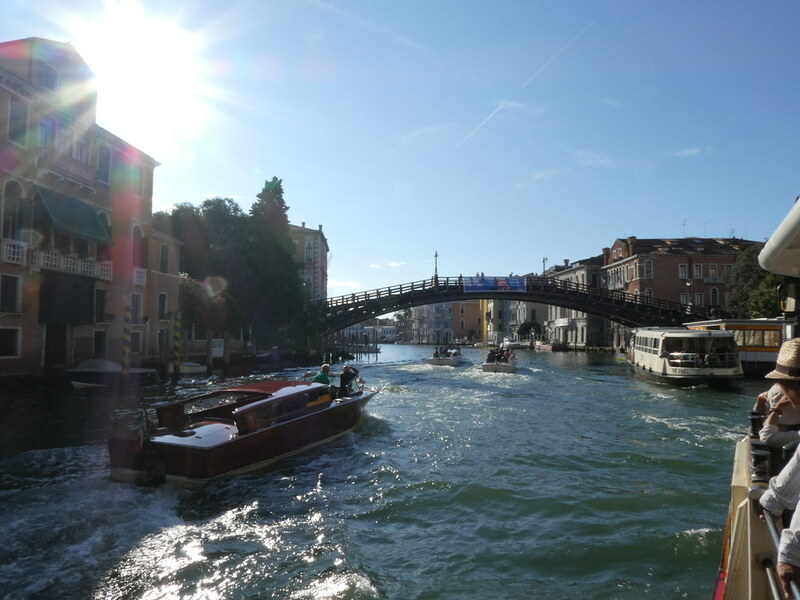 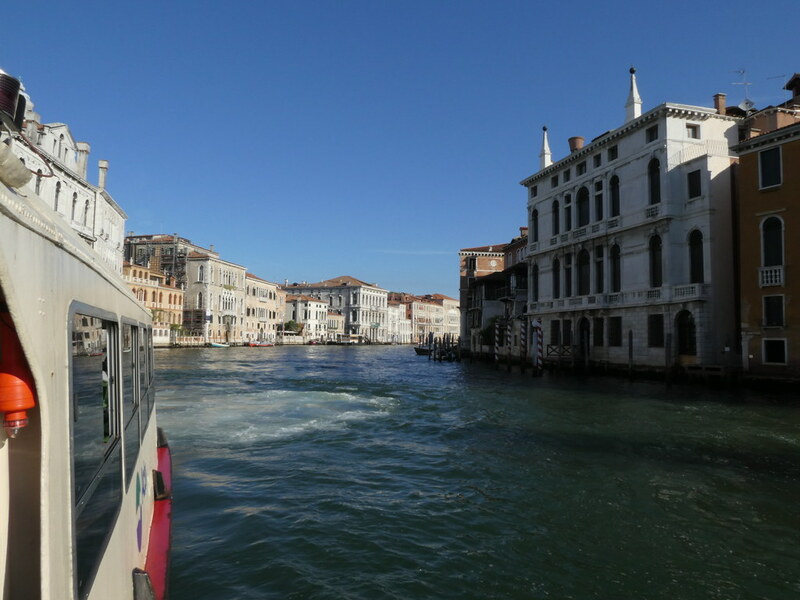 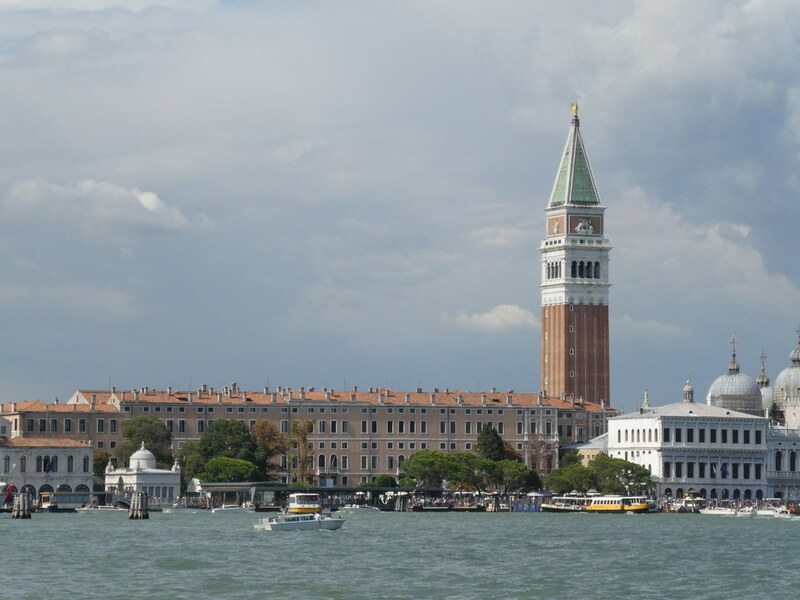 We were surprised to find that the whole day had gone so we caught a bus and the Vaporetto back to the main island. 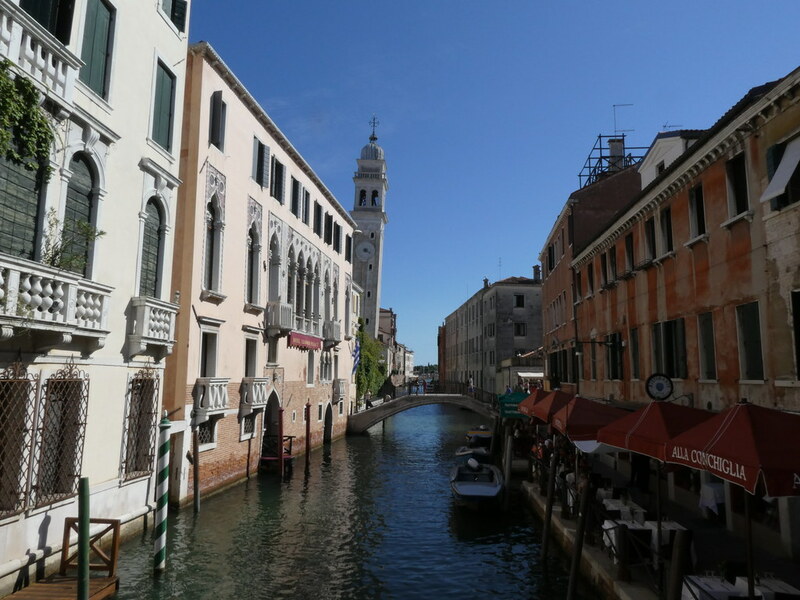 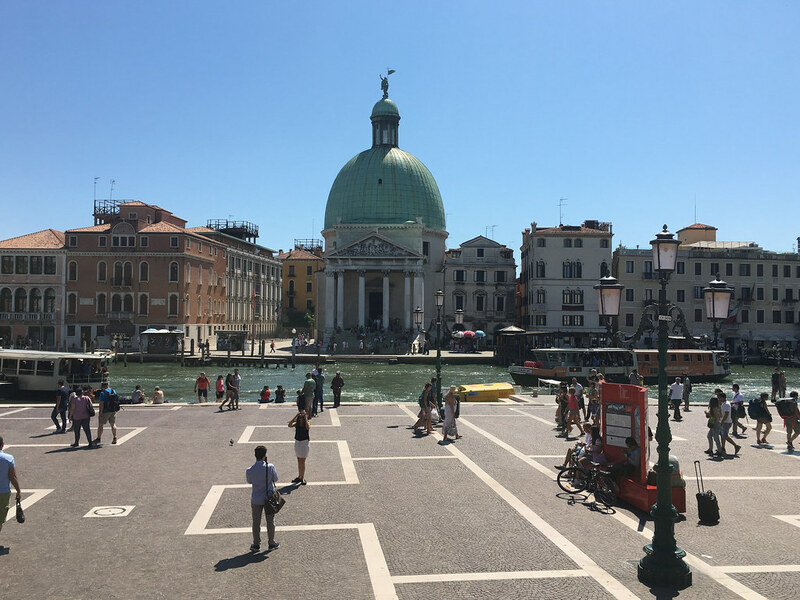 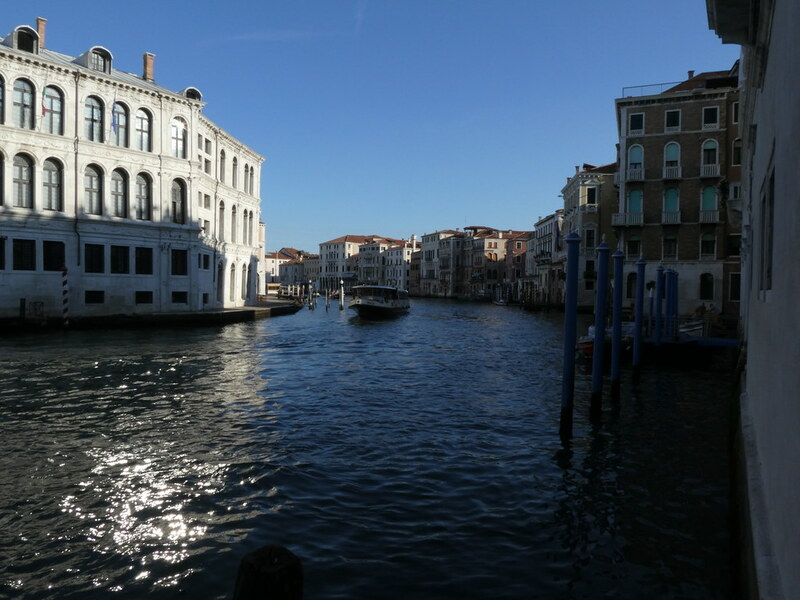 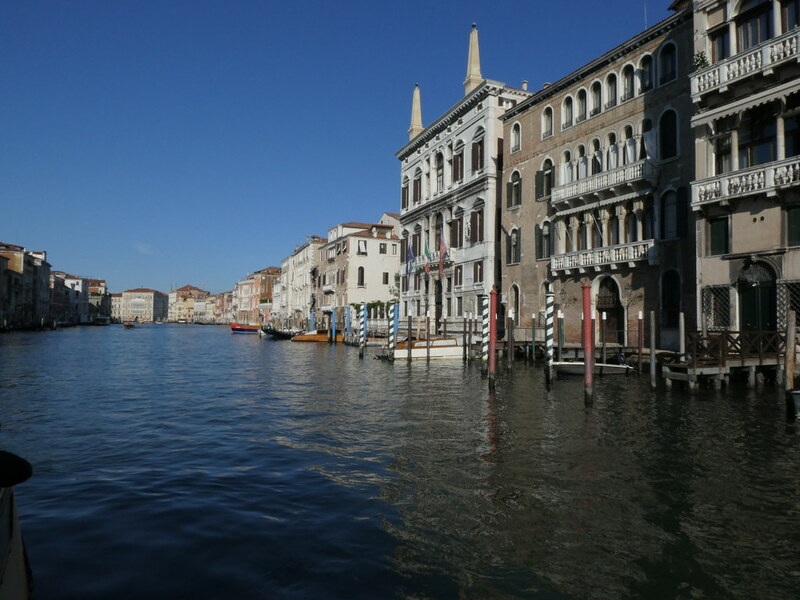 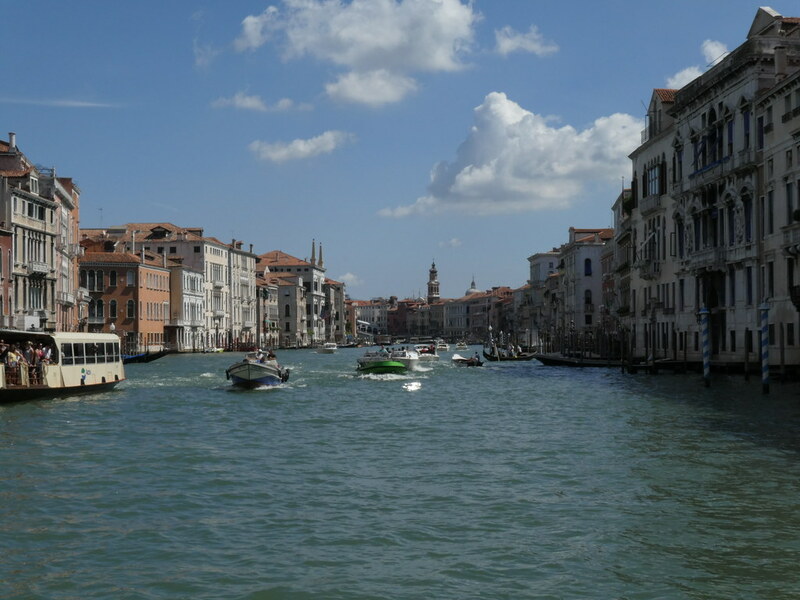 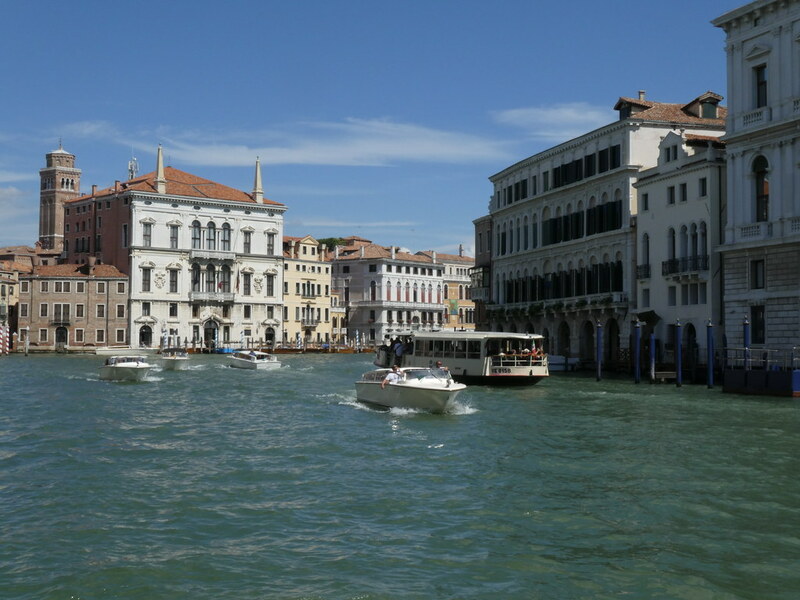 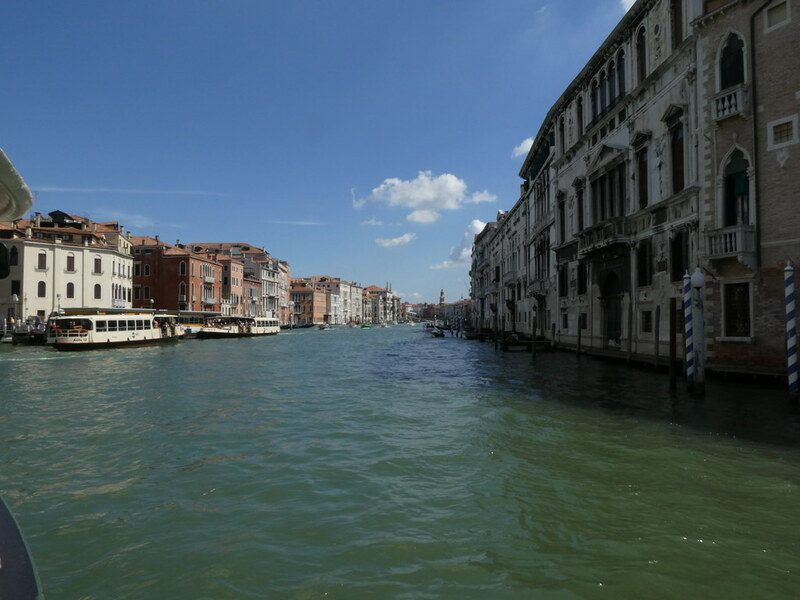 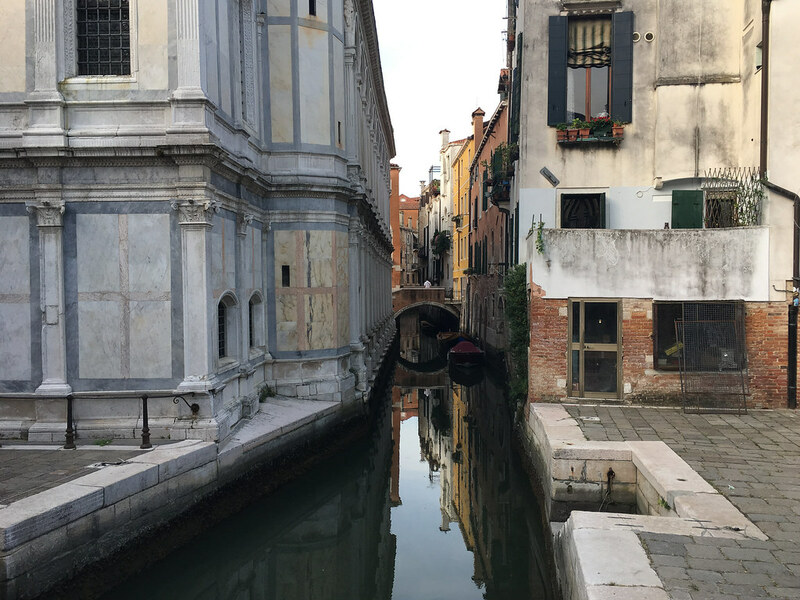 While we were in the square it occurred that even having been here four days we hadn’t taken in the city’s main artery, the Grand Canal. 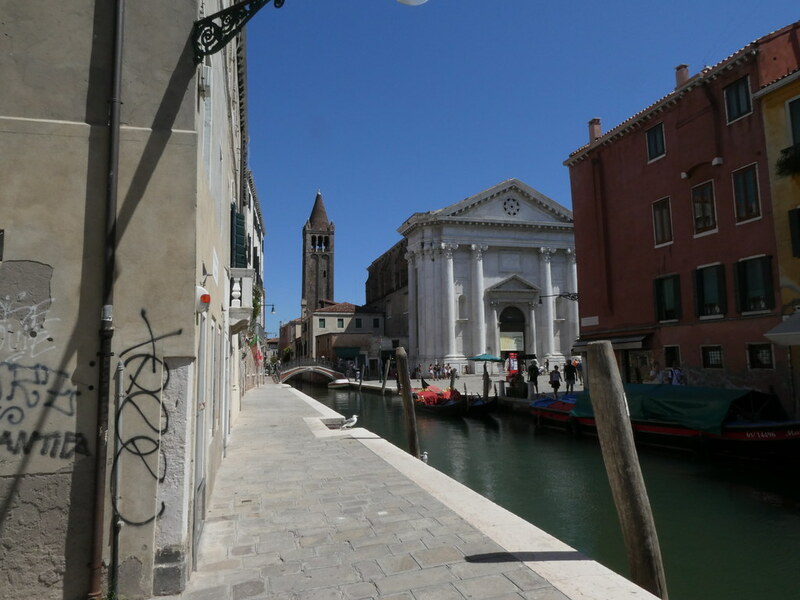 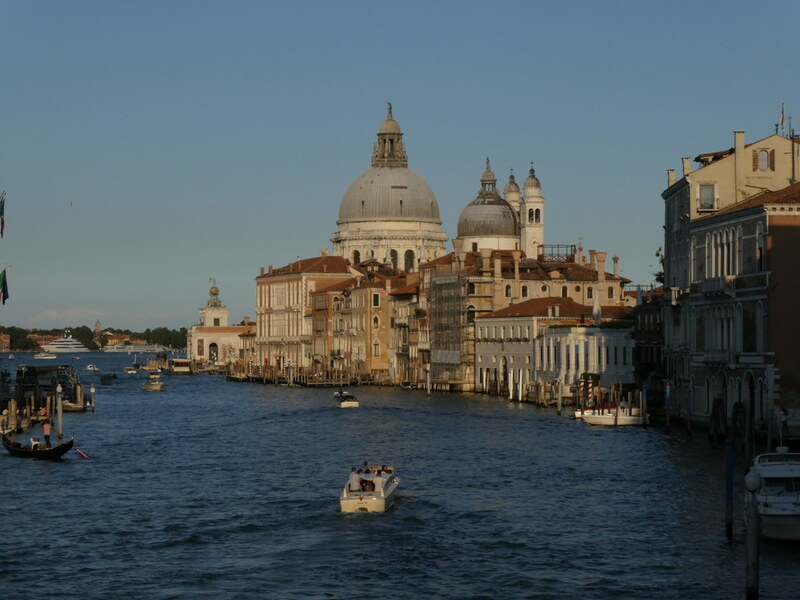 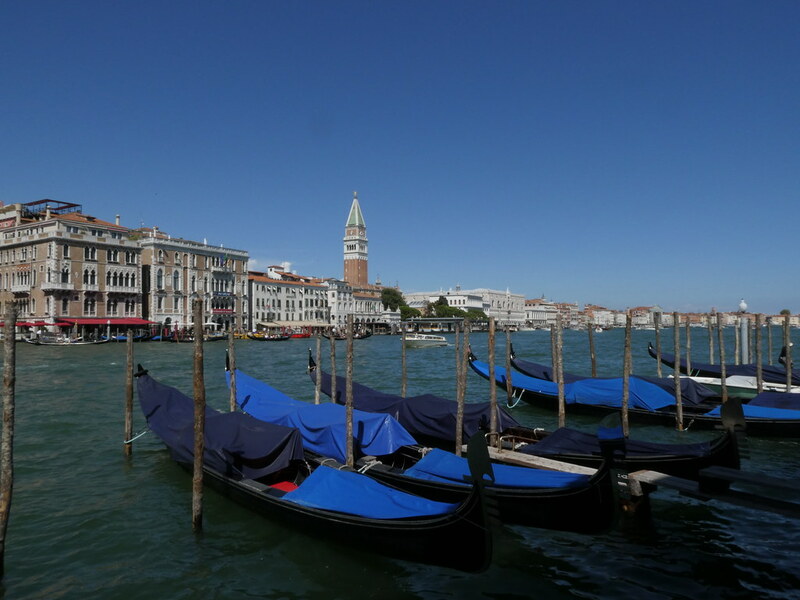 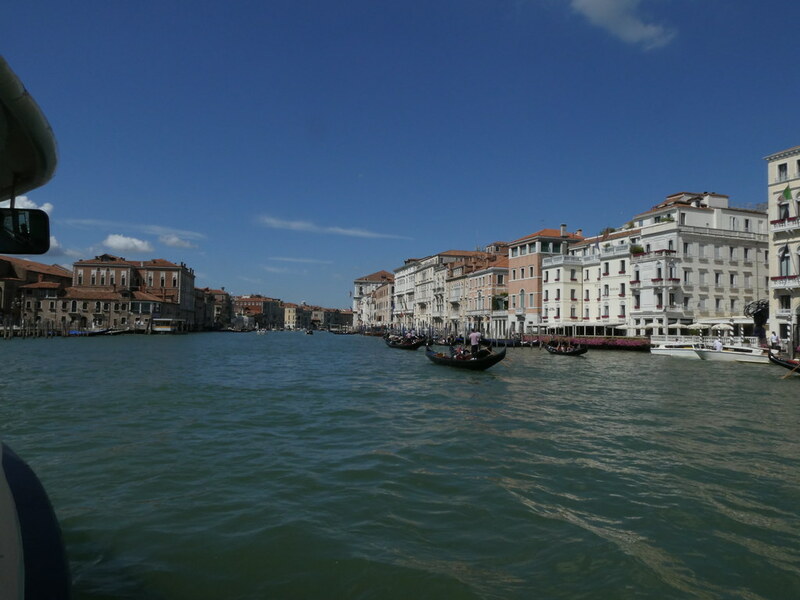 Time to put that right…..
Venice is famous for its blown glass and there are shops everywhere. 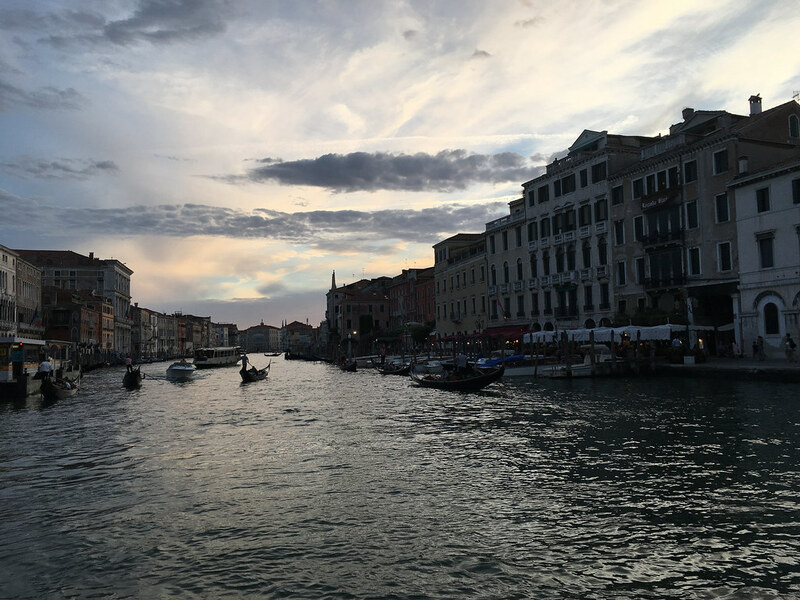 Some of it fabulous some of it terrible some of it plain weird. 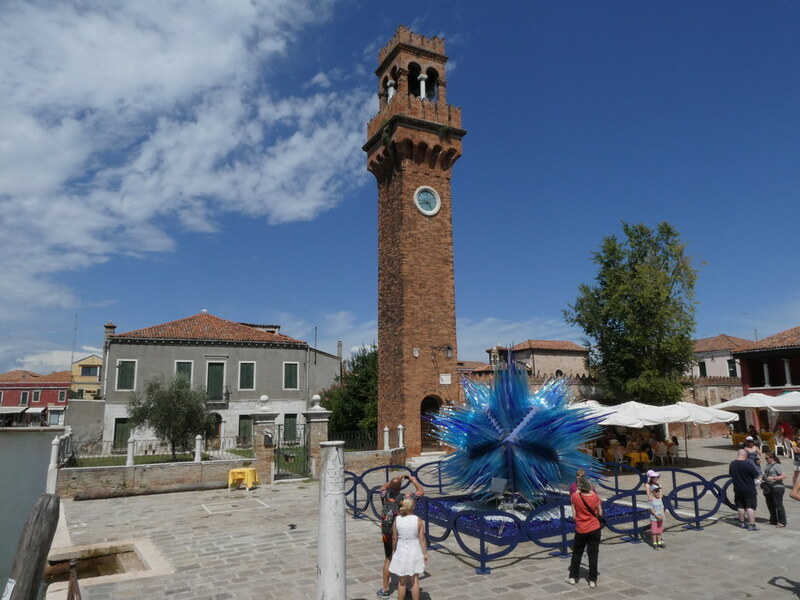 Murano is where the vast majority of the glass is made. 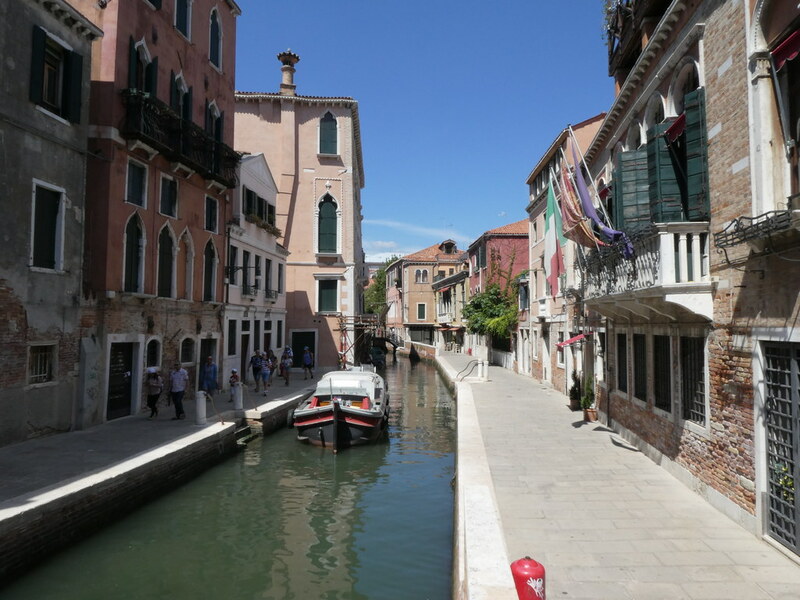 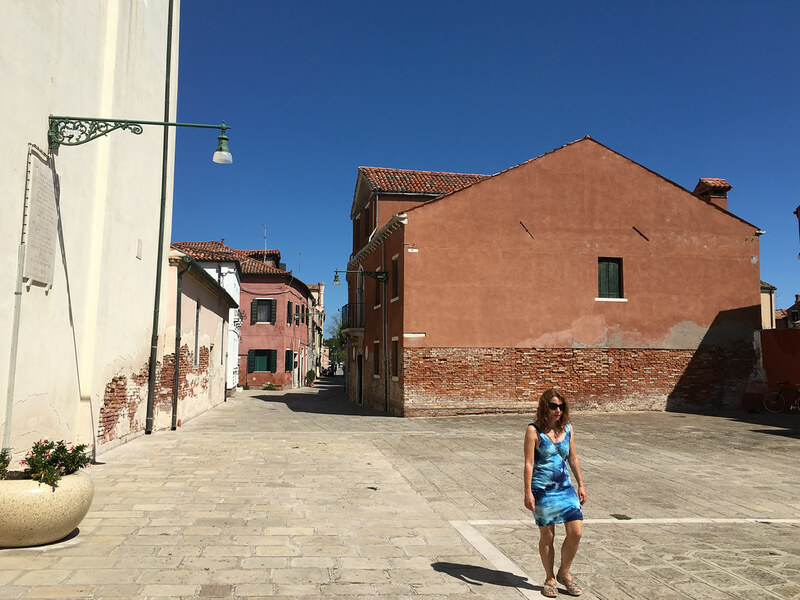 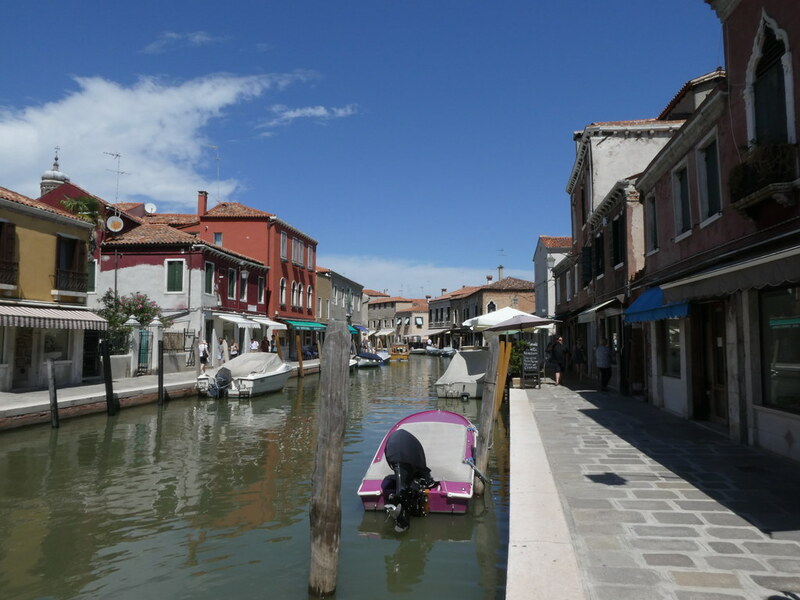 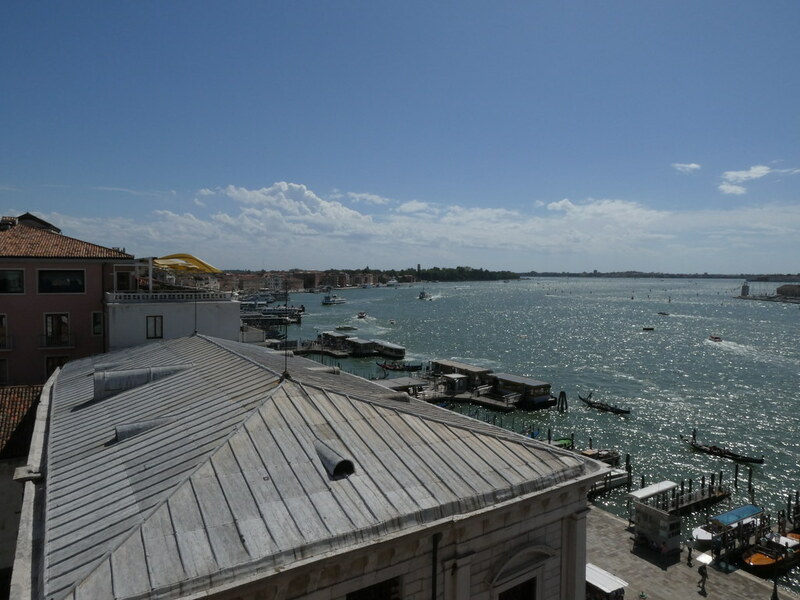 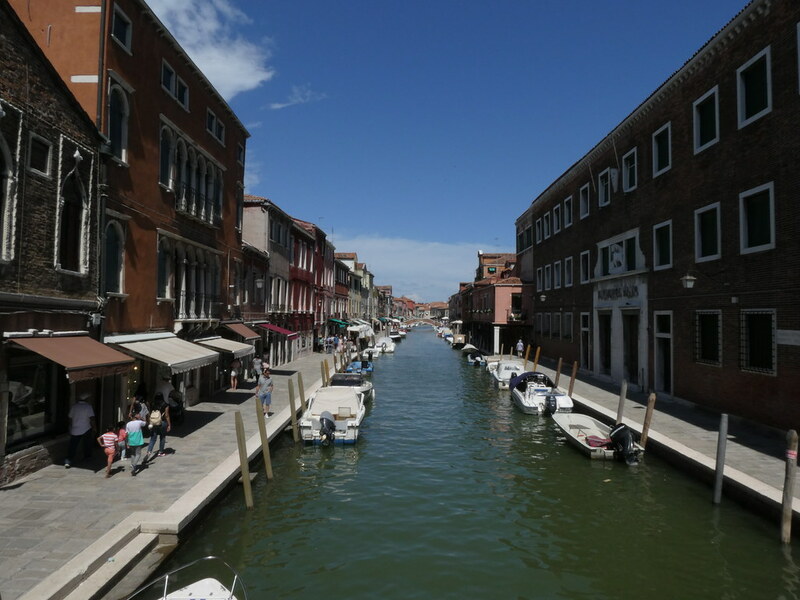 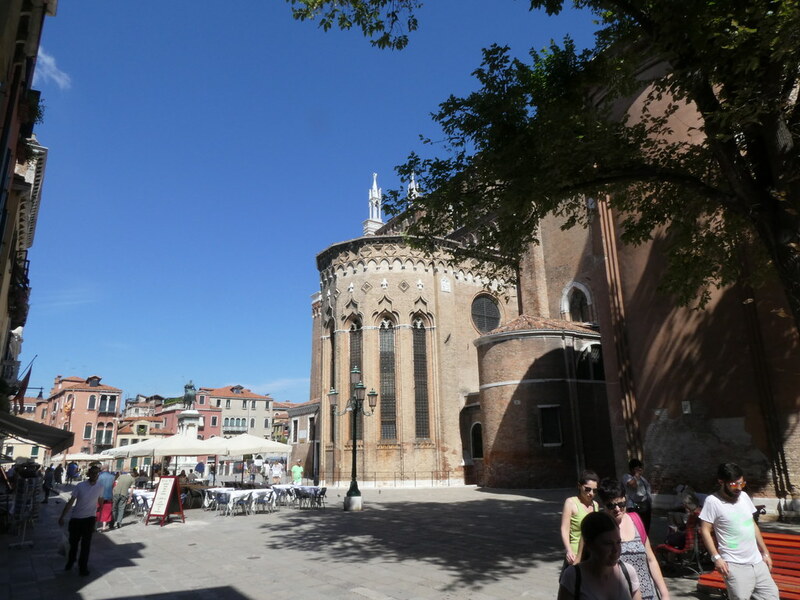 Murano is very pleasant and quiet place to wander about. 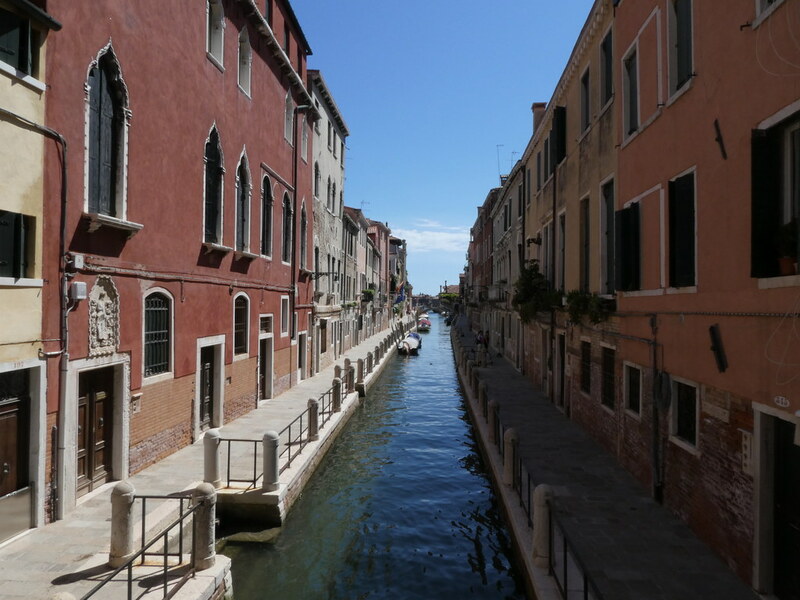 The main street/canal was catching the sun very fetchingly. 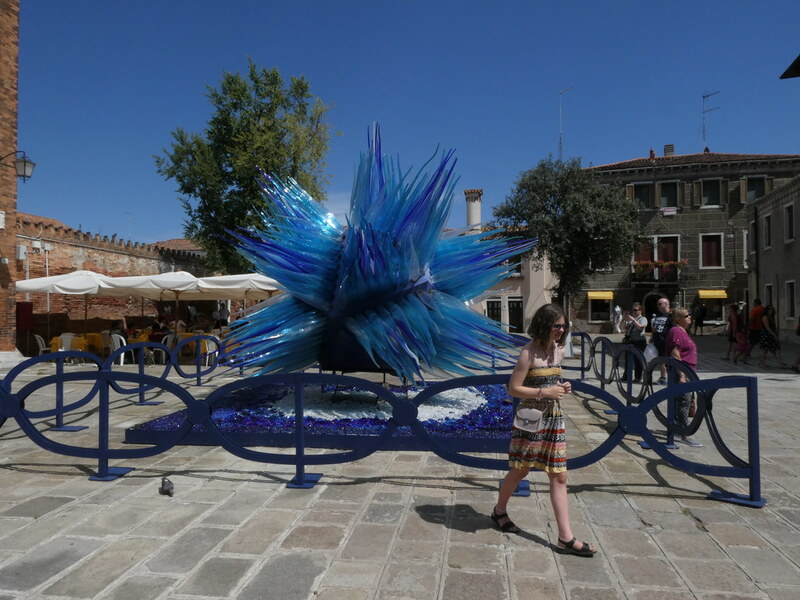 The number of glass shops was astounding, 75% was my estimate. 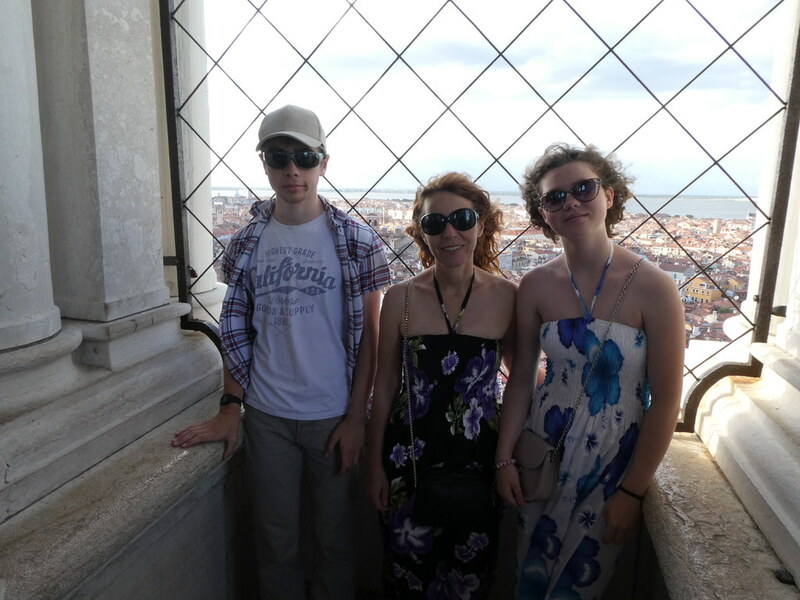 Very useful if you wanted to buy glass but we wanted a Gelato! 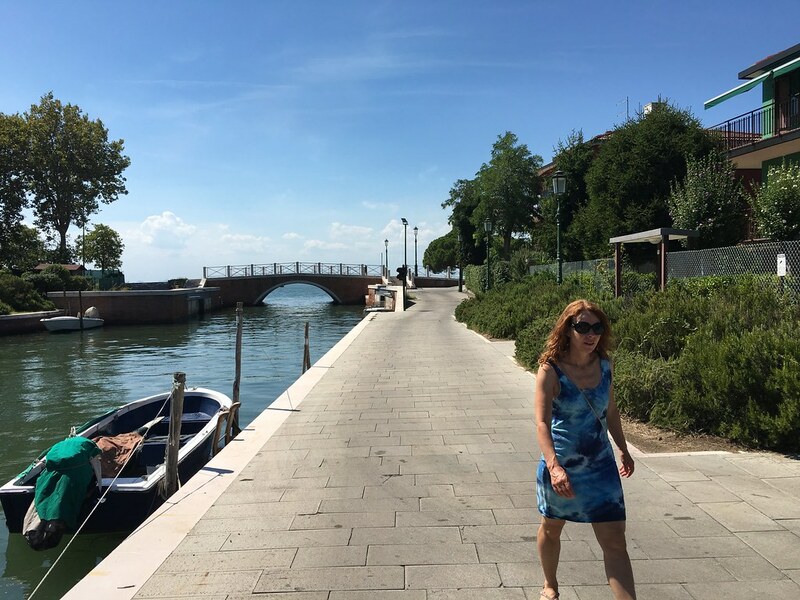 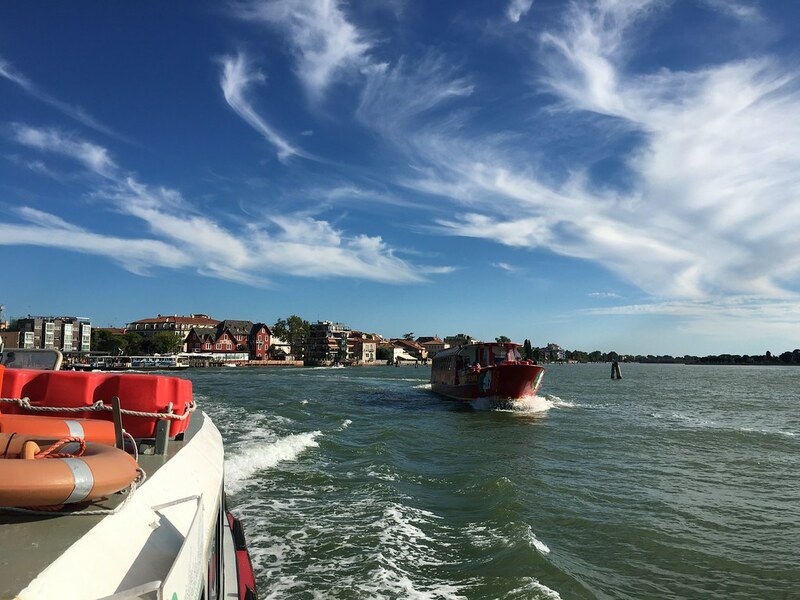 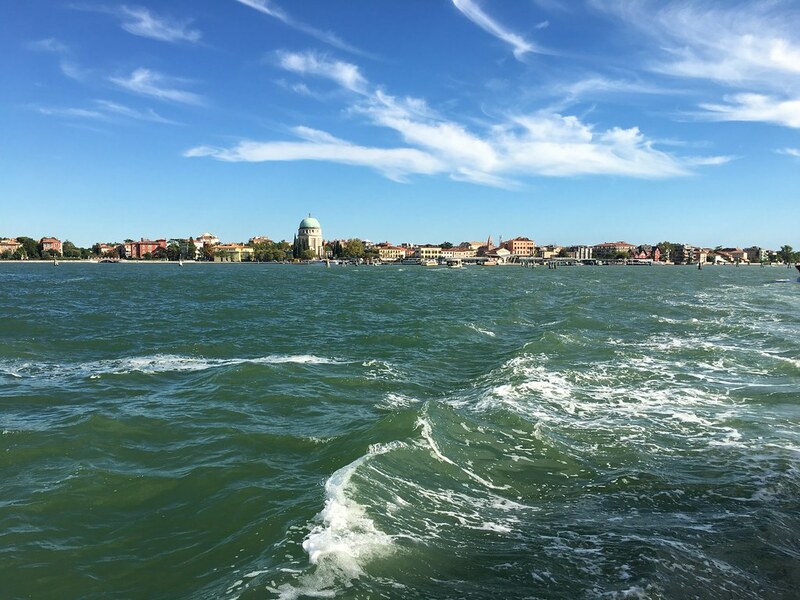 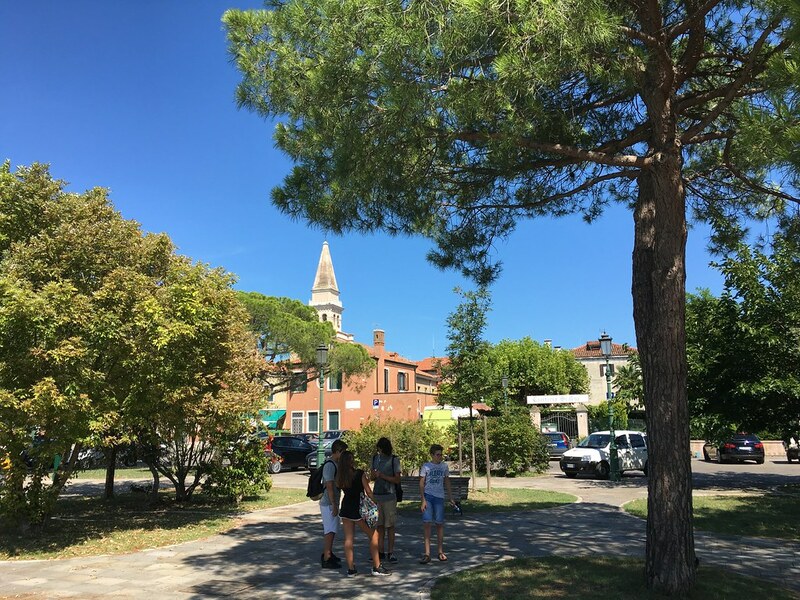 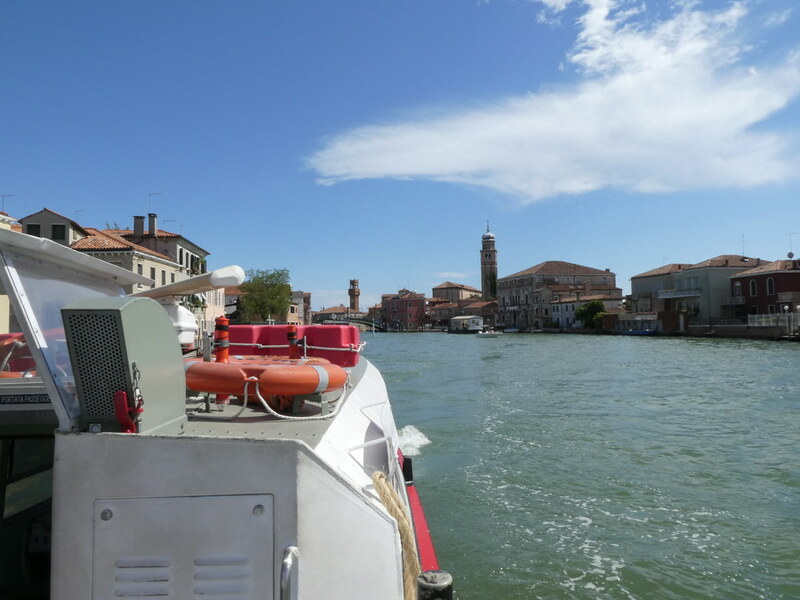 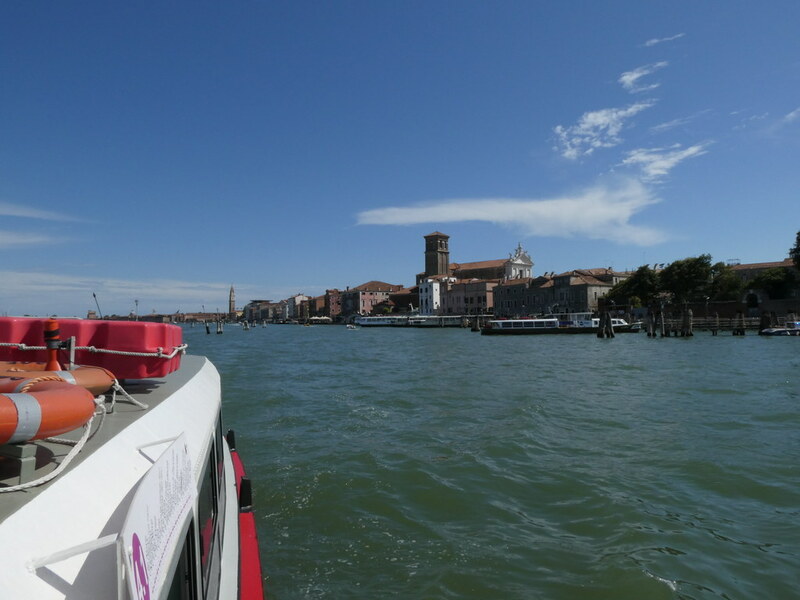 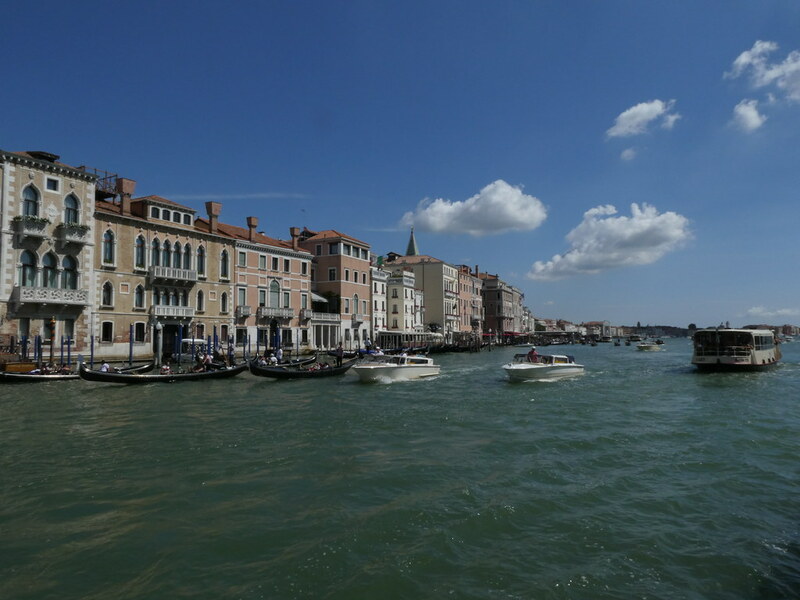 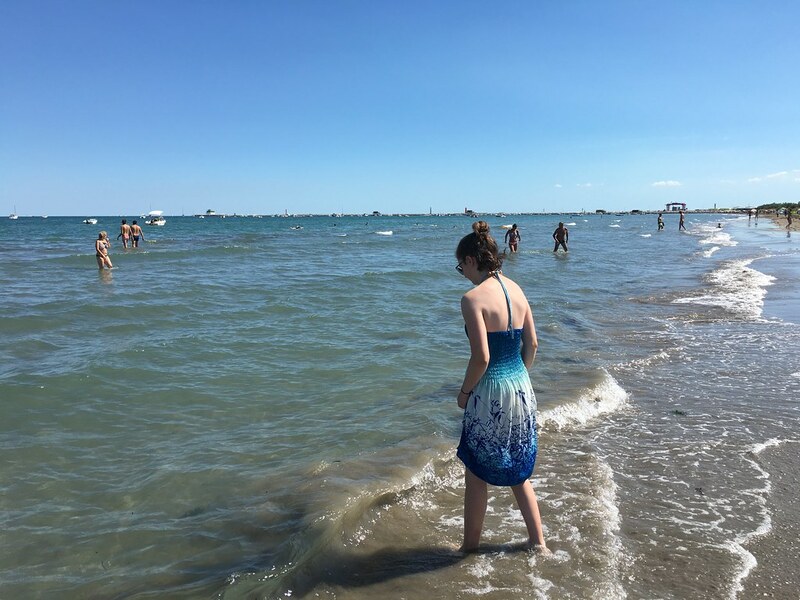 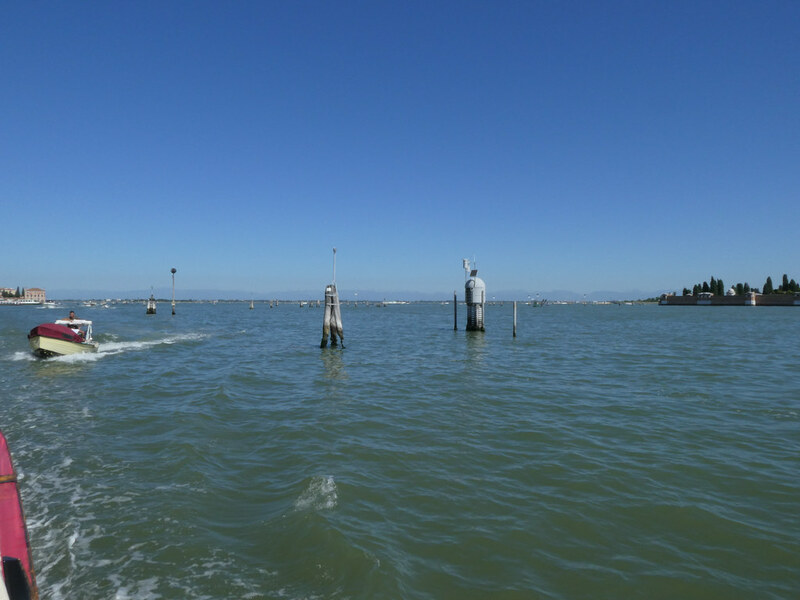 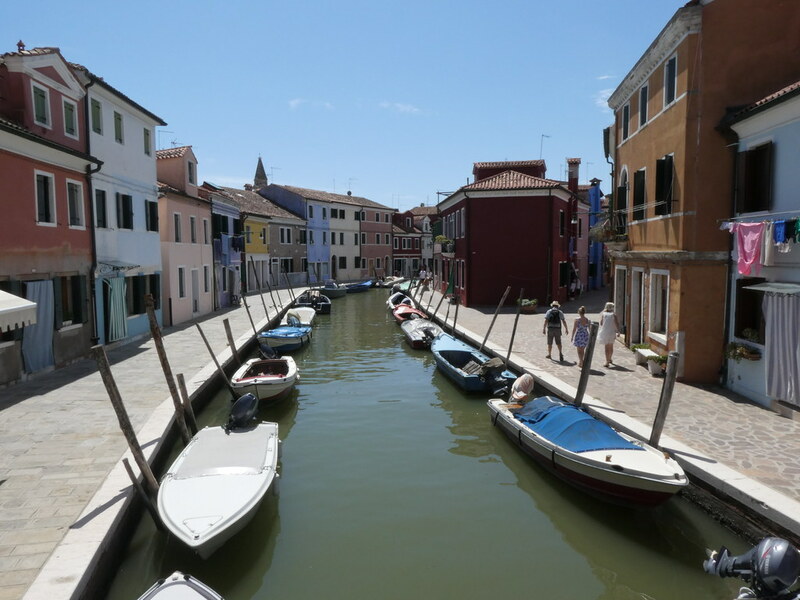 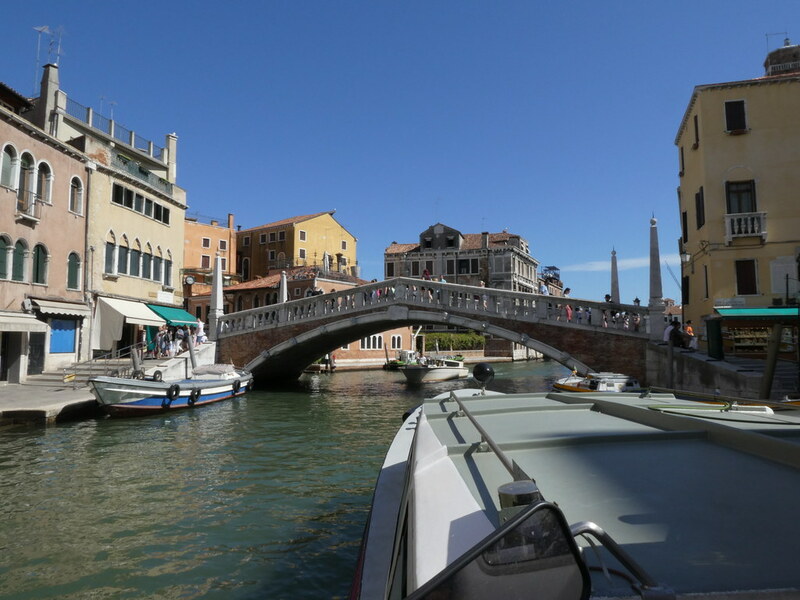 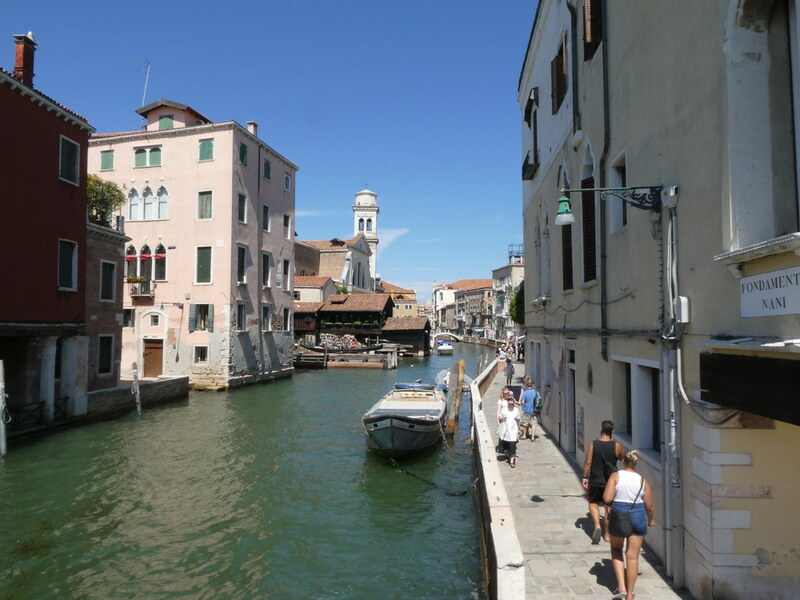 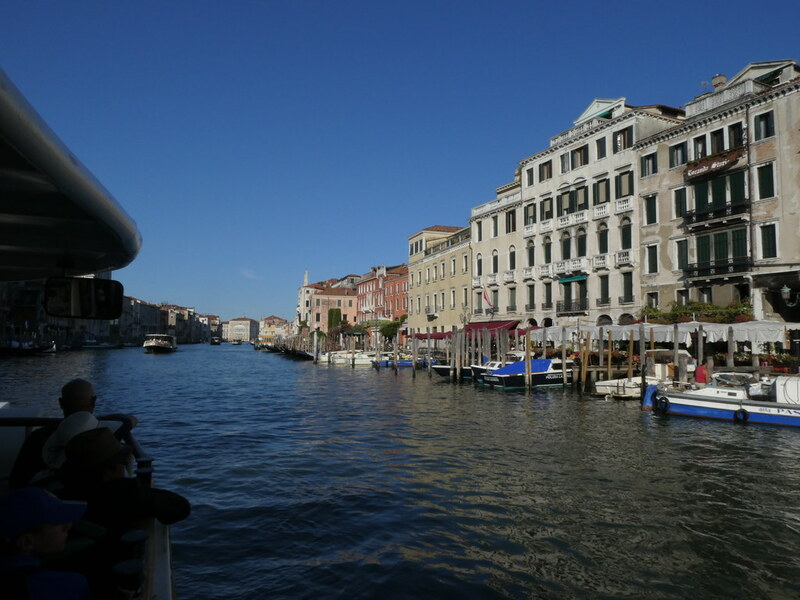 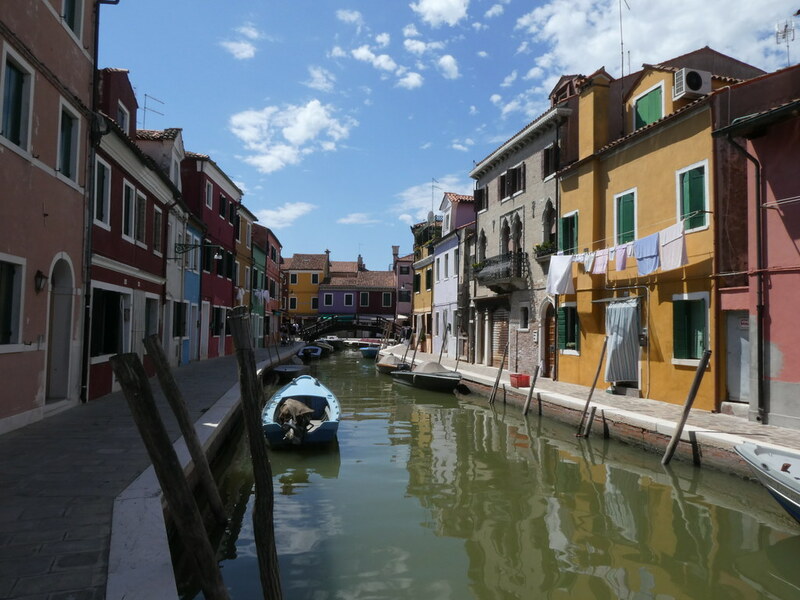 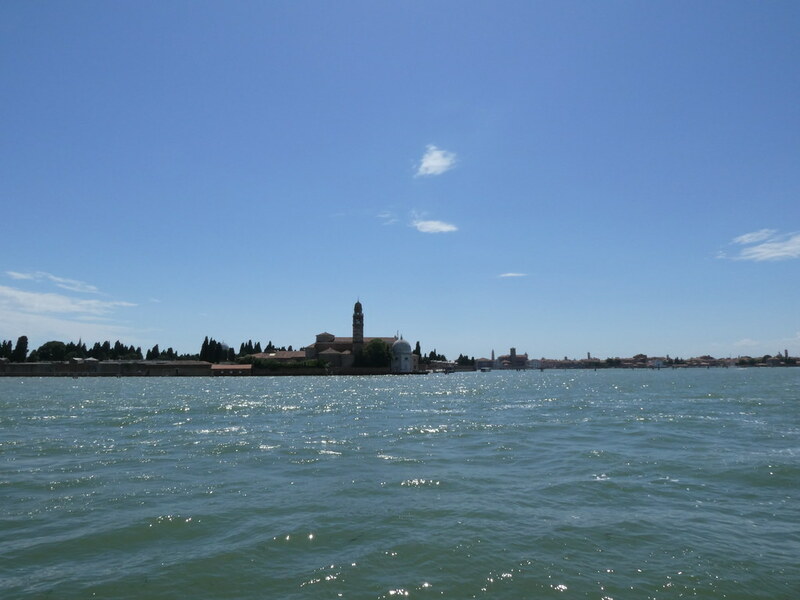 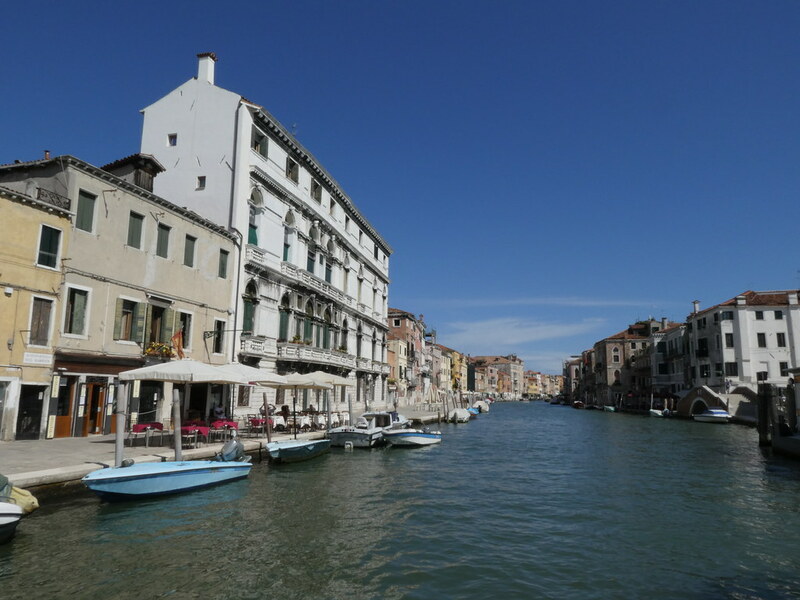 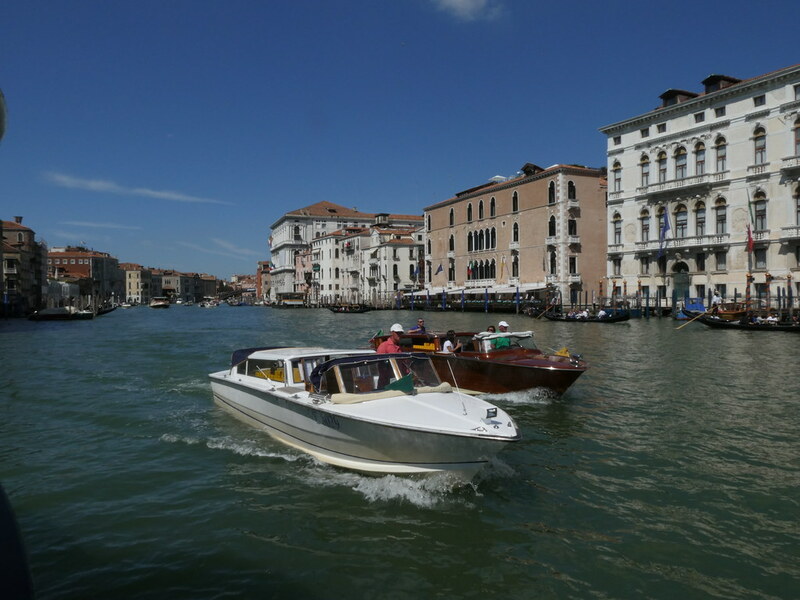 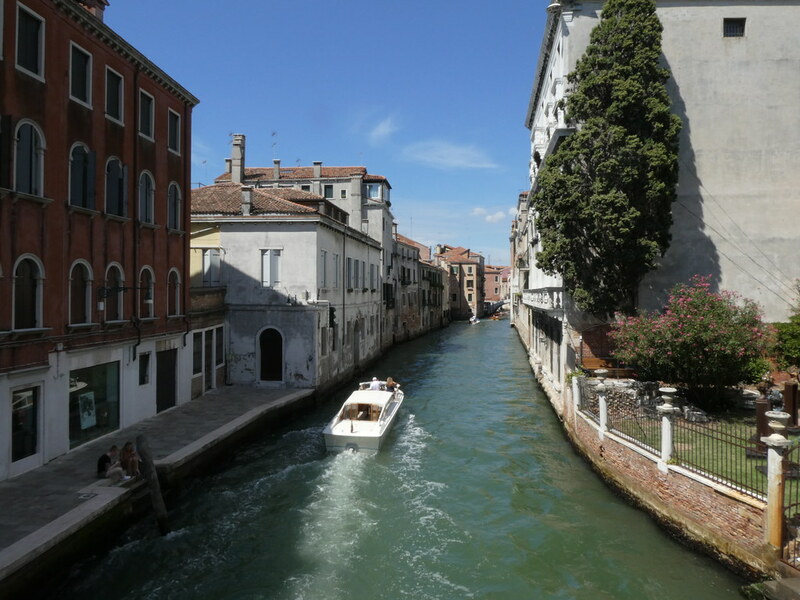 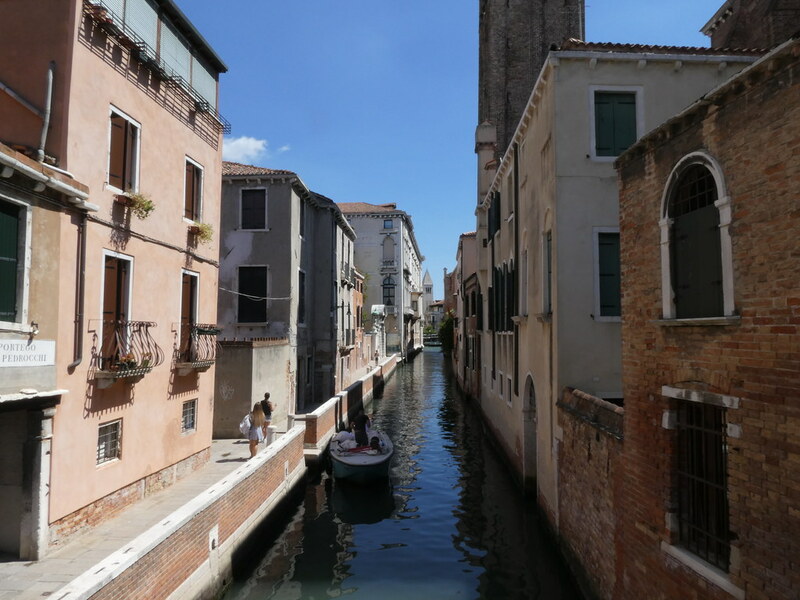 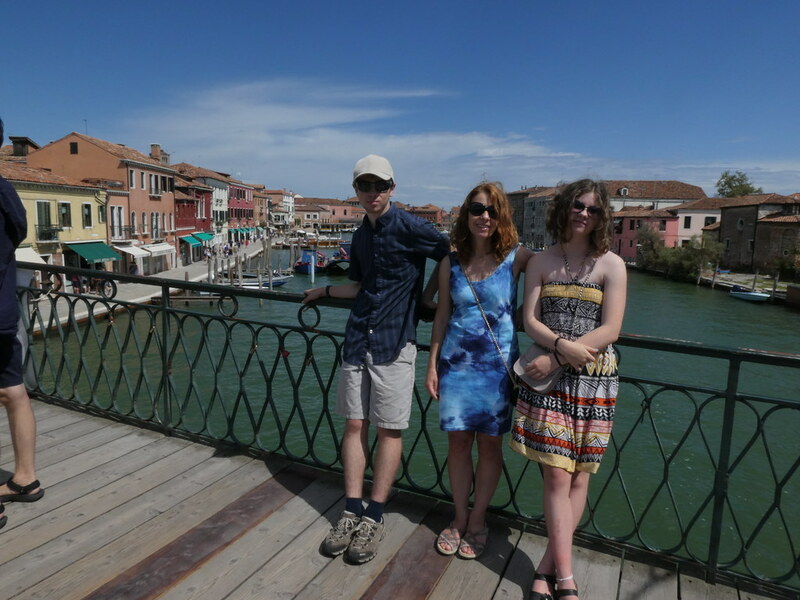 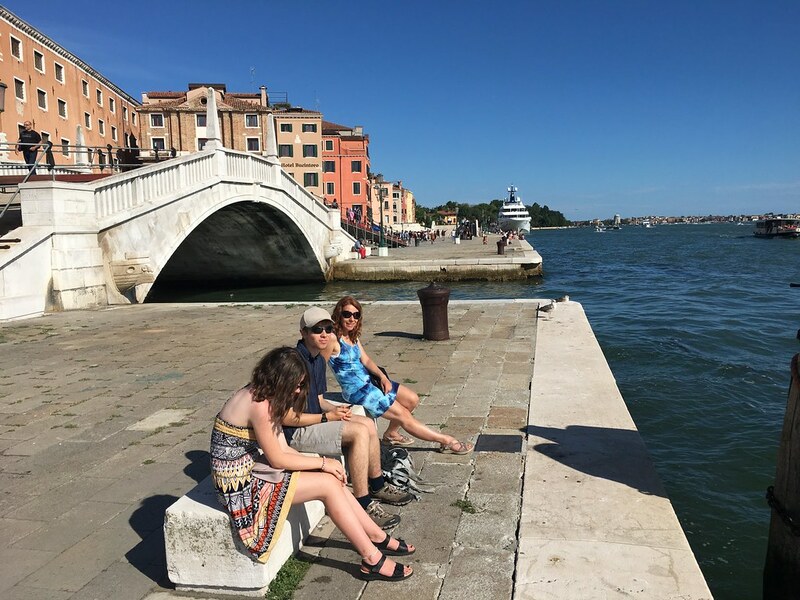 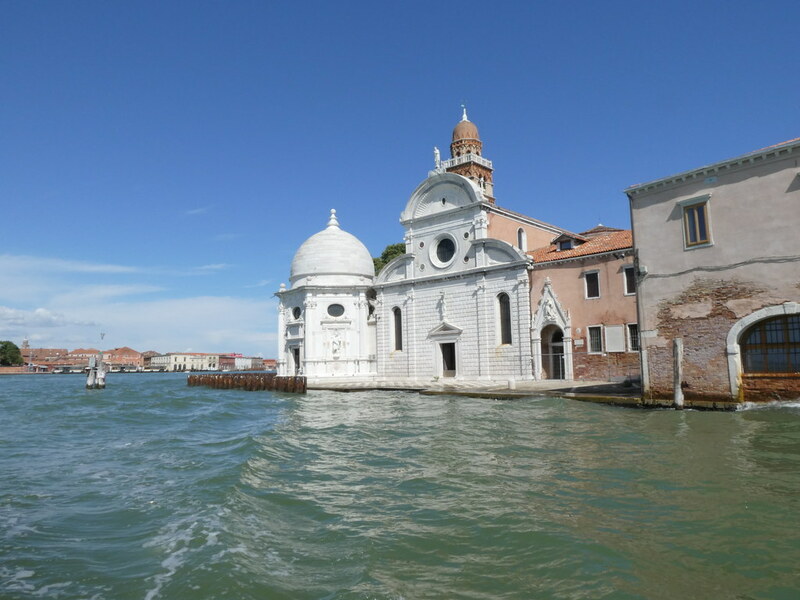 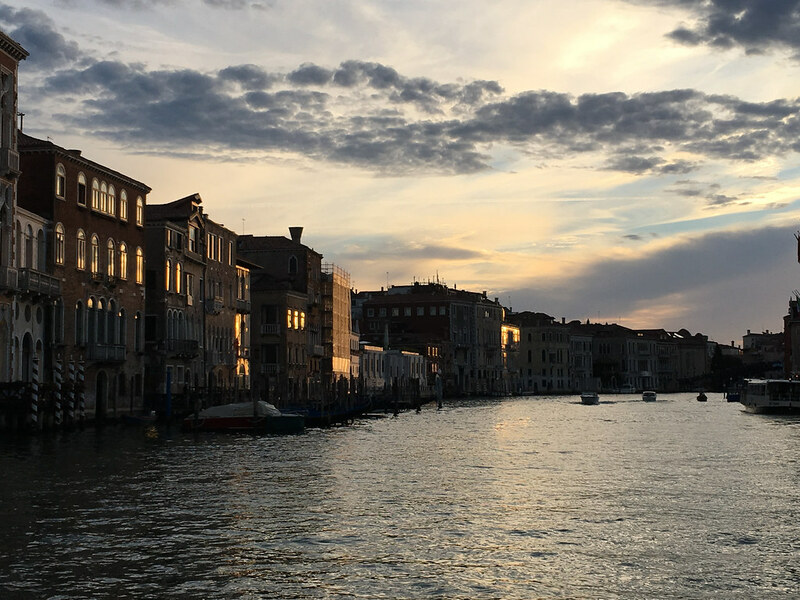 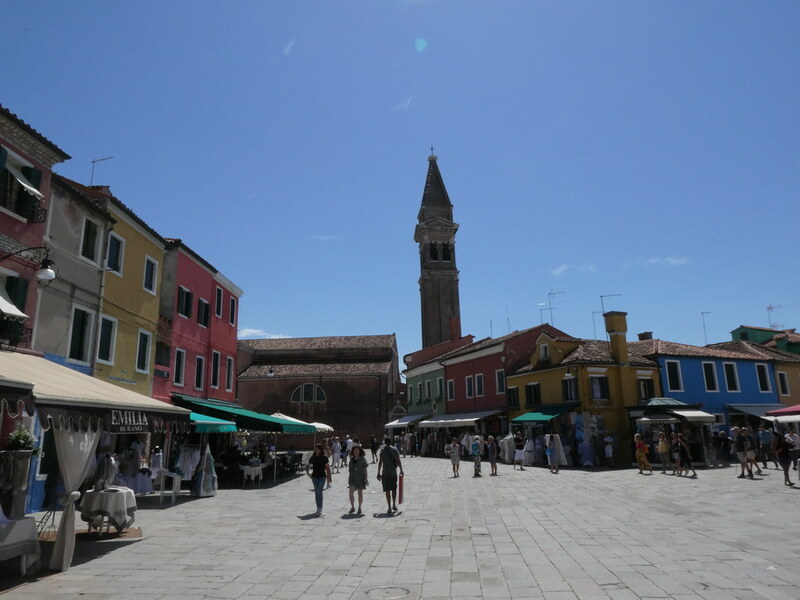 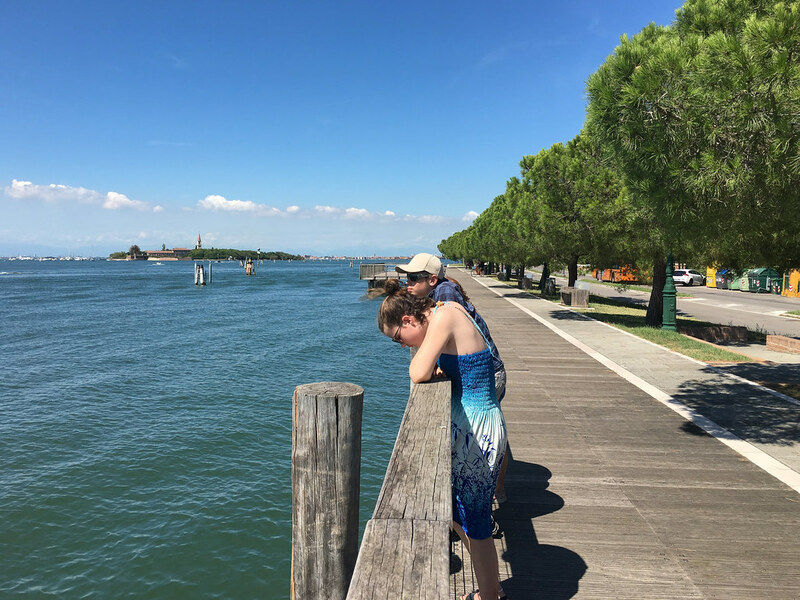 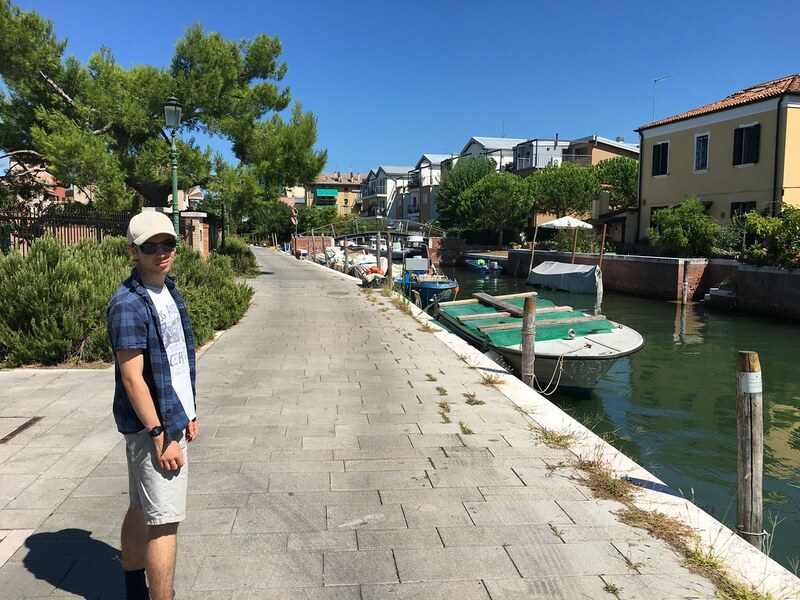 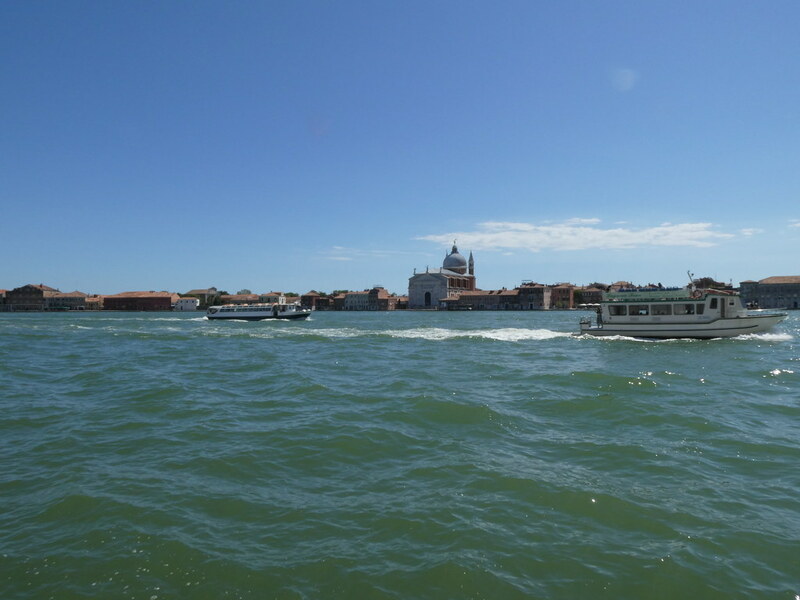 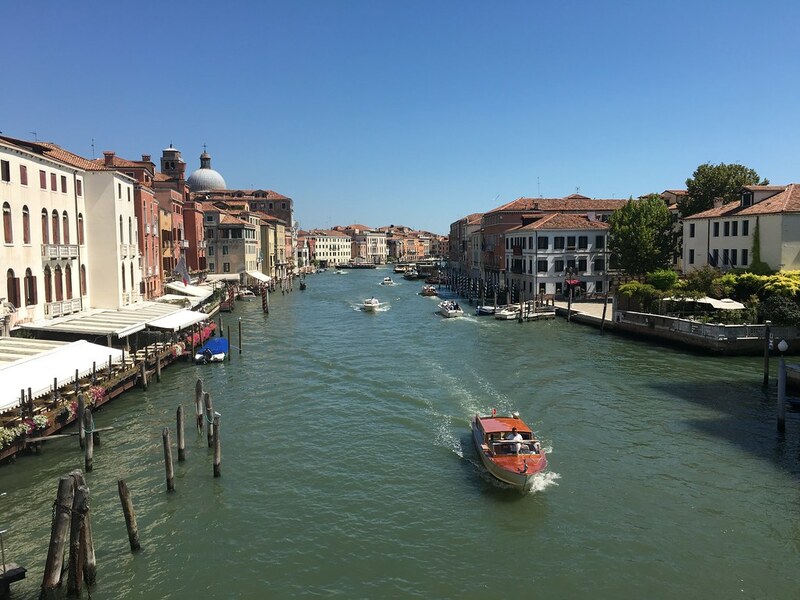 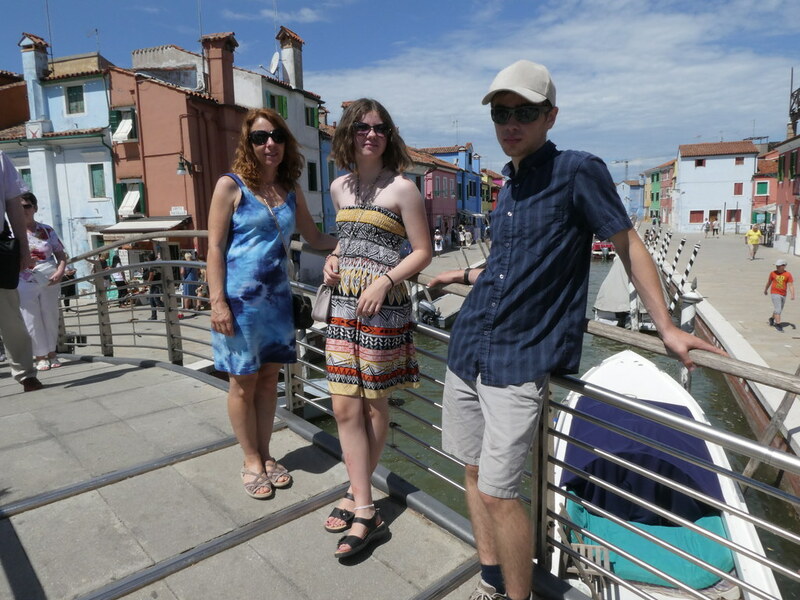 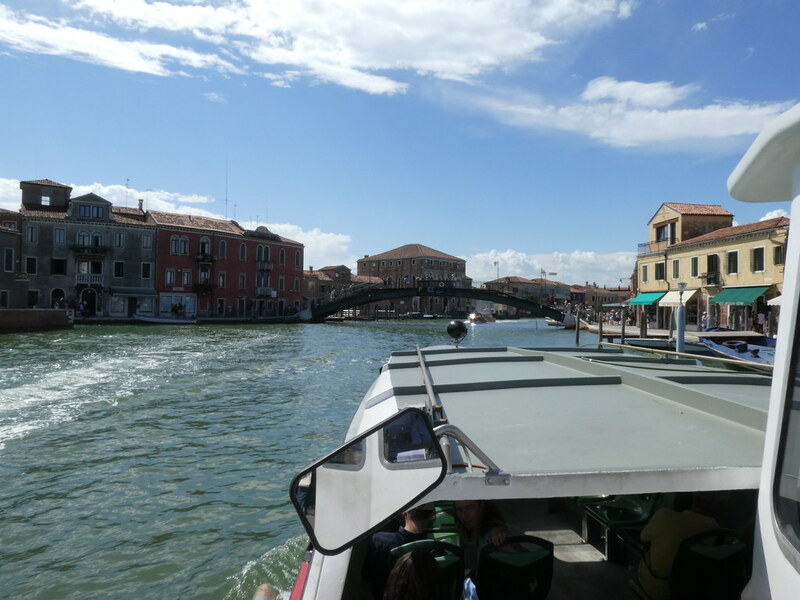 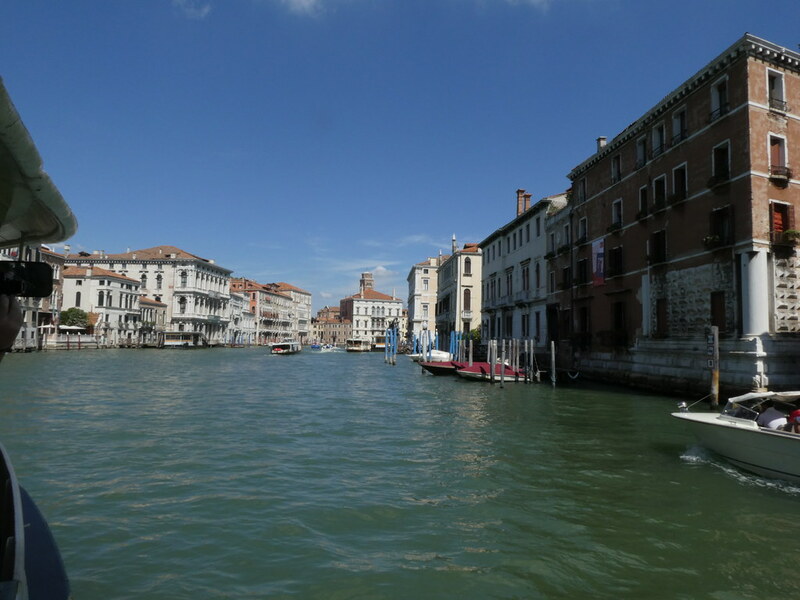 Whilst Murano is very nice, it doesn’t have the grandeur of the main island or the colourful charm of Burano so we decided another boat trip was in order. 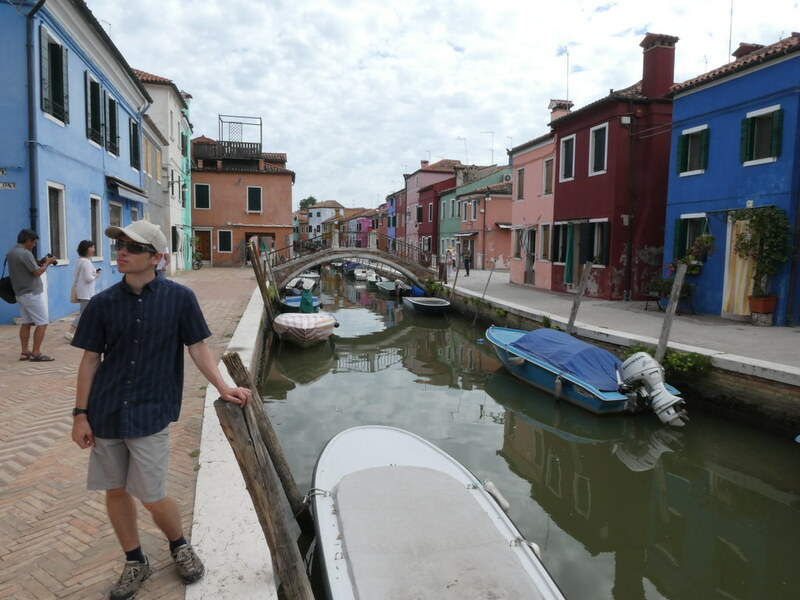 We were actually a along way from the apartment. 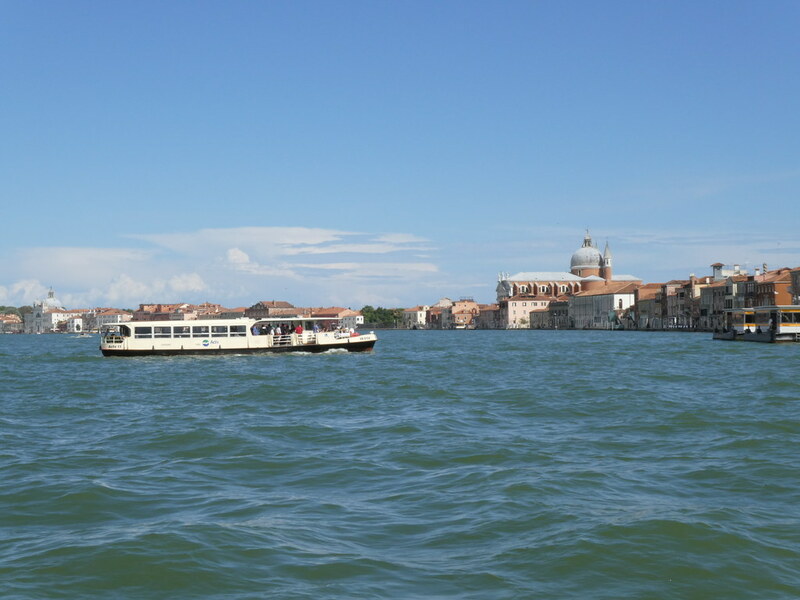 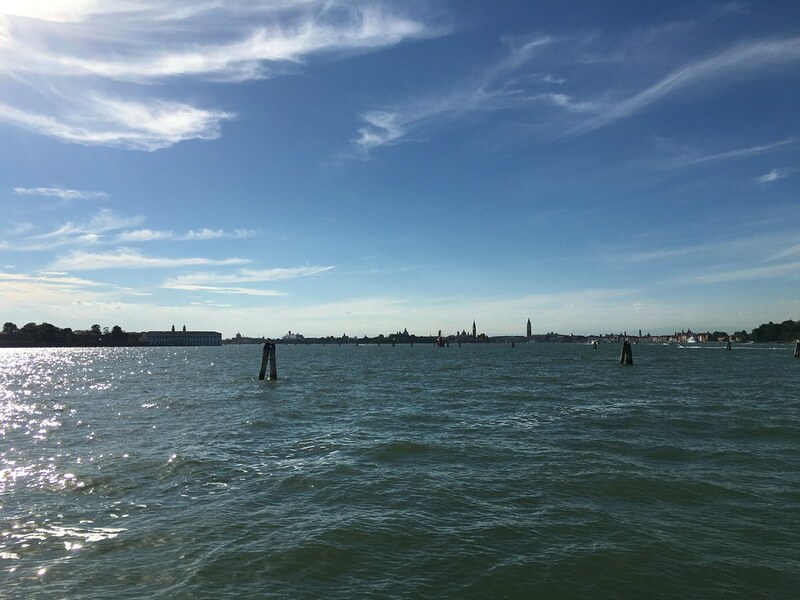 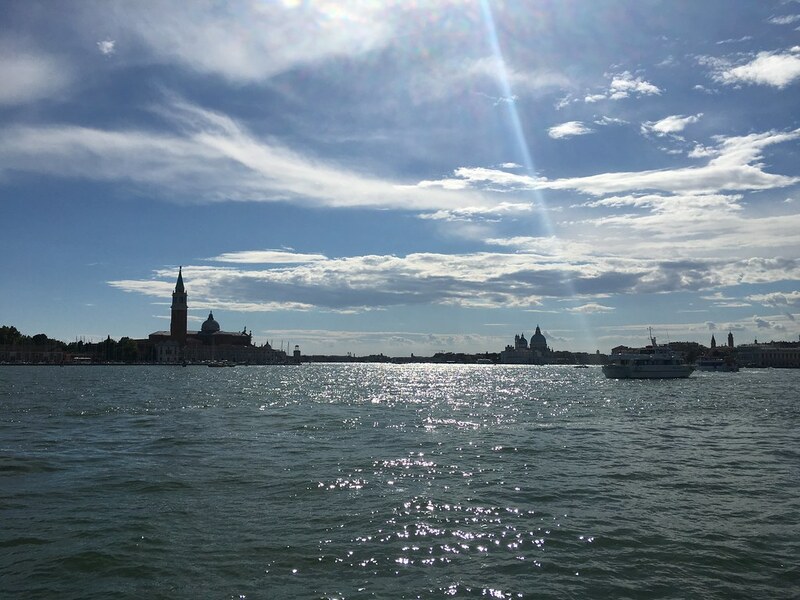 Nice thing about Venice is you are never too far away from a Vaporetto stop and there will be a boat going somewhere near where you want to go. 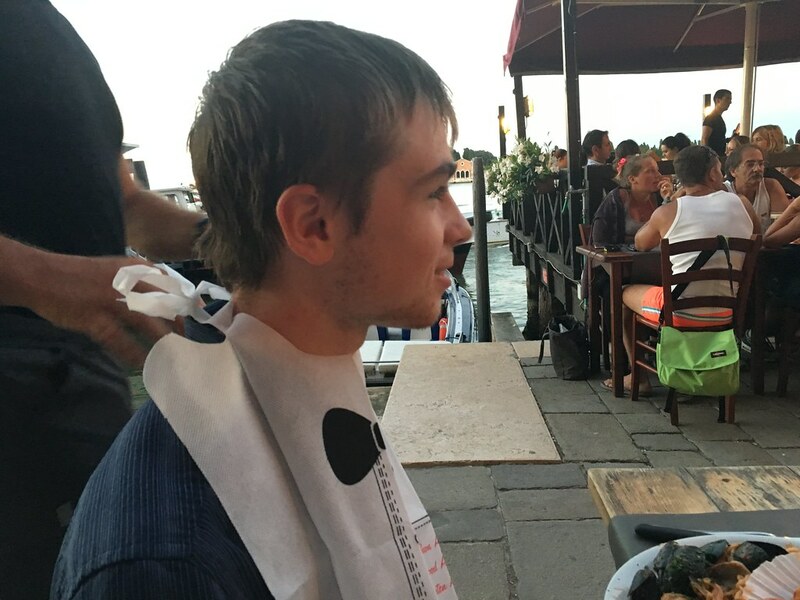 We hadn’t quite sussed out the subleties of Italian menus at this stage. 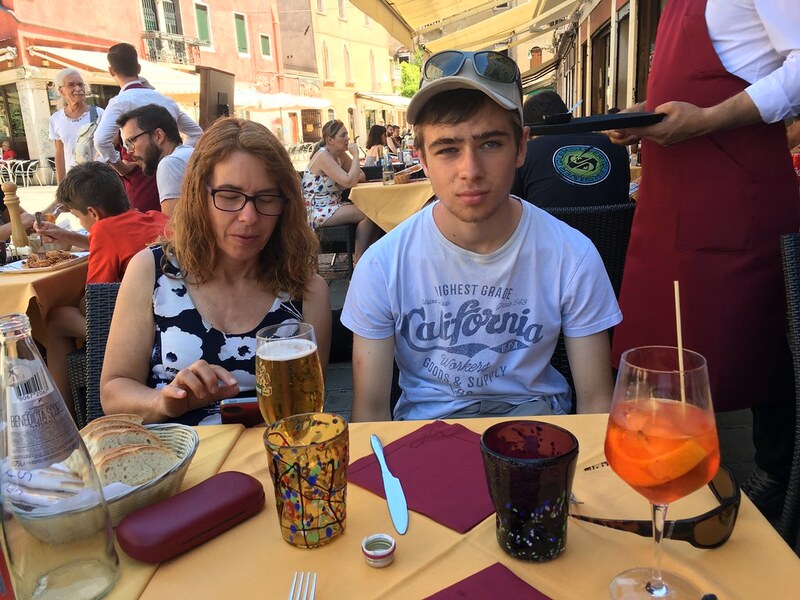 We thought that “Primi” were small courses and “Secondi” large courses. 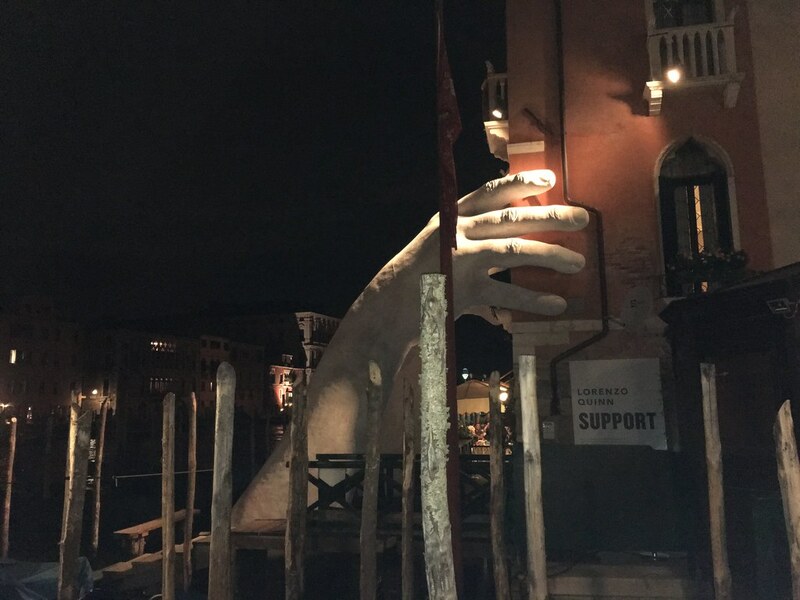 Turns out both are big, the former is pasta, the latter meat or fish based. 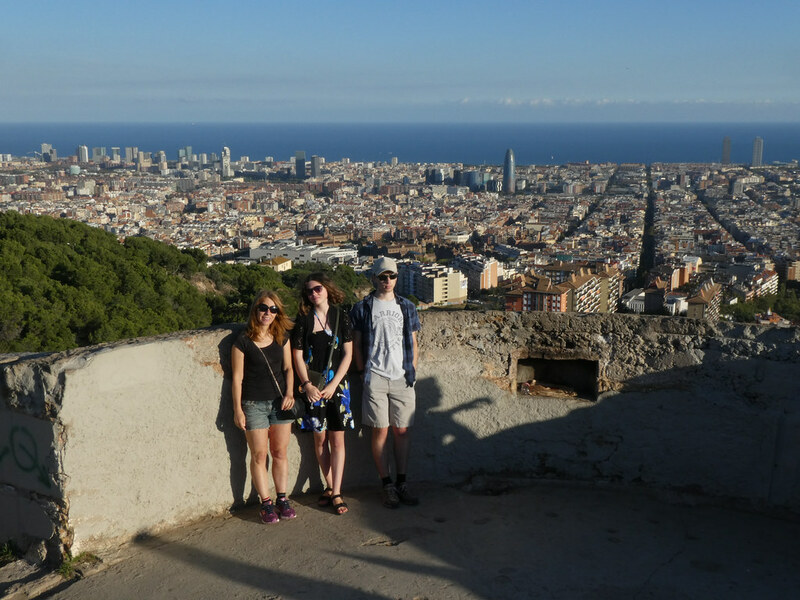 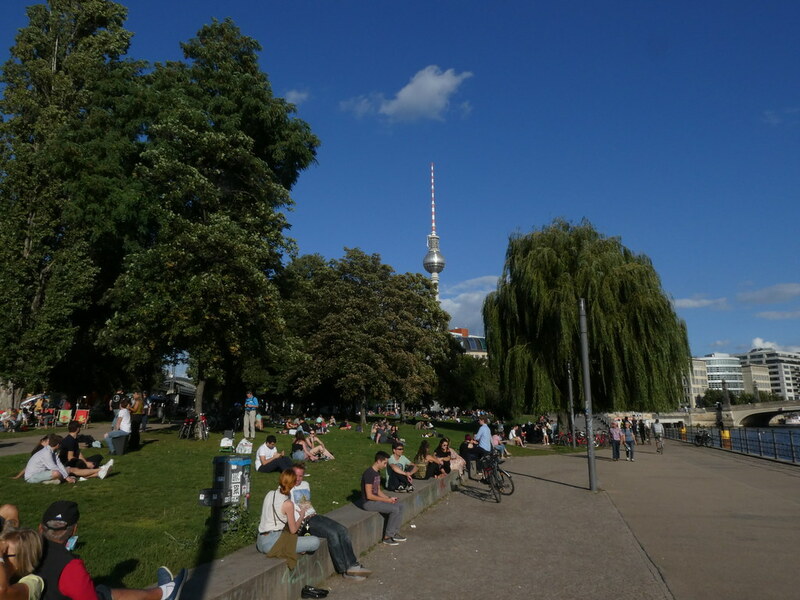 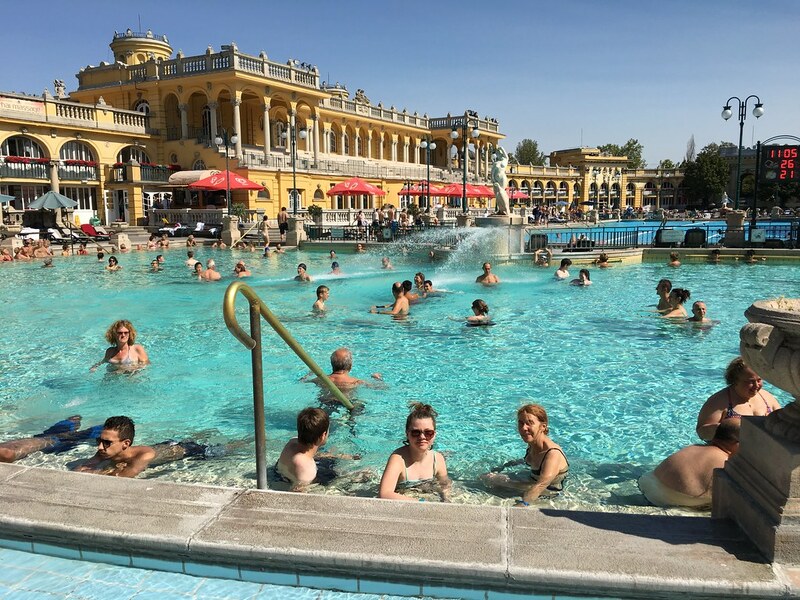 It was surprising how quickly these cities became to feel like home. 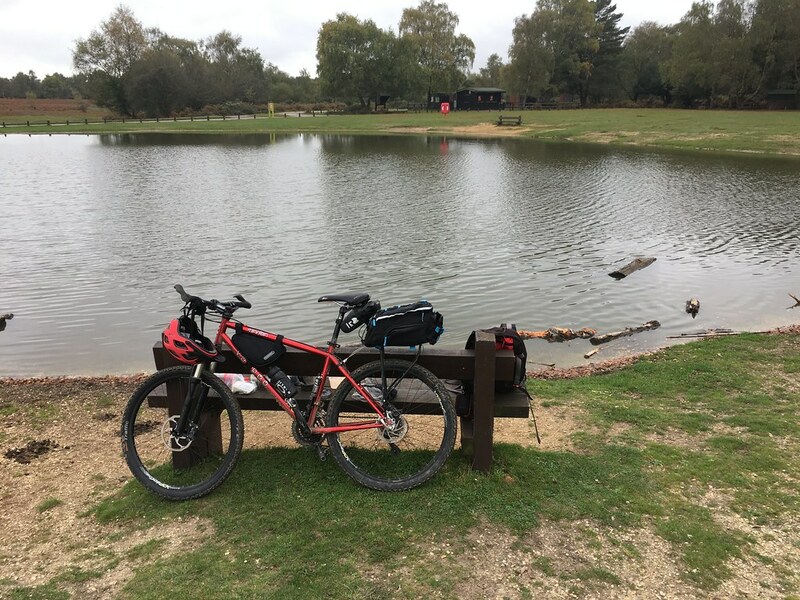 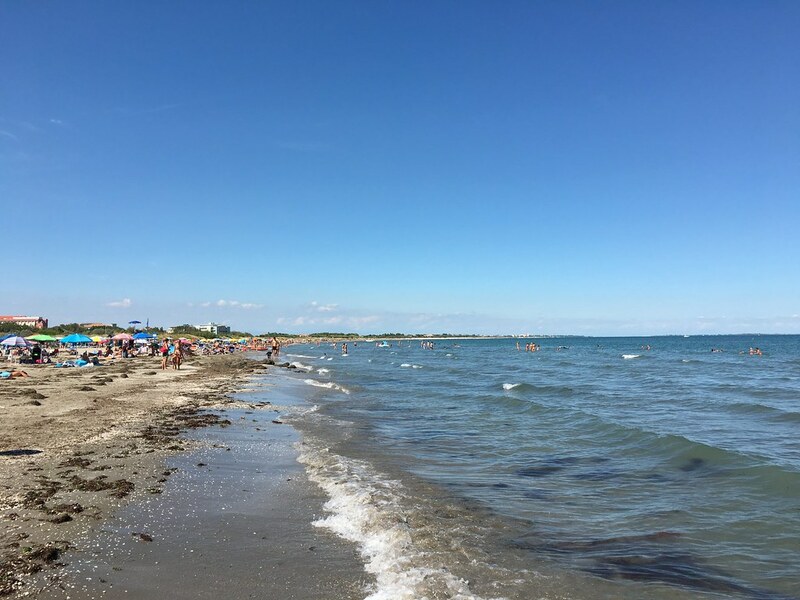 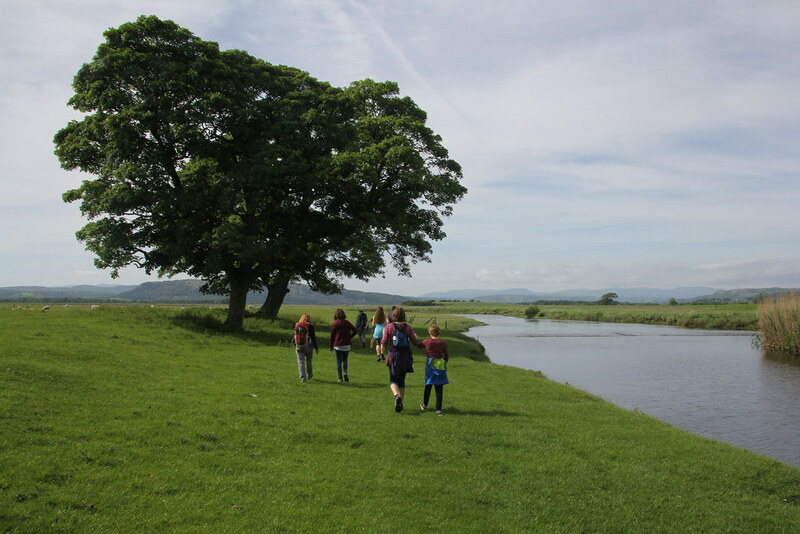 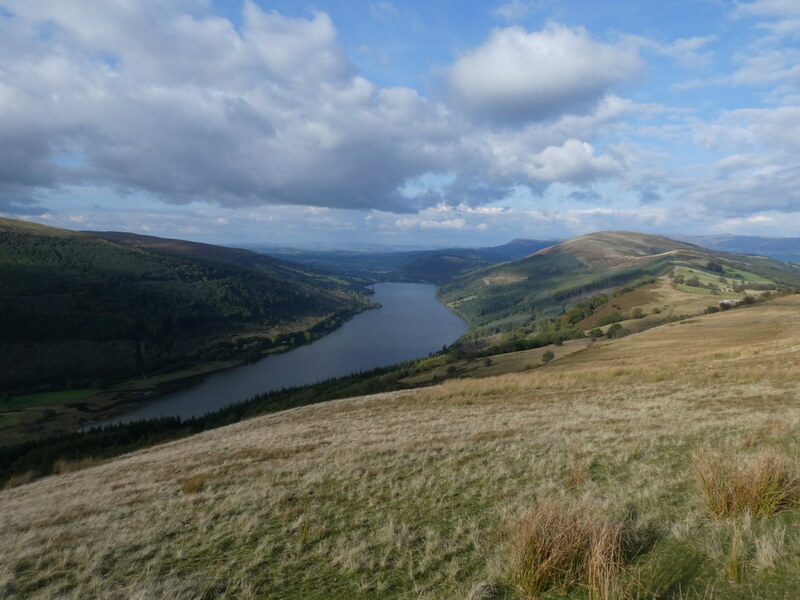 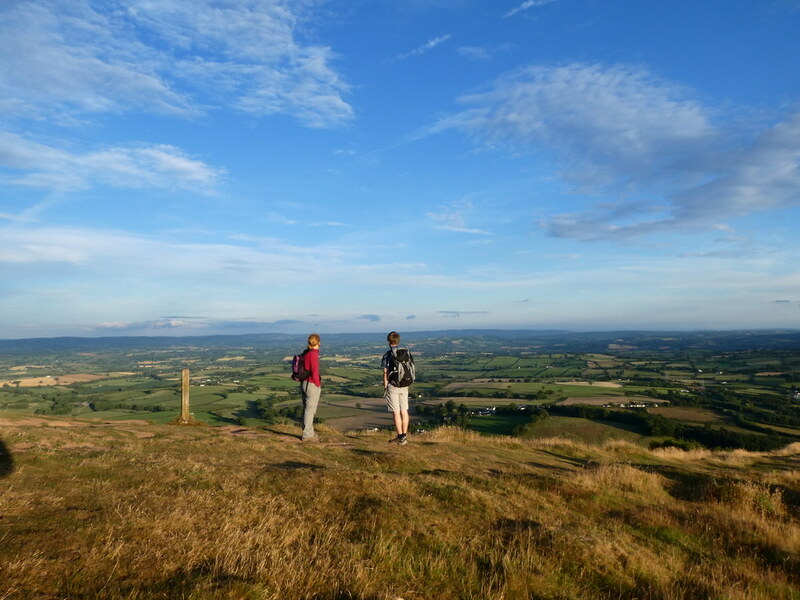 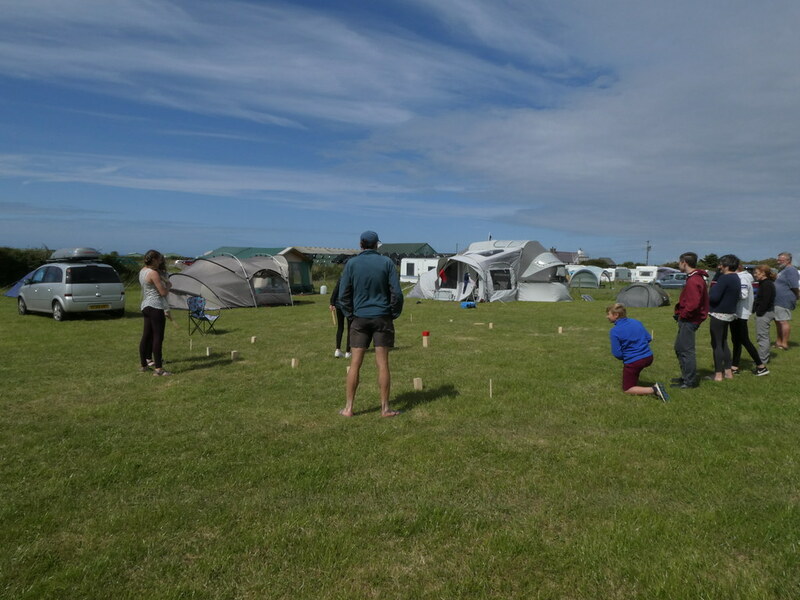 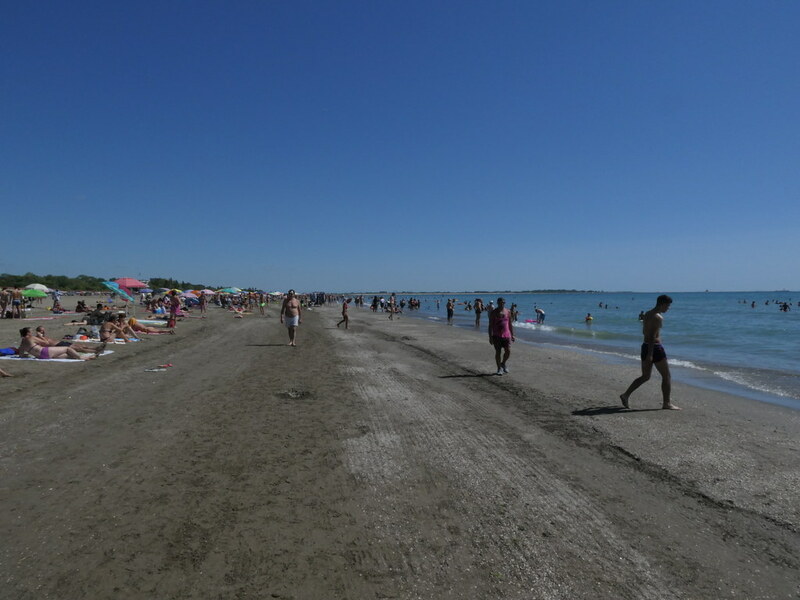 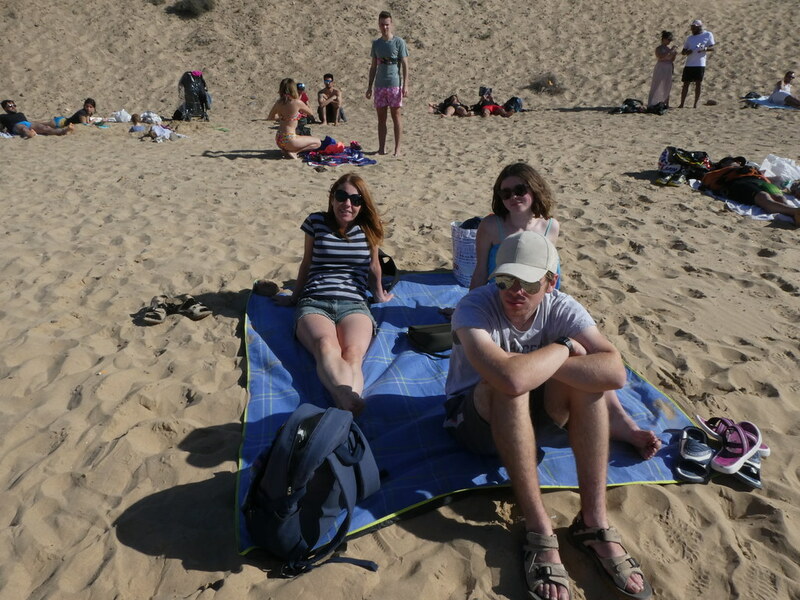 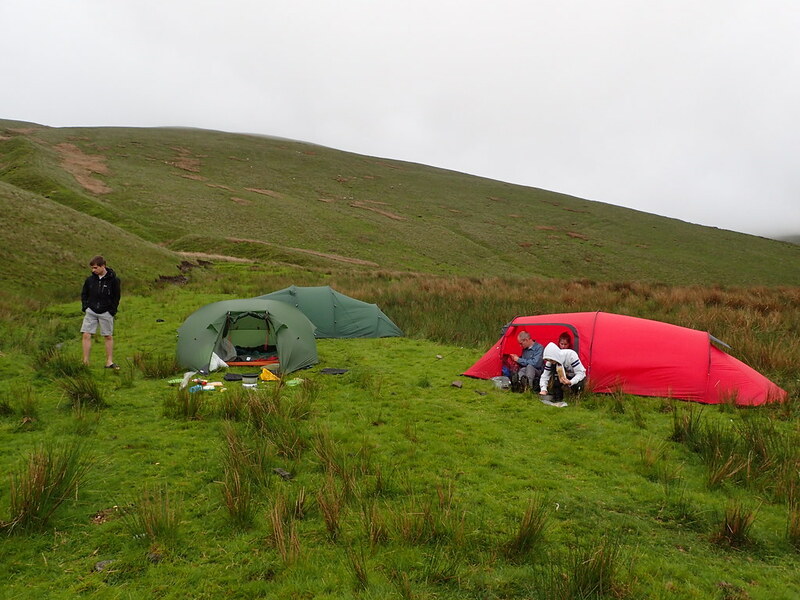 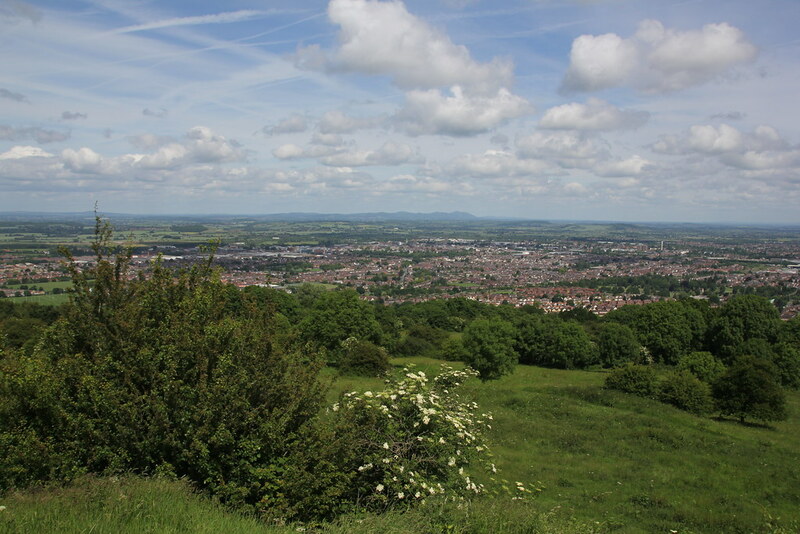 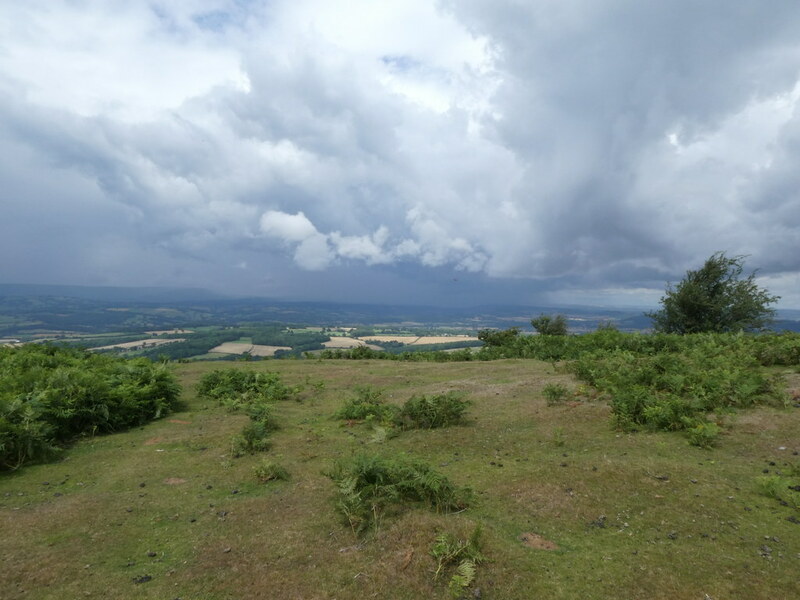 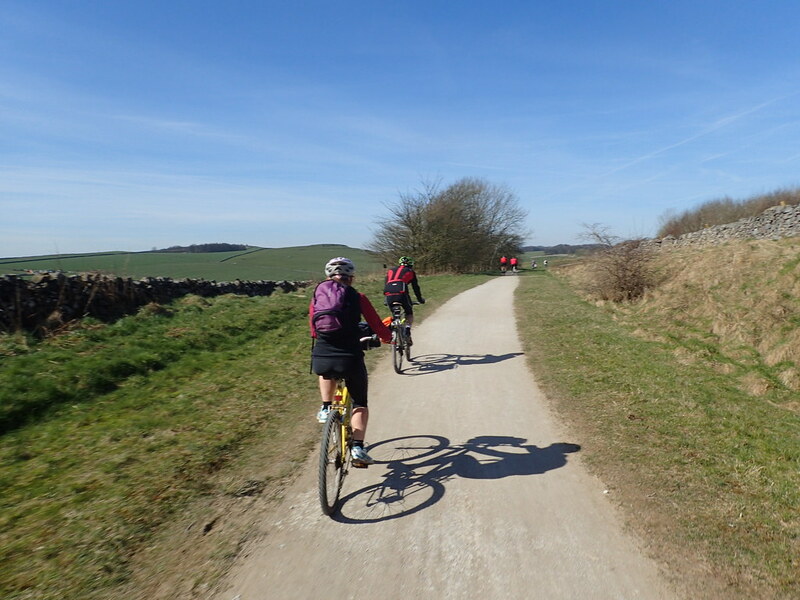 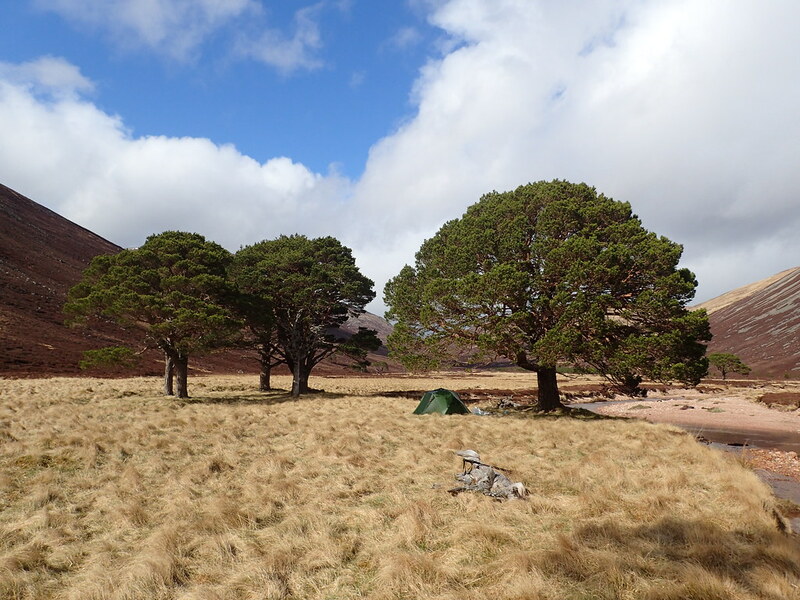 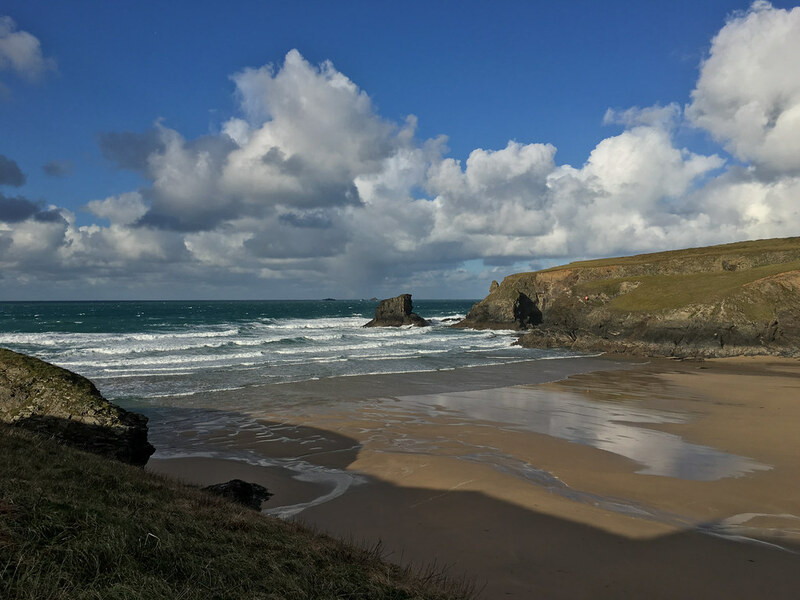 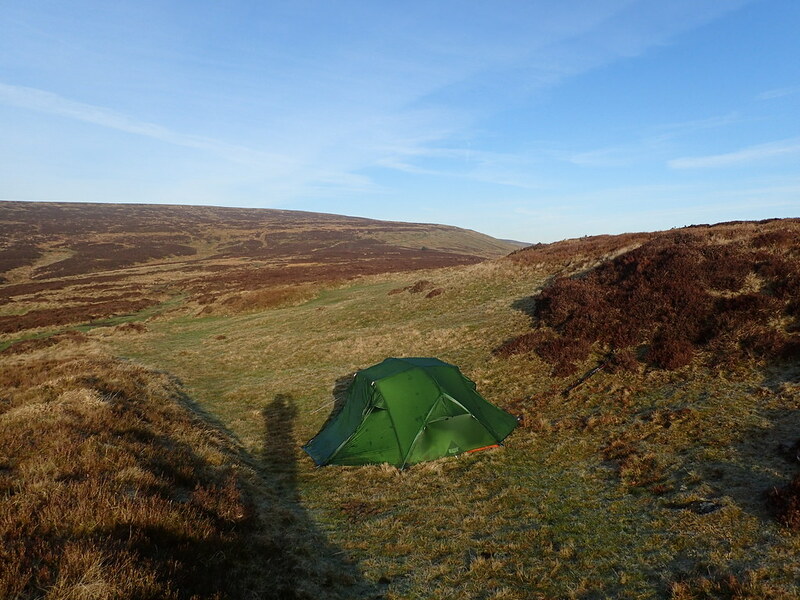 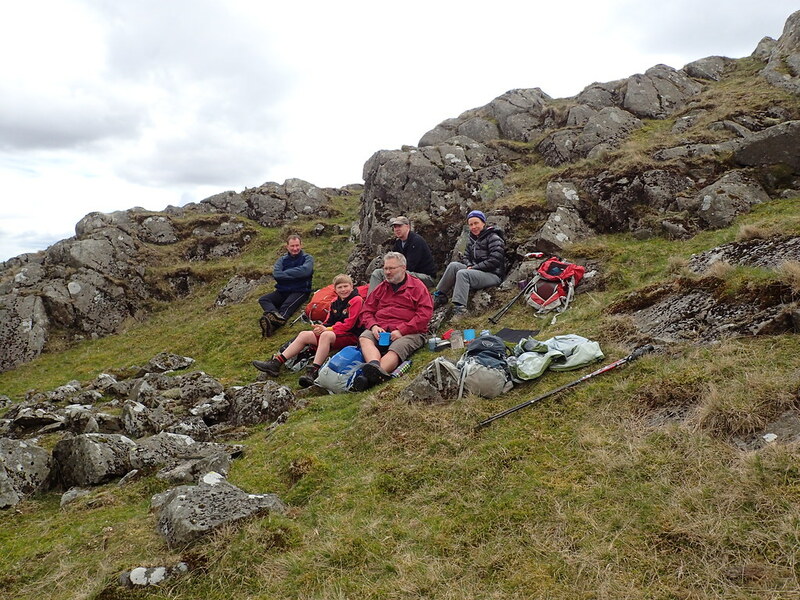 Most of our holidays are spent either on campsites or villas in the countryside so there is no local neighbourhood as such. 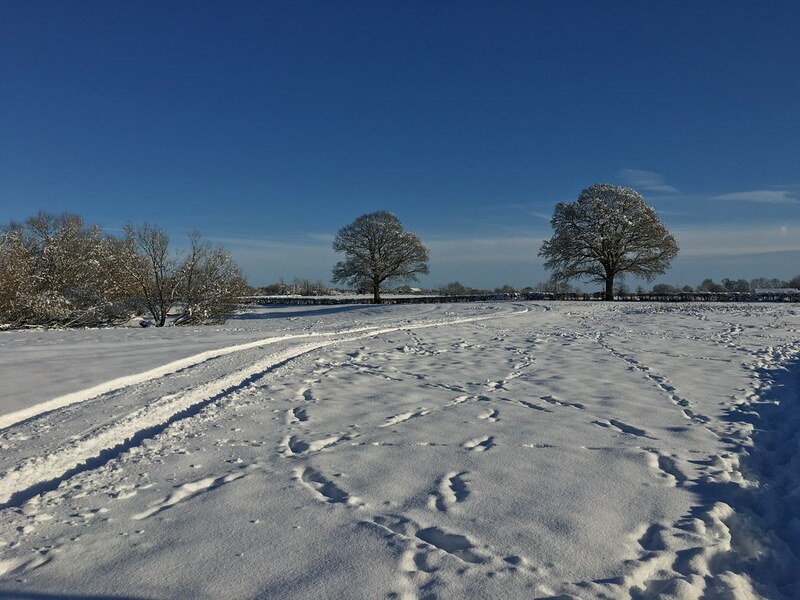 I did most of the shopping and was also the only one of us who got up early enough for a walk before breakfast like this morning. 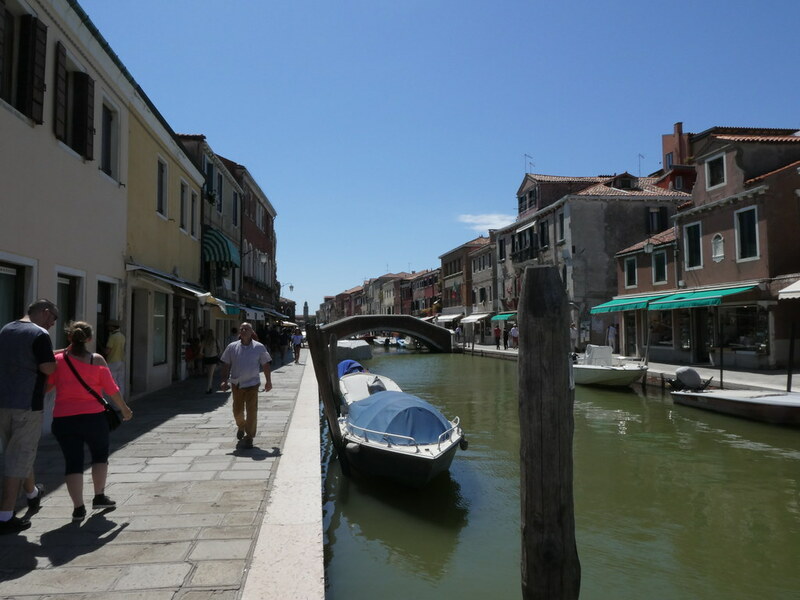 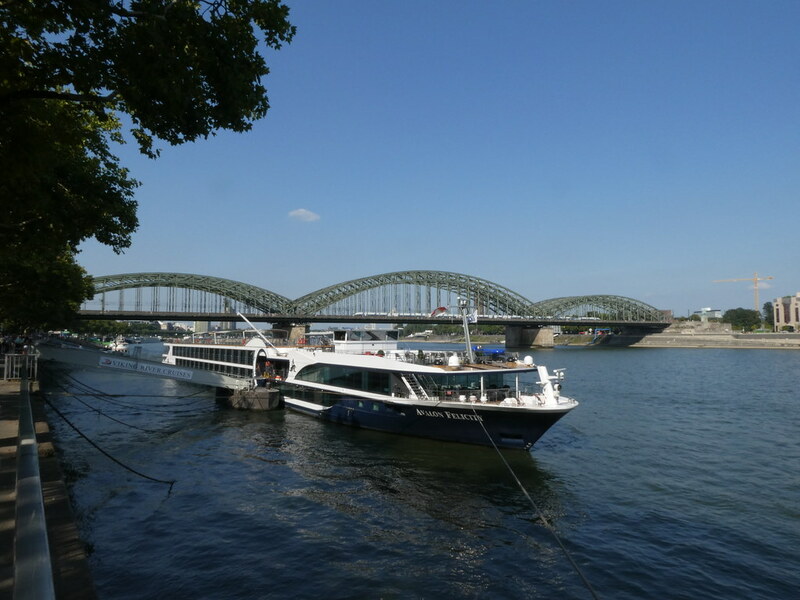 As I wandered about, streets (and canals and bridges) became familiar. 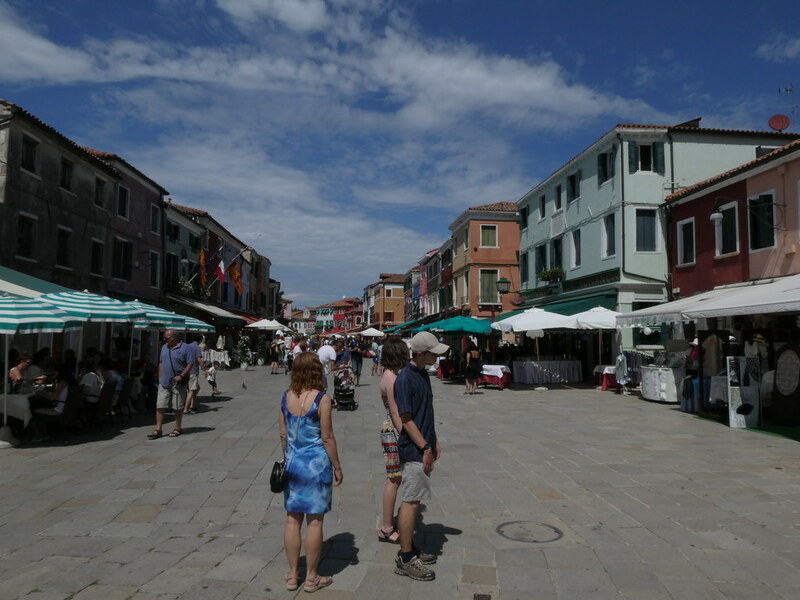 You start to know that the bakery is just around this corner or the supermarket is the other side of that square. 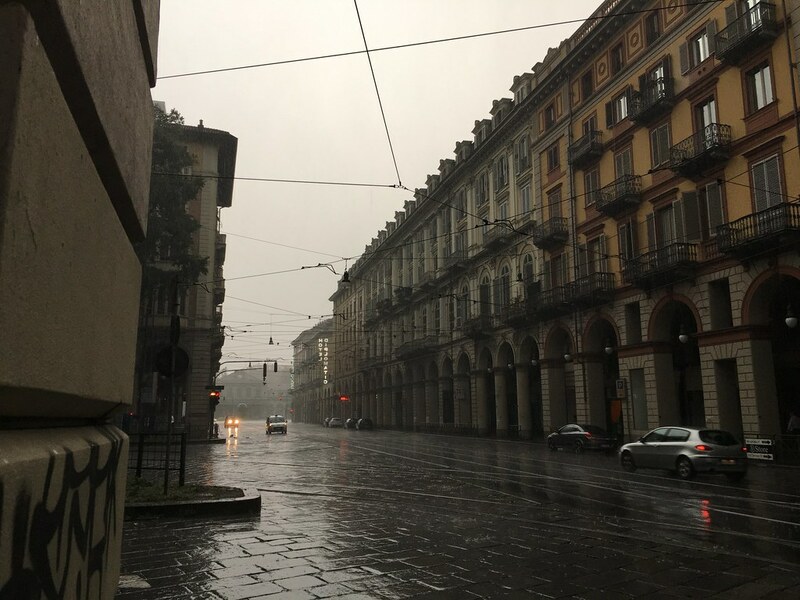 It started to feel like home. 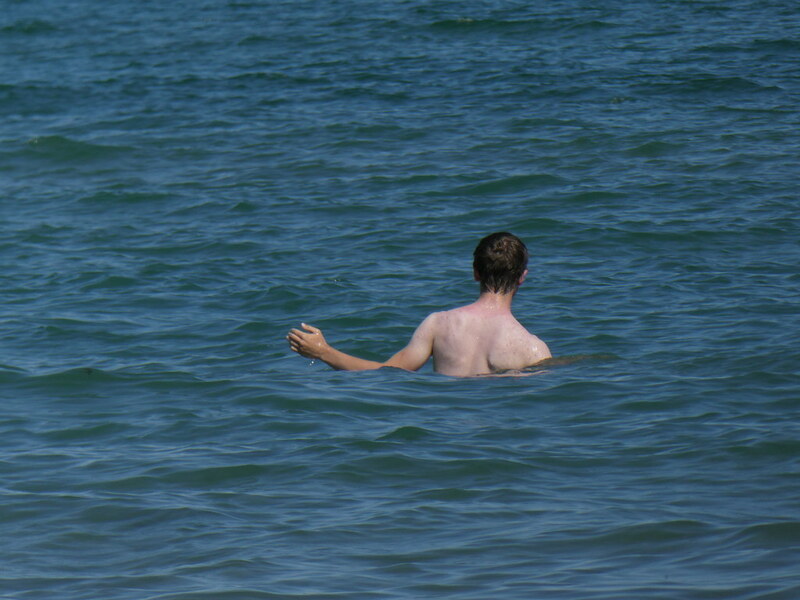 I loved that. 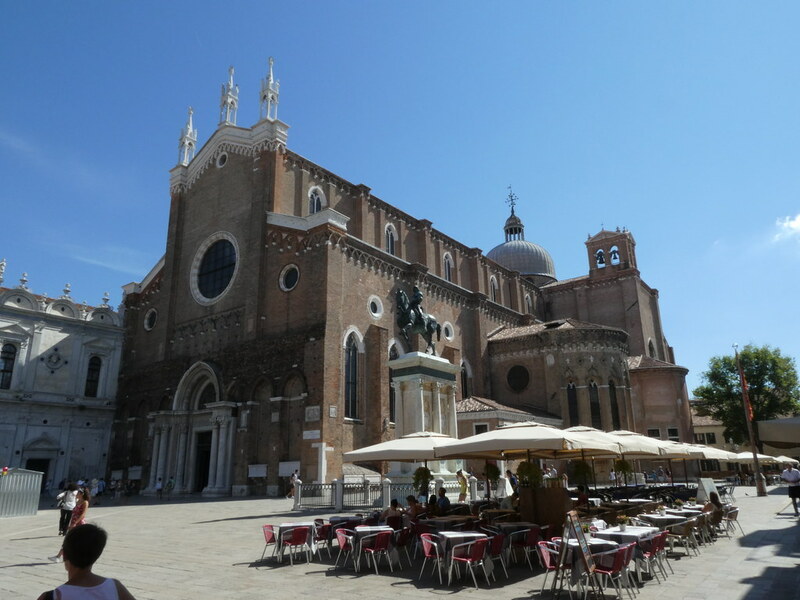 I eventually turned a corner and found myself in the Campo Santi Giovanni e Paolo. 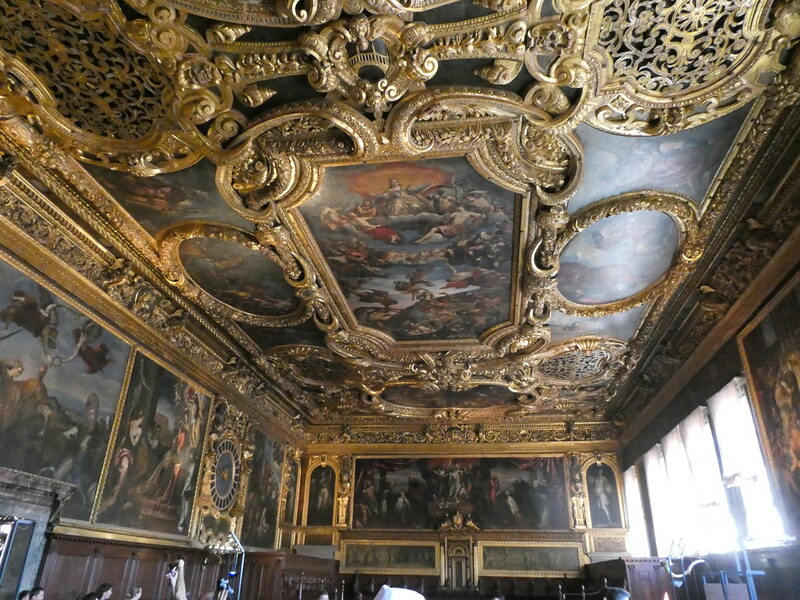 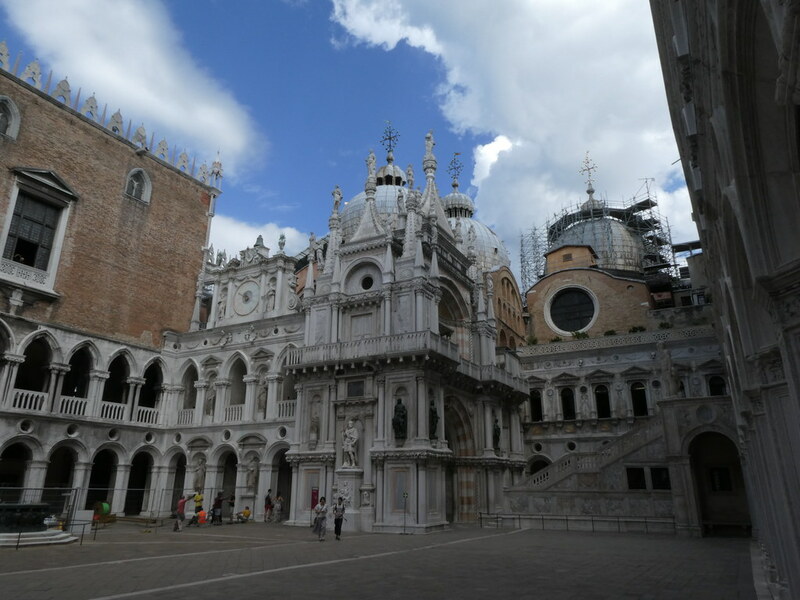 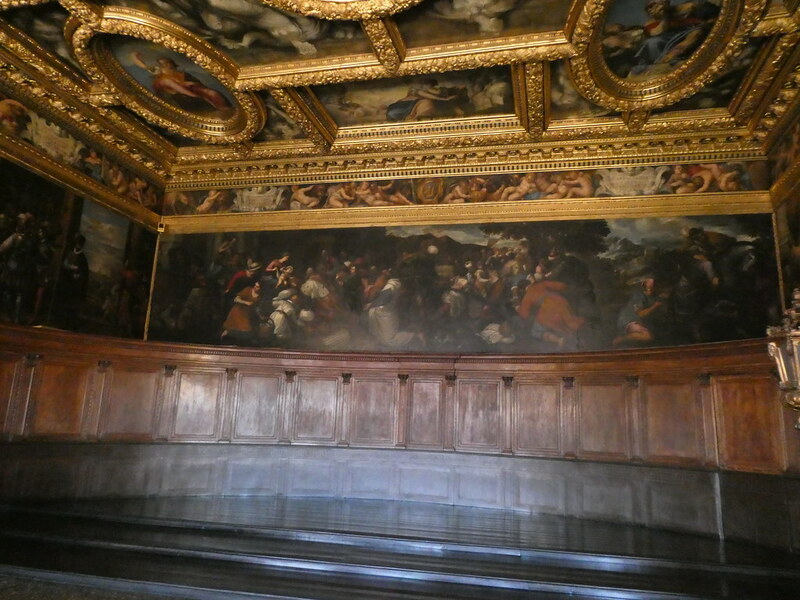 On one side was the Scuola Grande di San Marco. 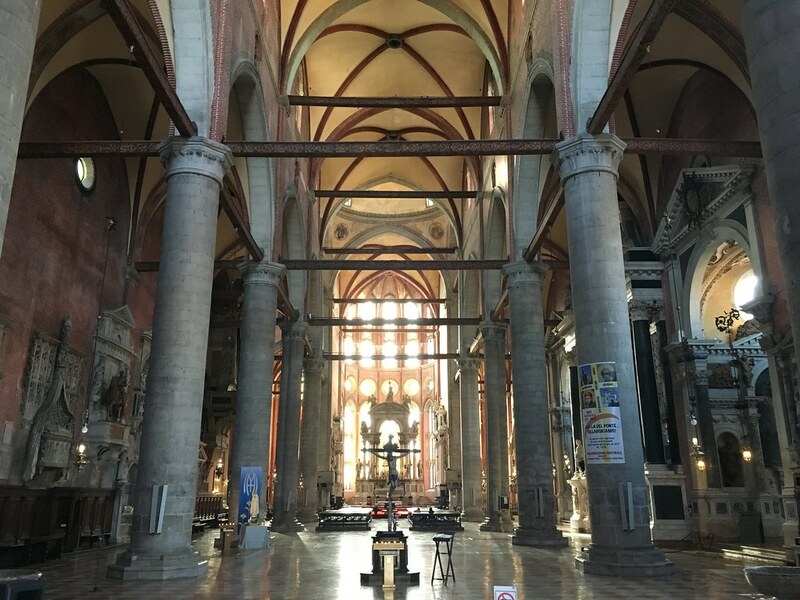 On the other the massive Basilica Santi Giovanni e Paolo. 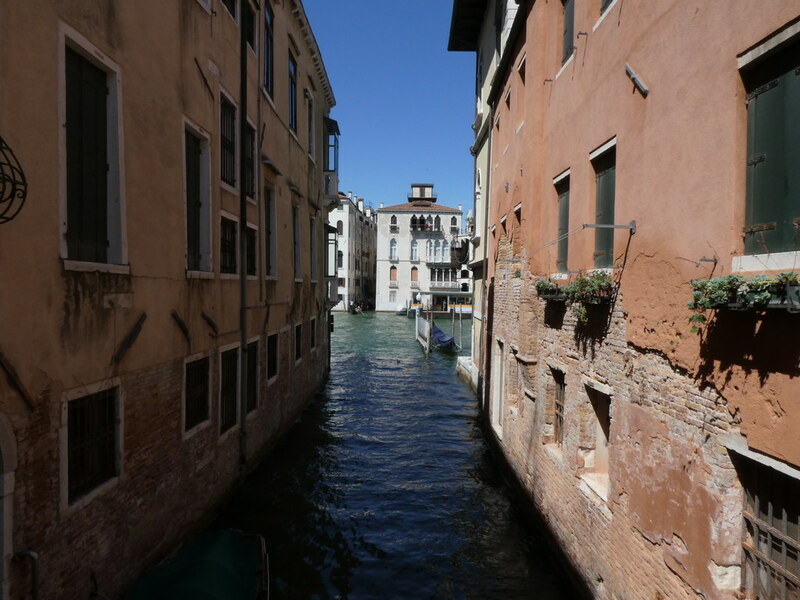 When looking at these massive buildings the thought occurred as to their foundations. 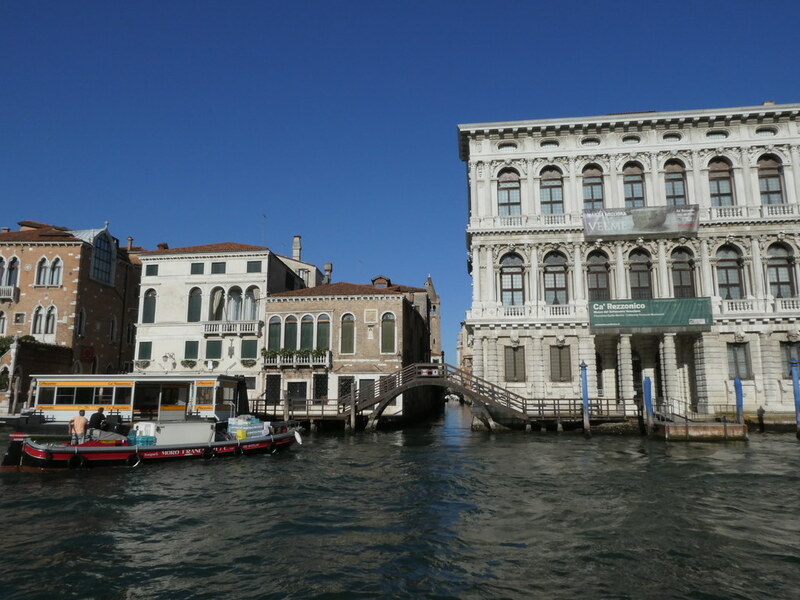 Considering that Venice is effectively a sand bar its amazing these buildings don’t just sink. 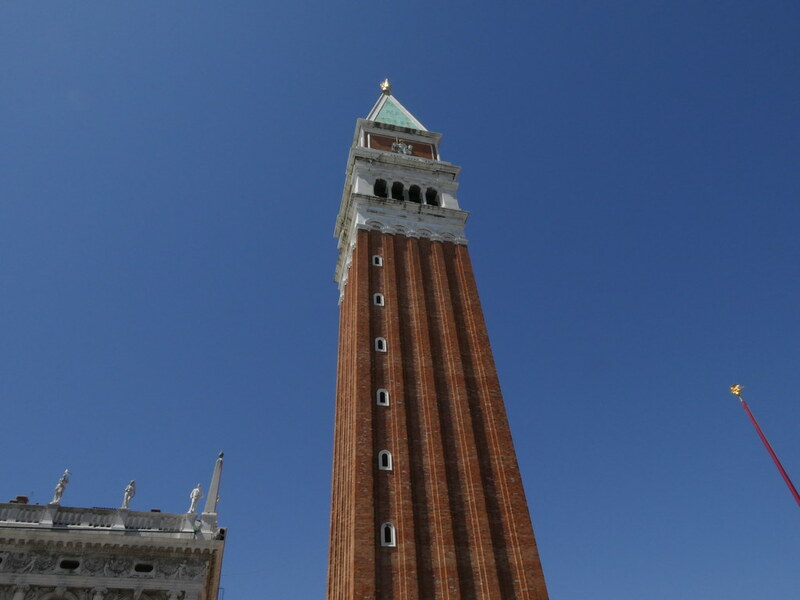 They are marvel of engineering if you ask me. 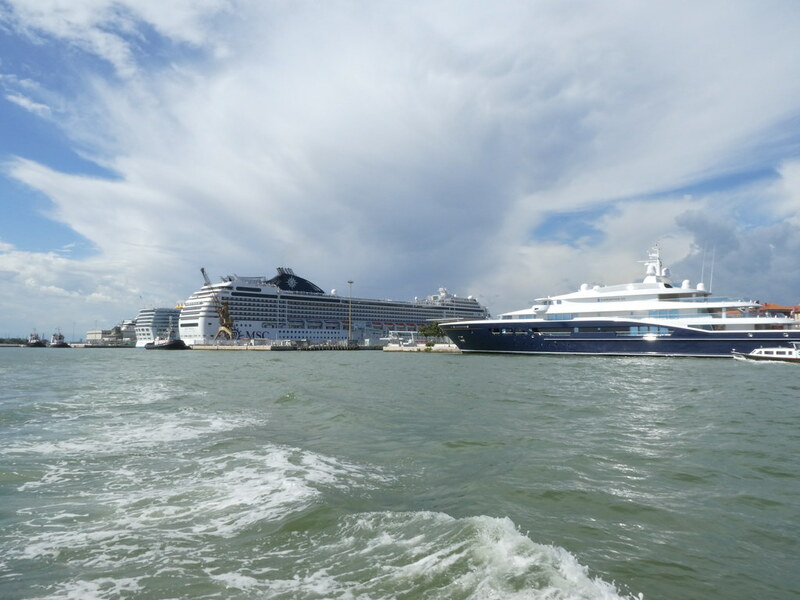 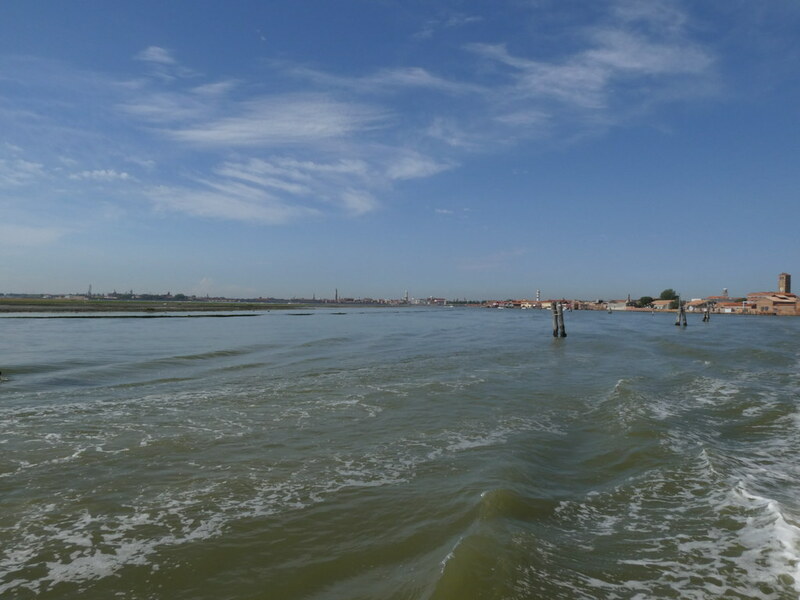 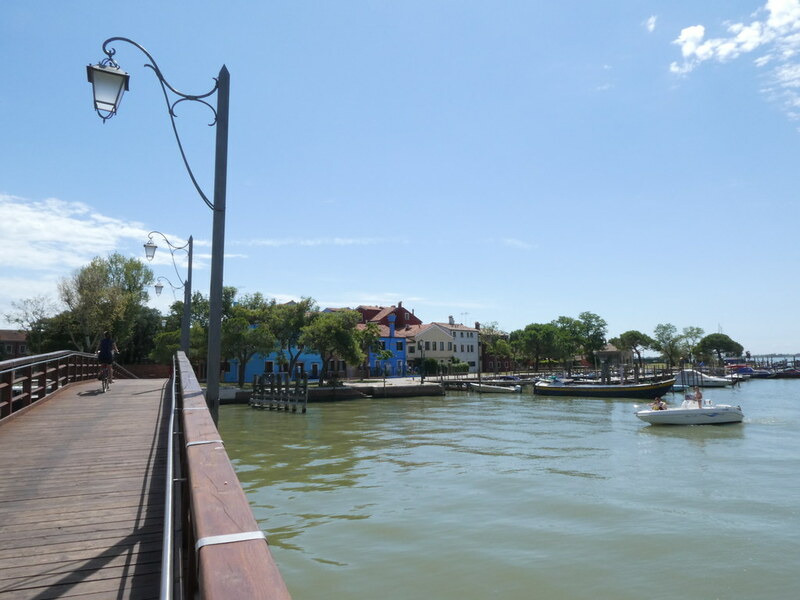 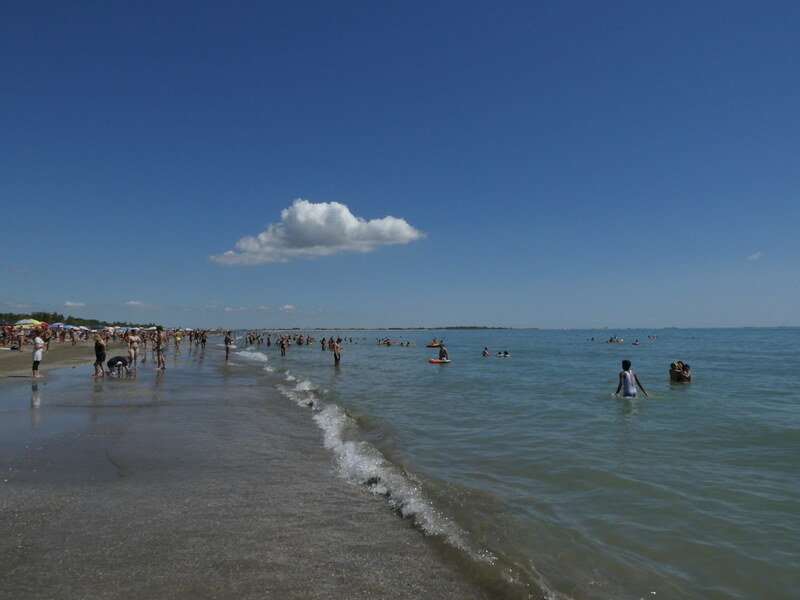 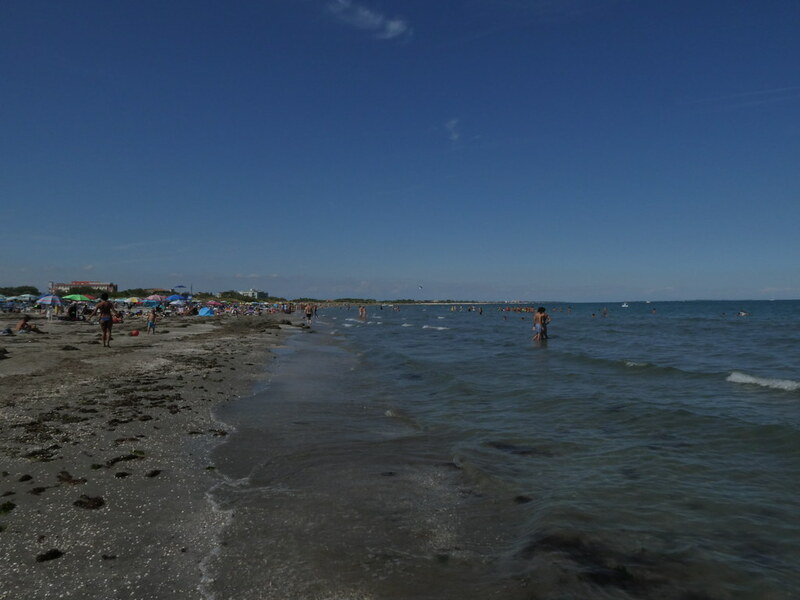 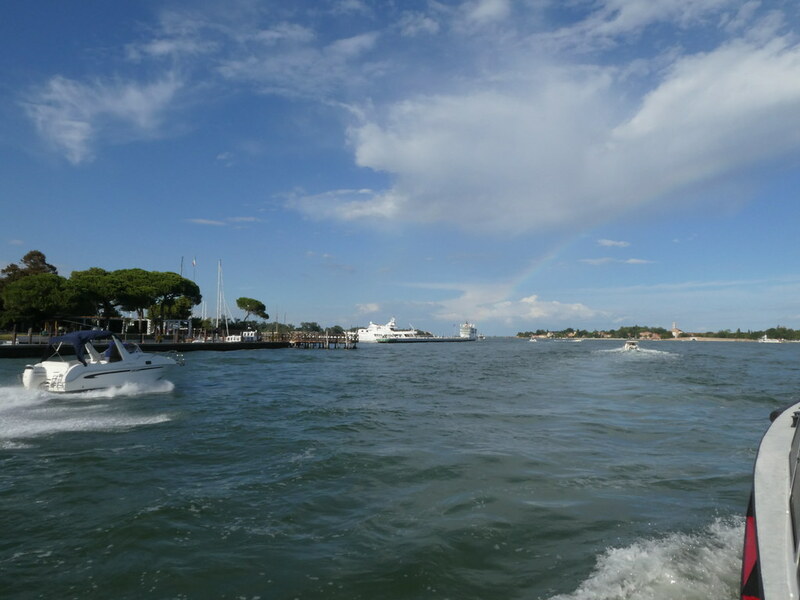 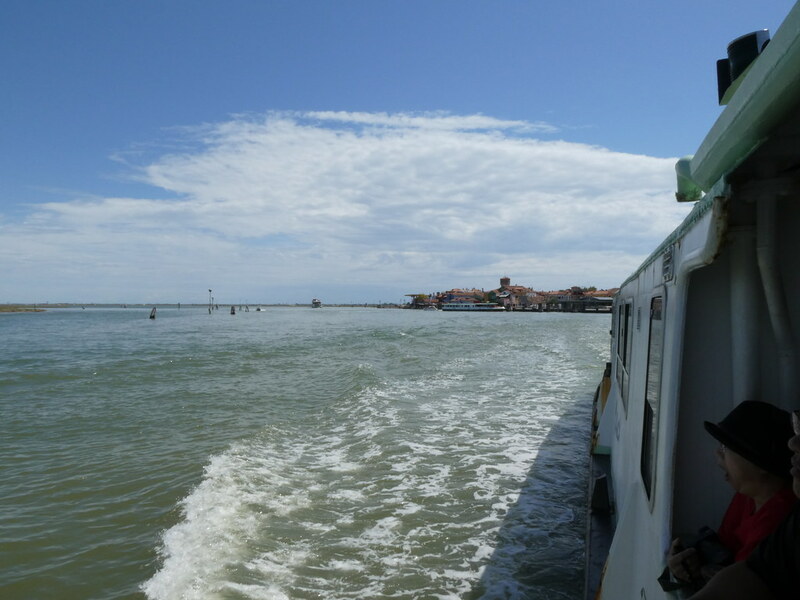 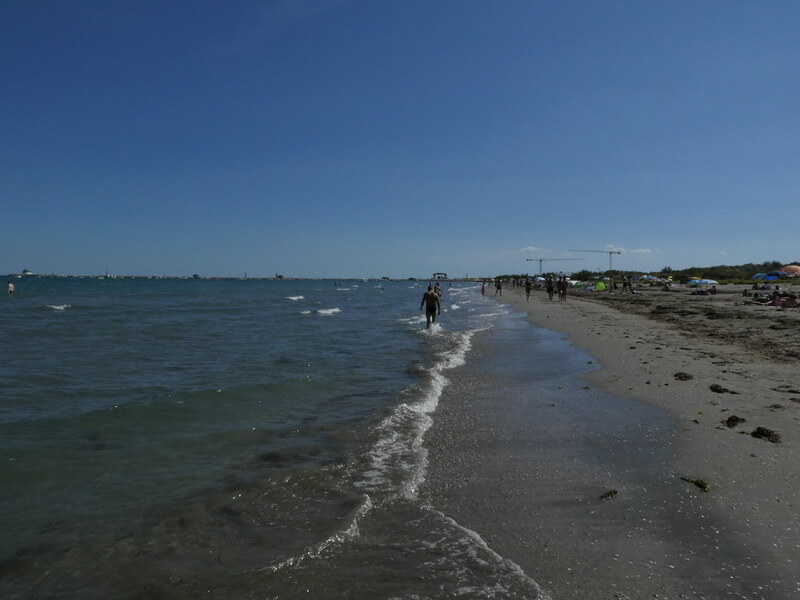 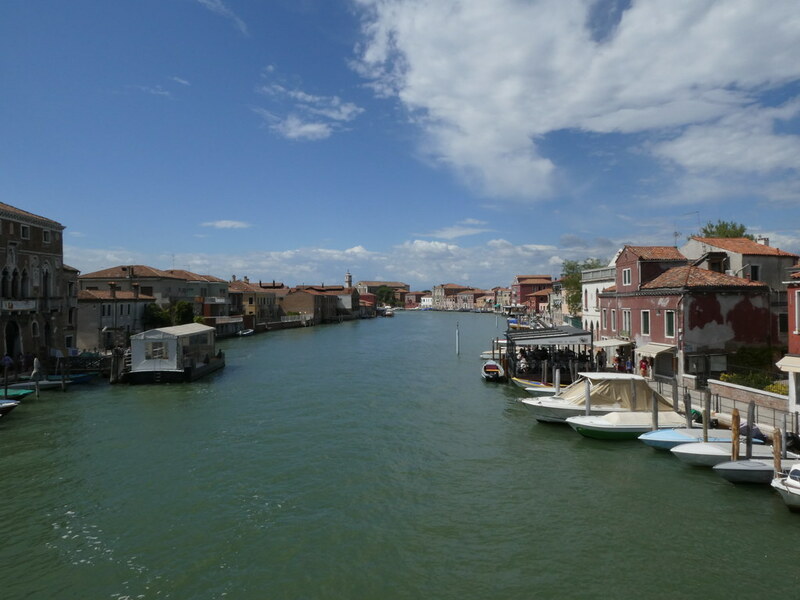 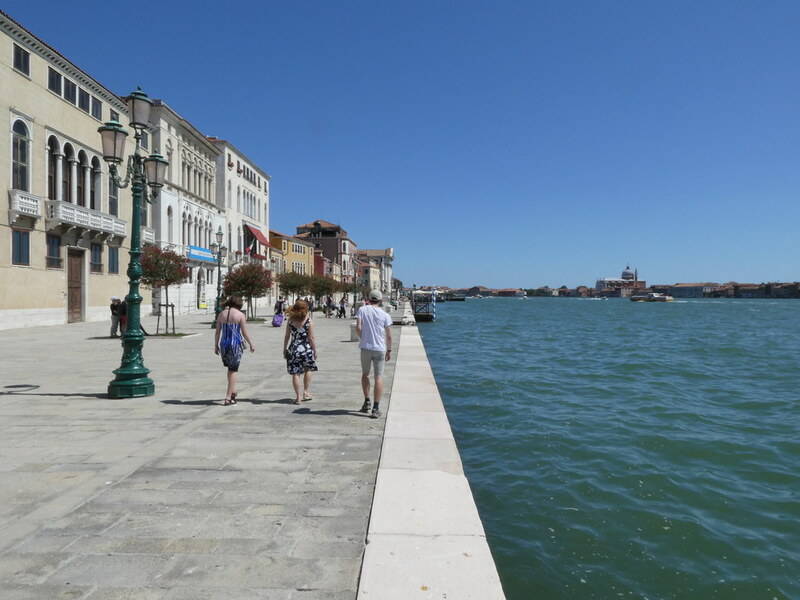 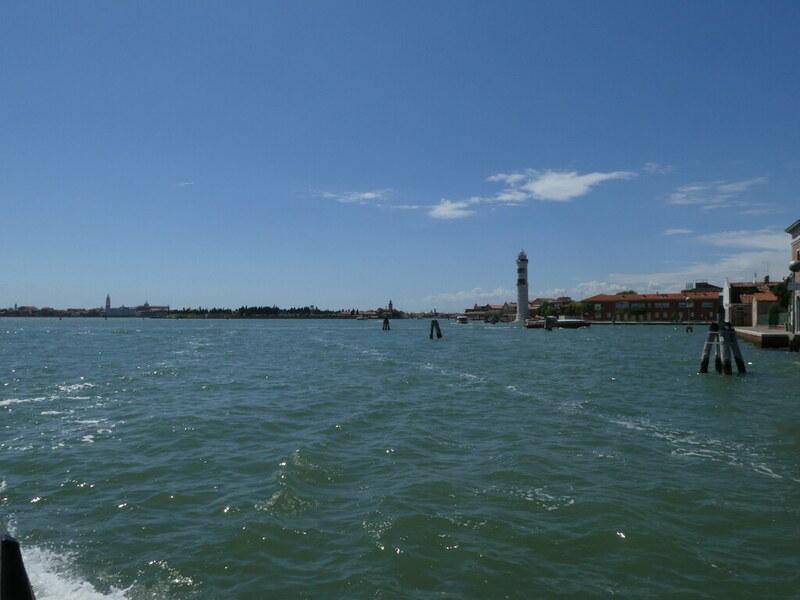 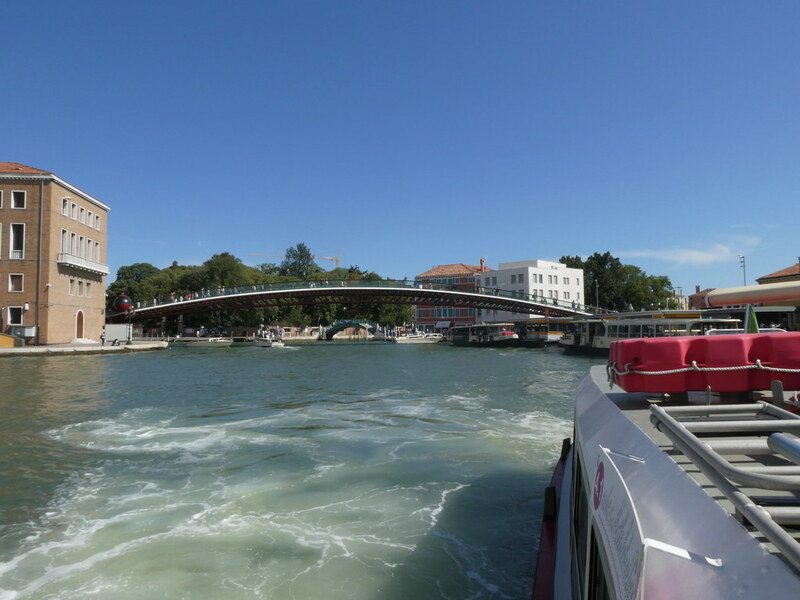 We were headed to the northern island of Burano. 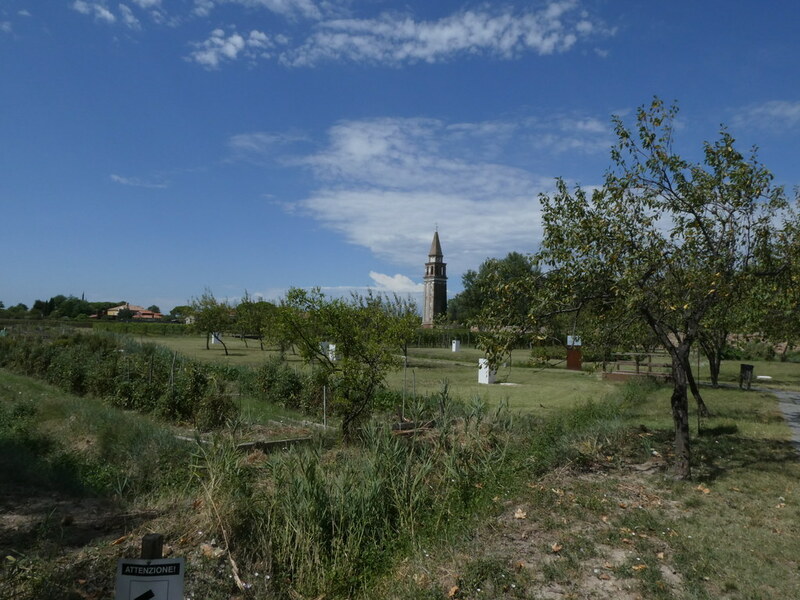 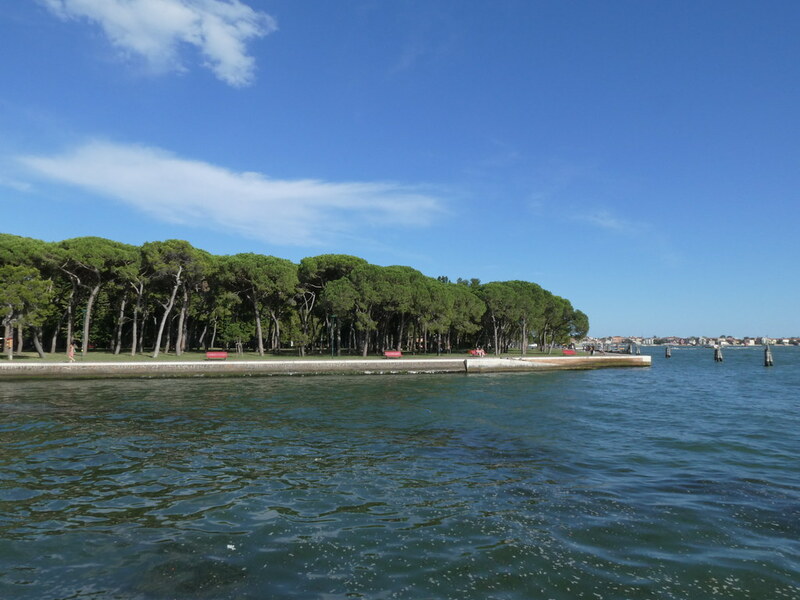 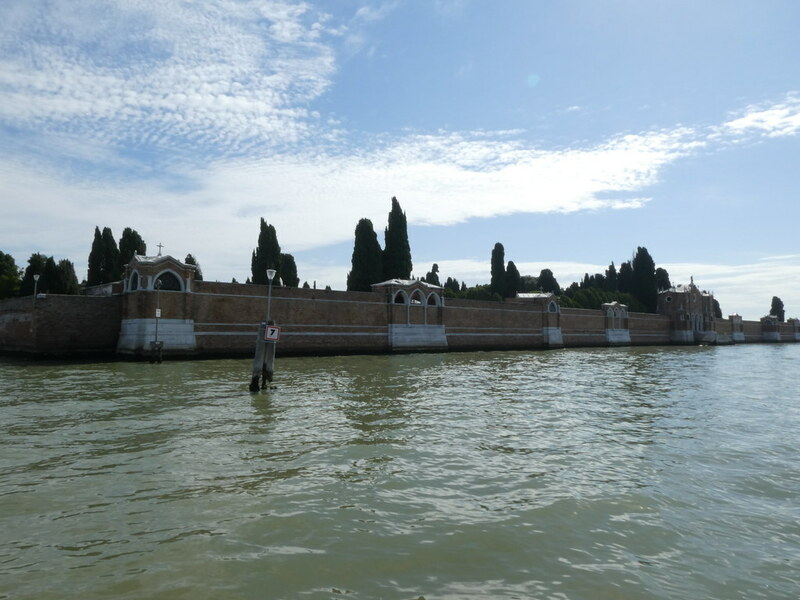 Passing by the Cemetery island of San Michele. 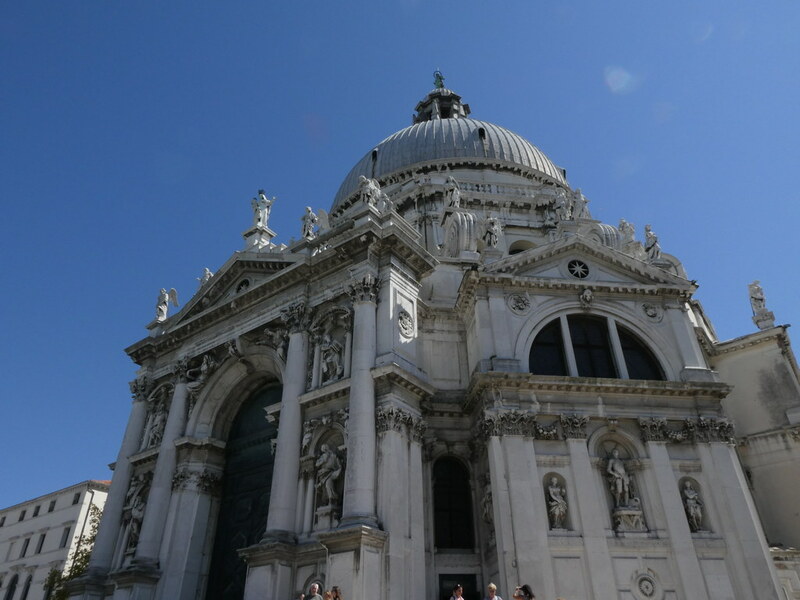 Igor Stravinsky is buried on there among others. 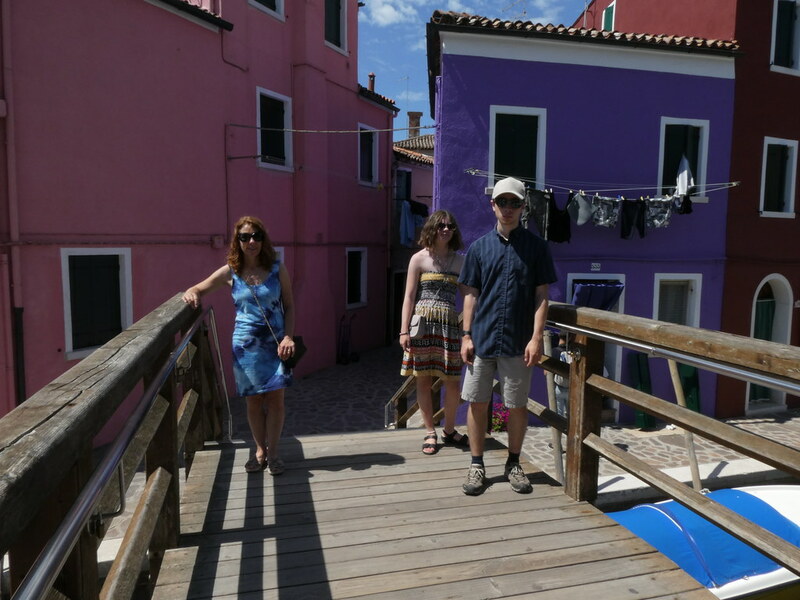 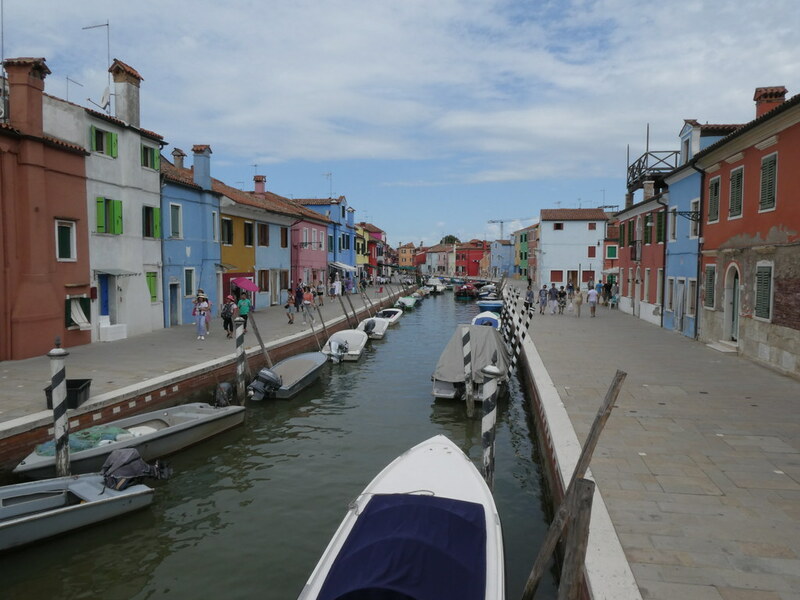 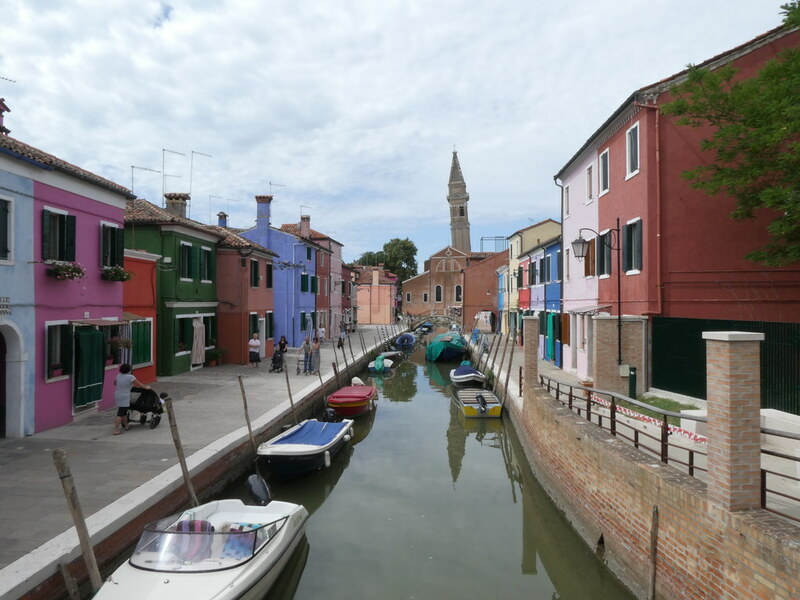 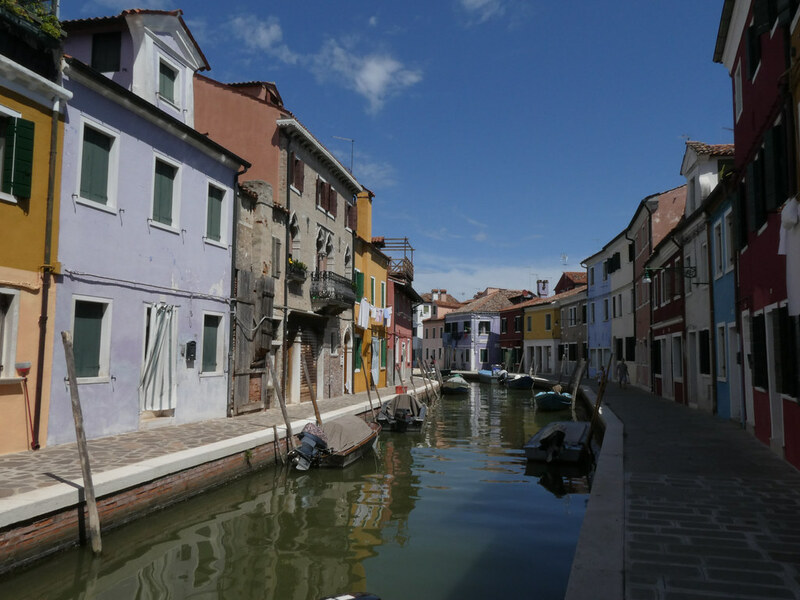 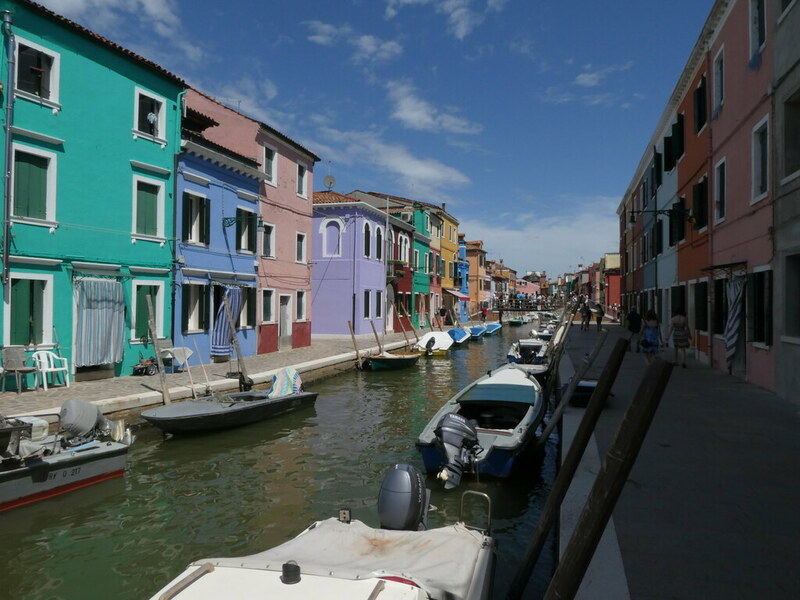 Burano is famous for its brightly coloured houses. 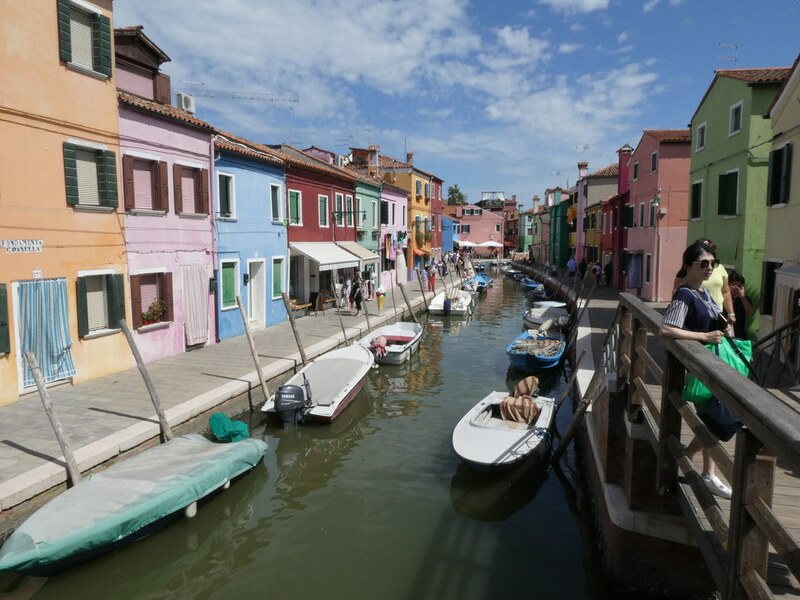 I read somewhere that its a deliberate ploy to attract visitors and that even the washing hung up is planned to be multicoloured to keep up the impression. 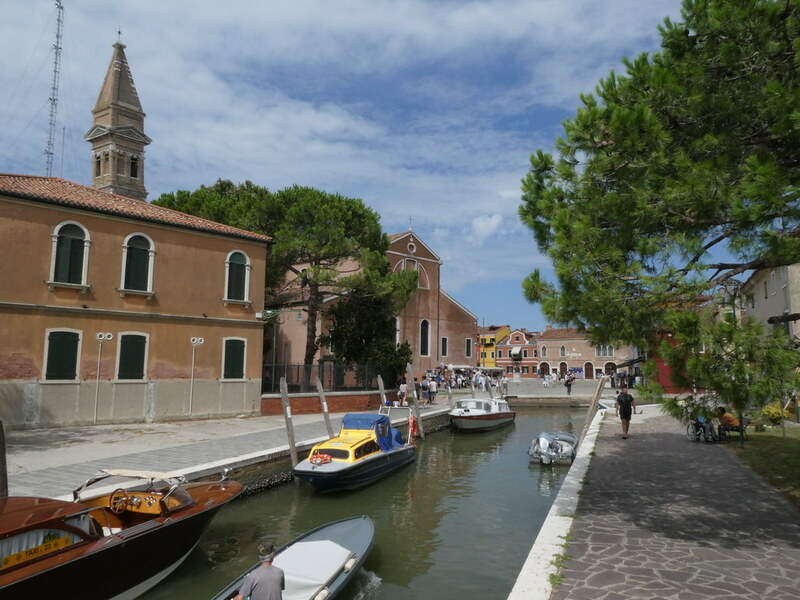 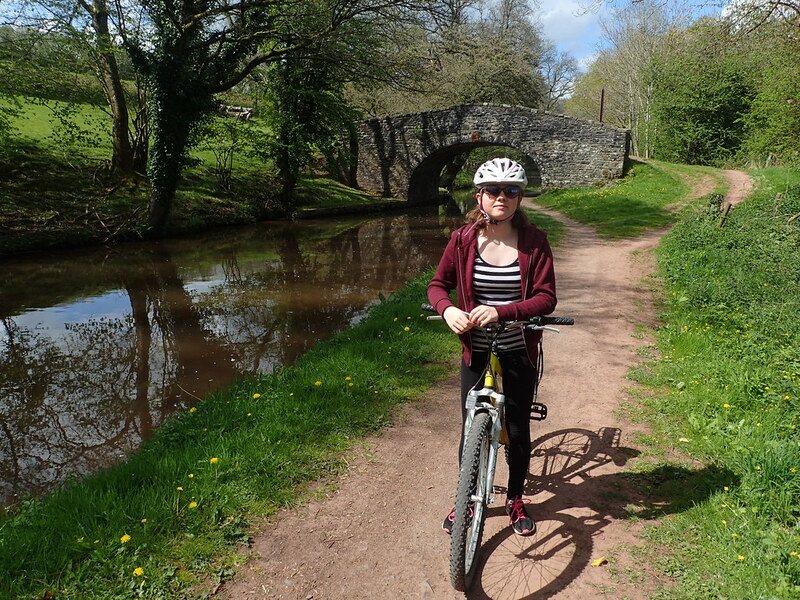 We found a pleasant shady wall next to a canal to sit and eat our lunch from a local sandwich shop. 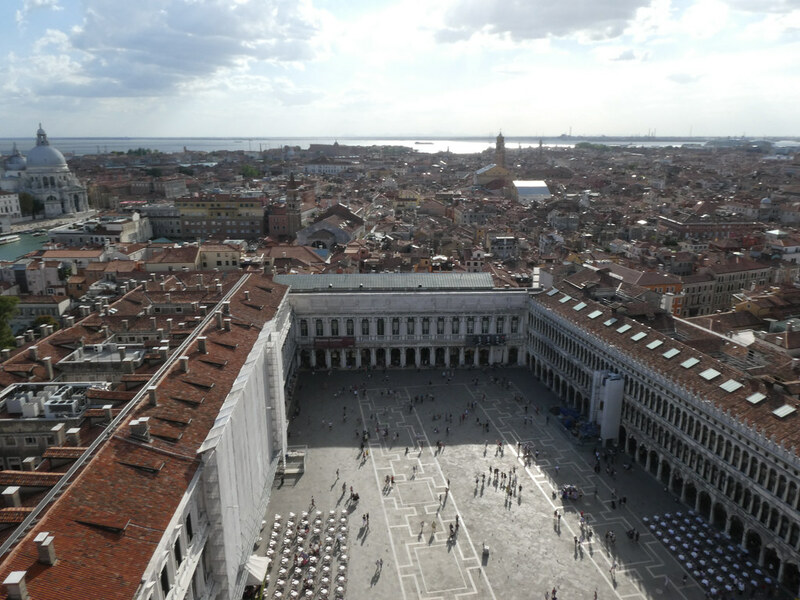 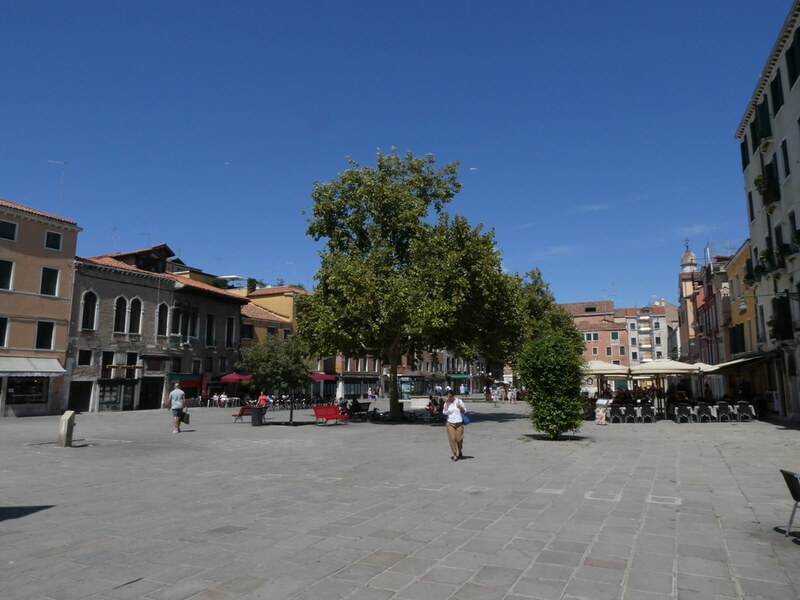 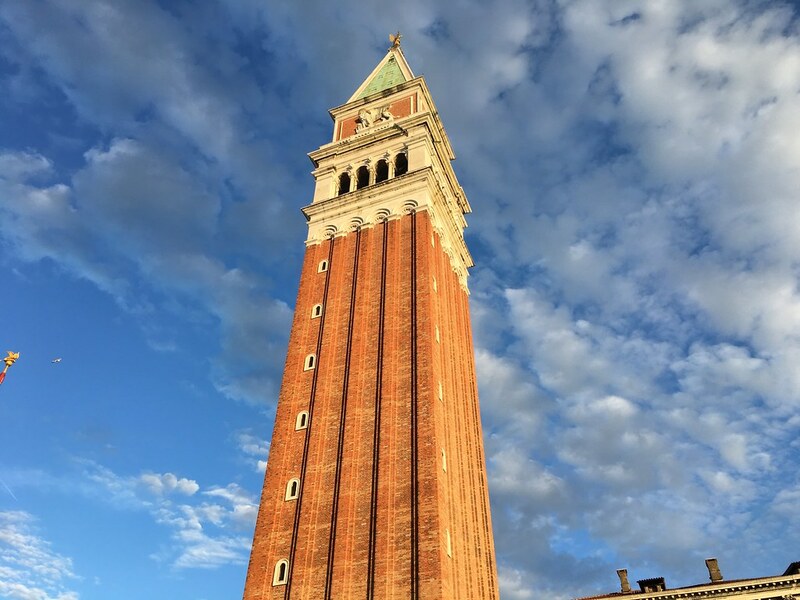 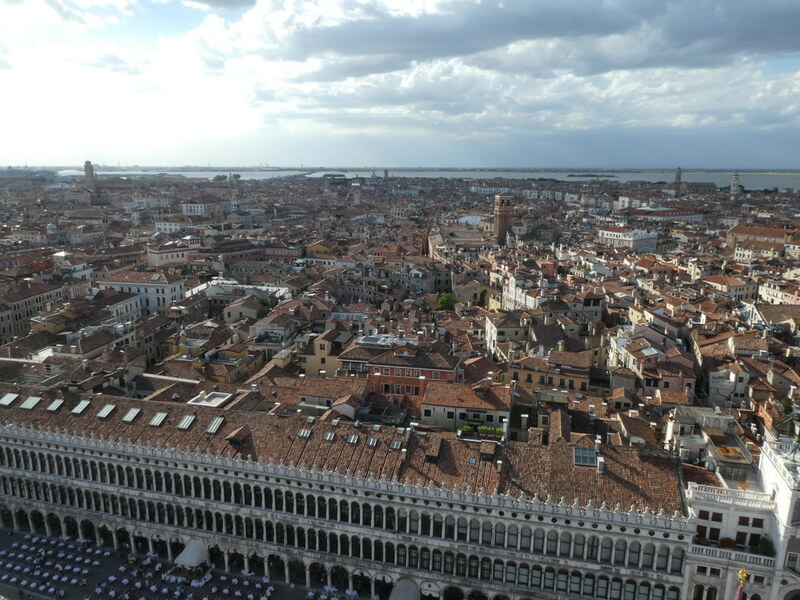 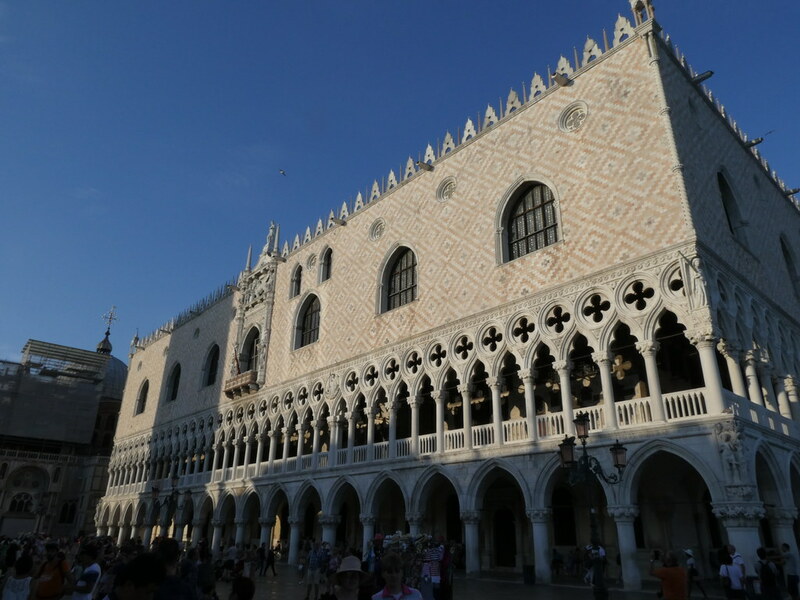 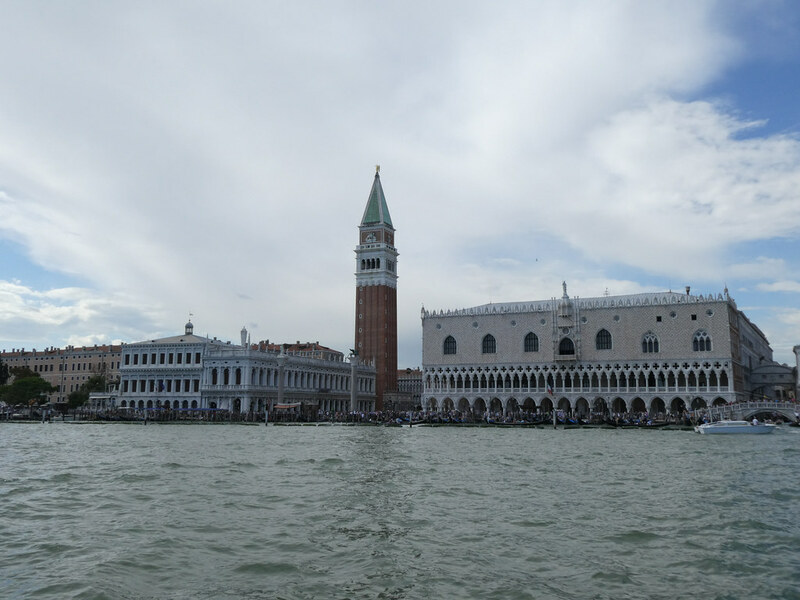 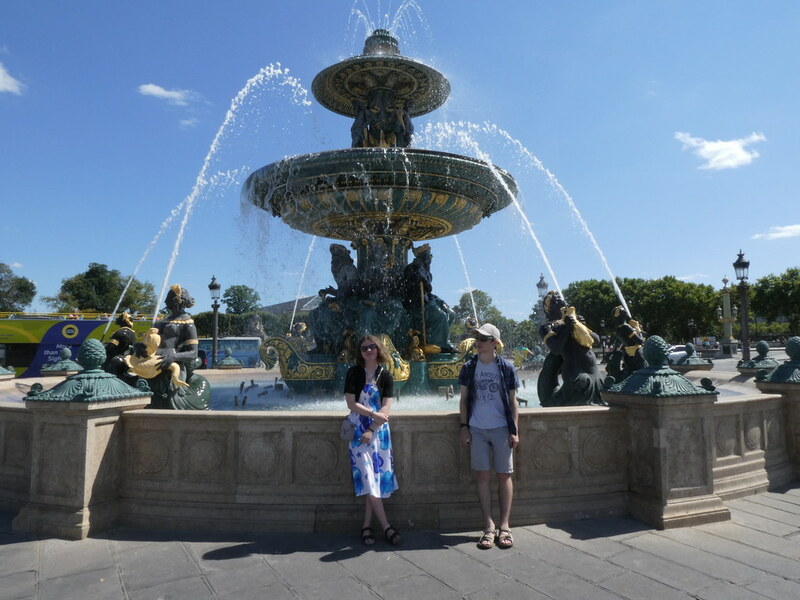 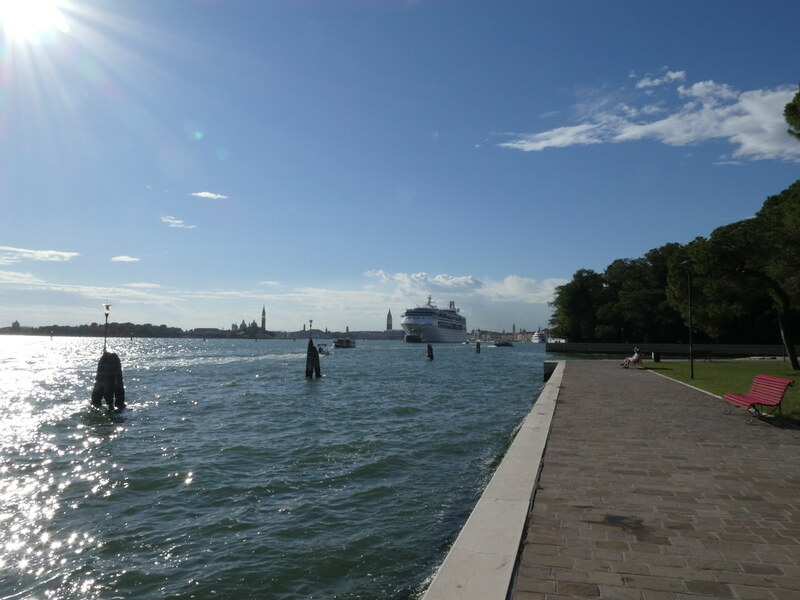 As you saw from previous posts Piazza San Marco has lots to offer and two of it sights deserved their own post. 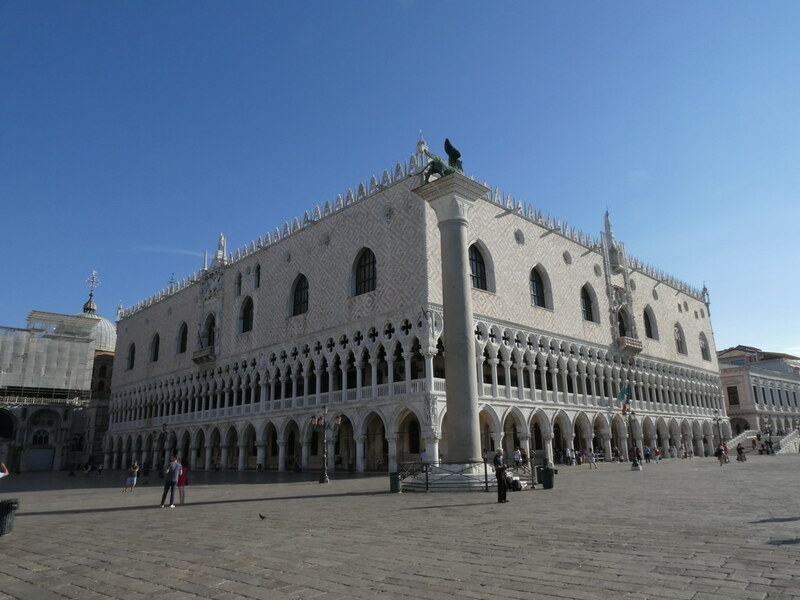 The Palazzo Ducale. 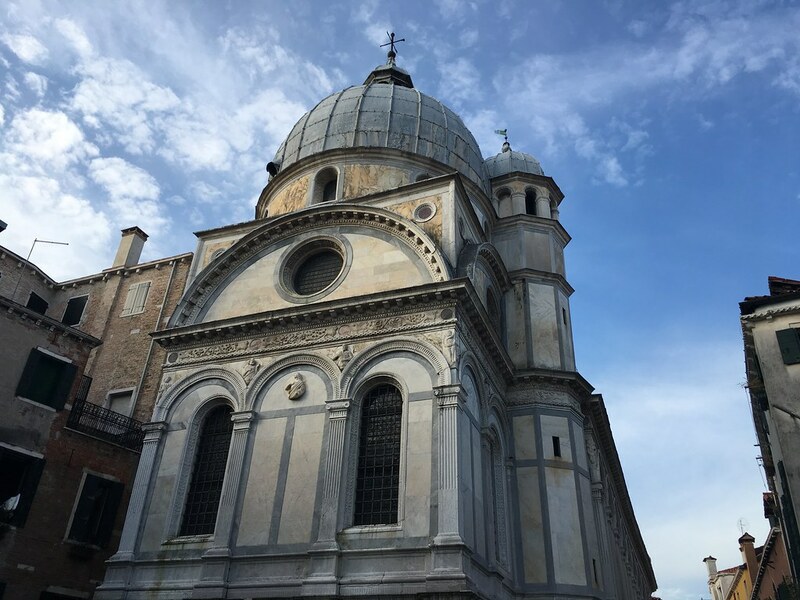 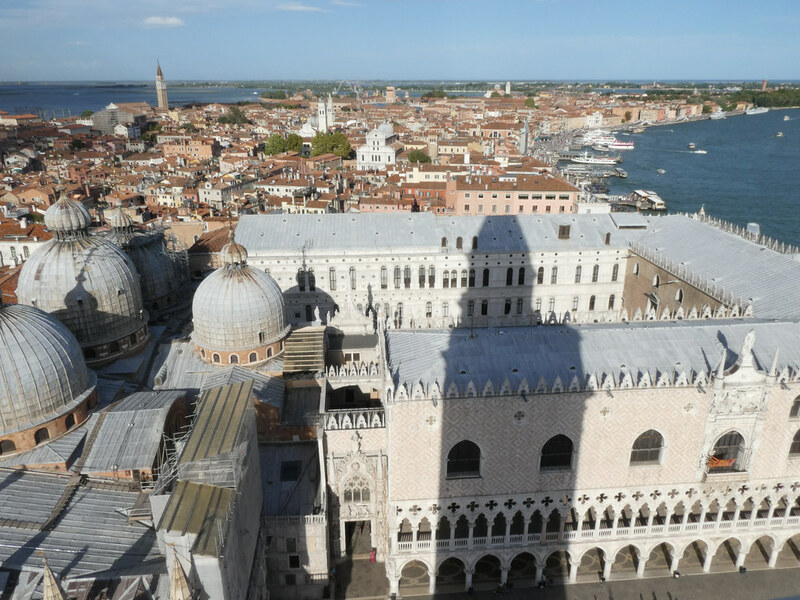 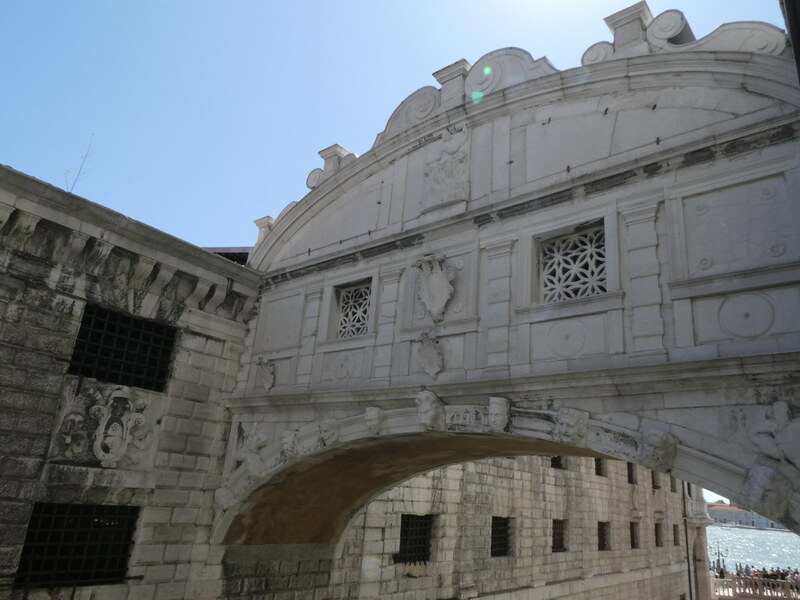 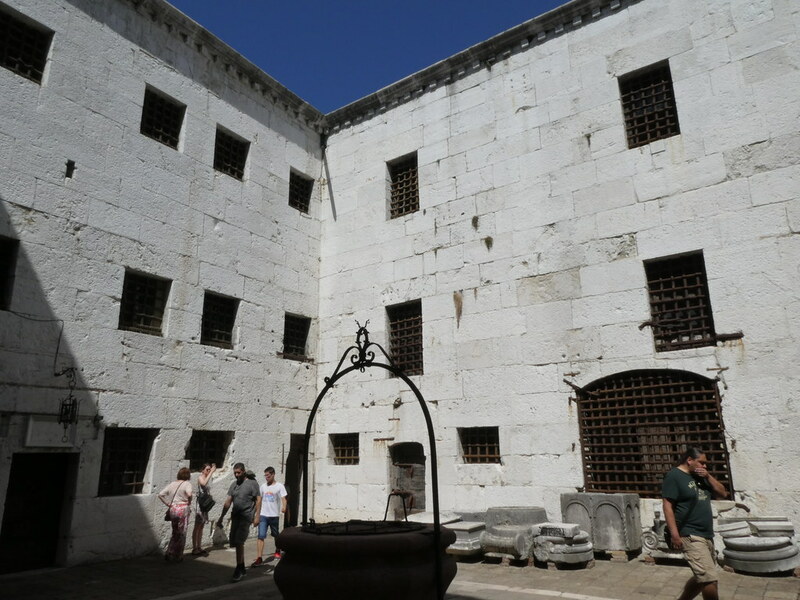 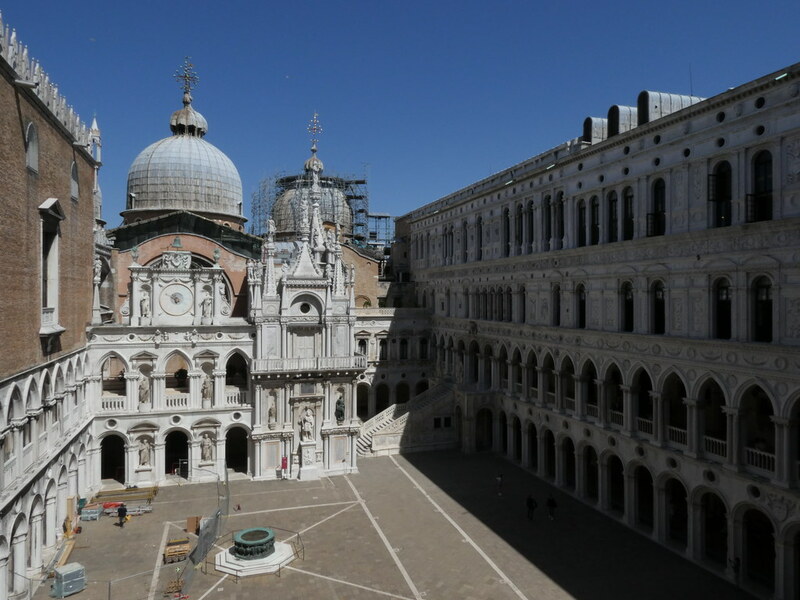 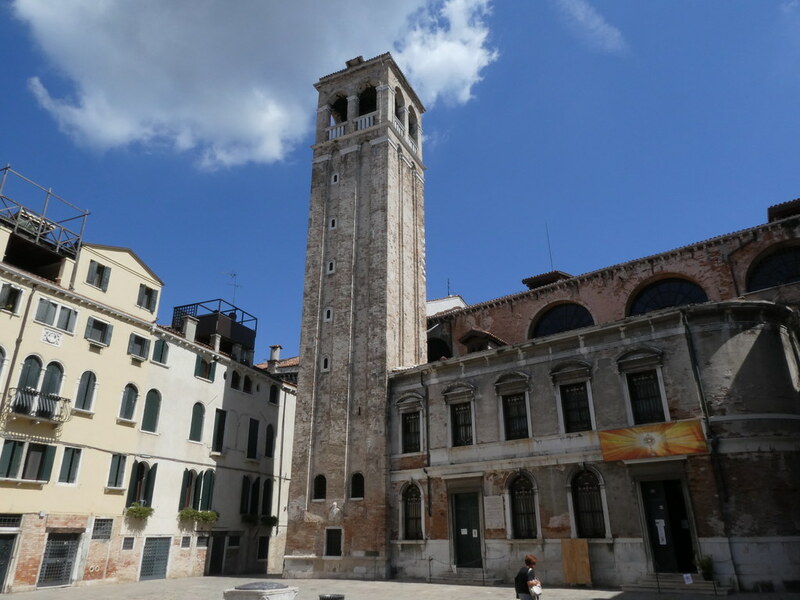 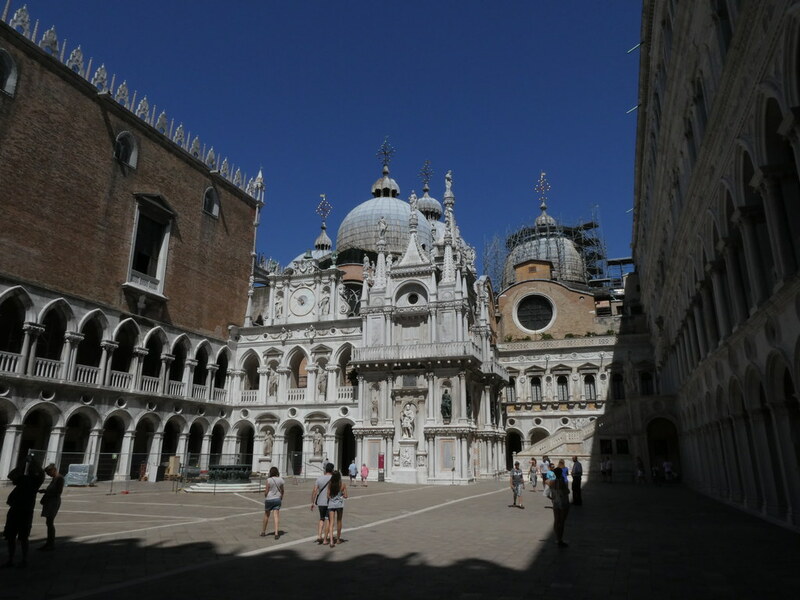 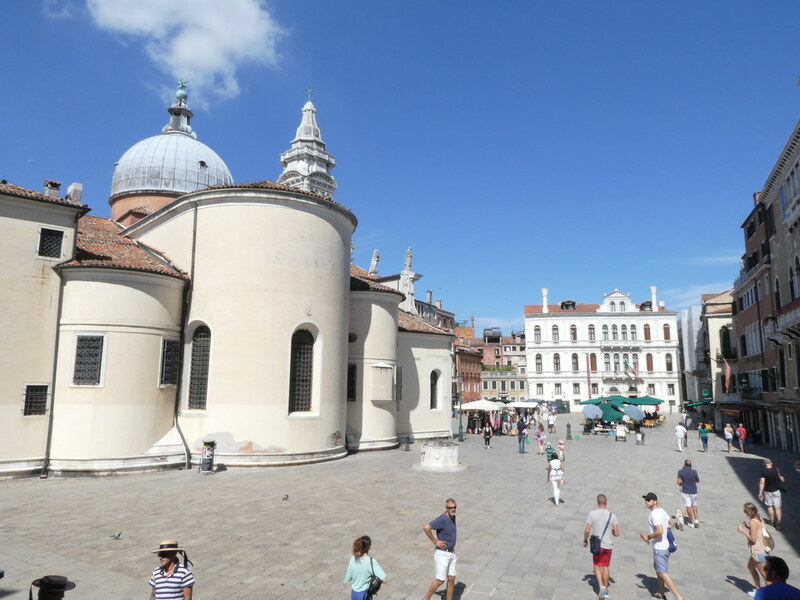 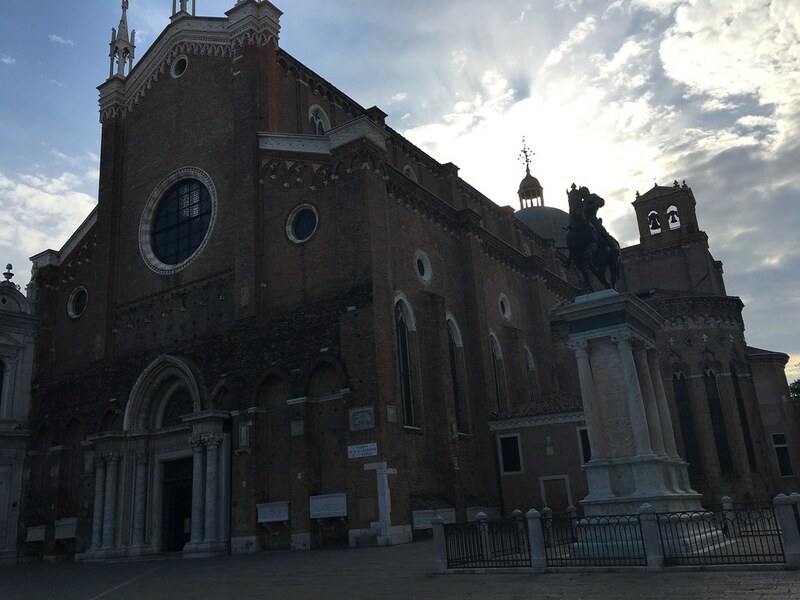 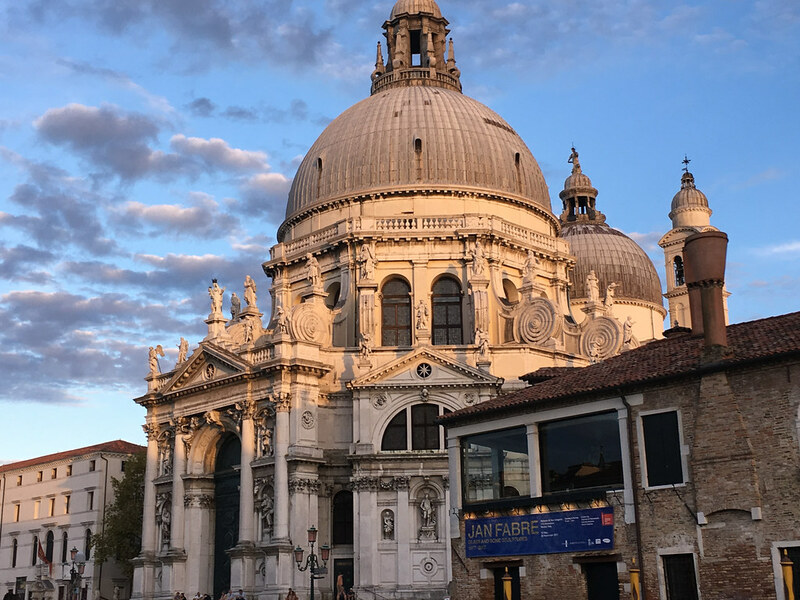 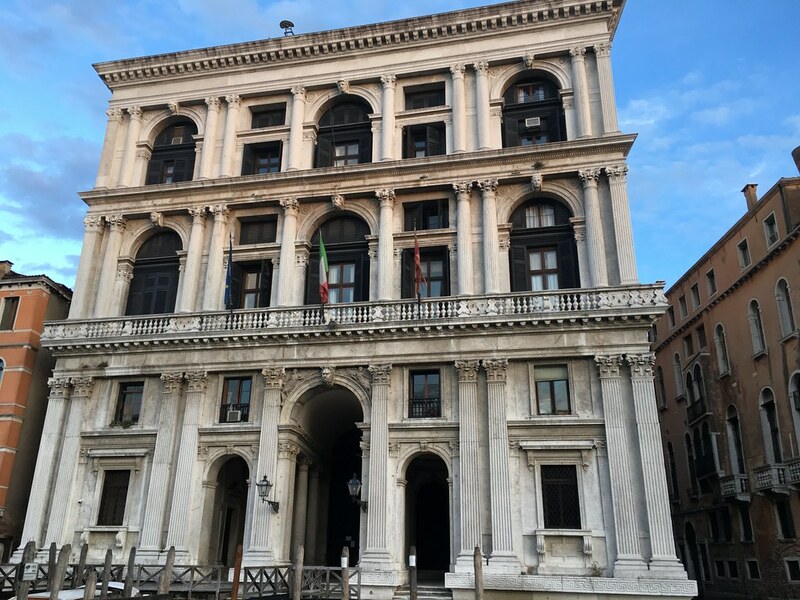 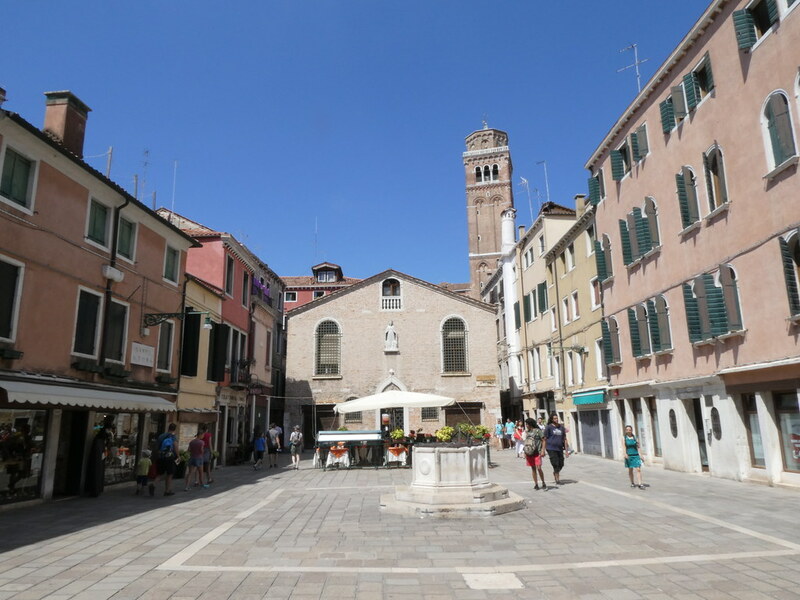 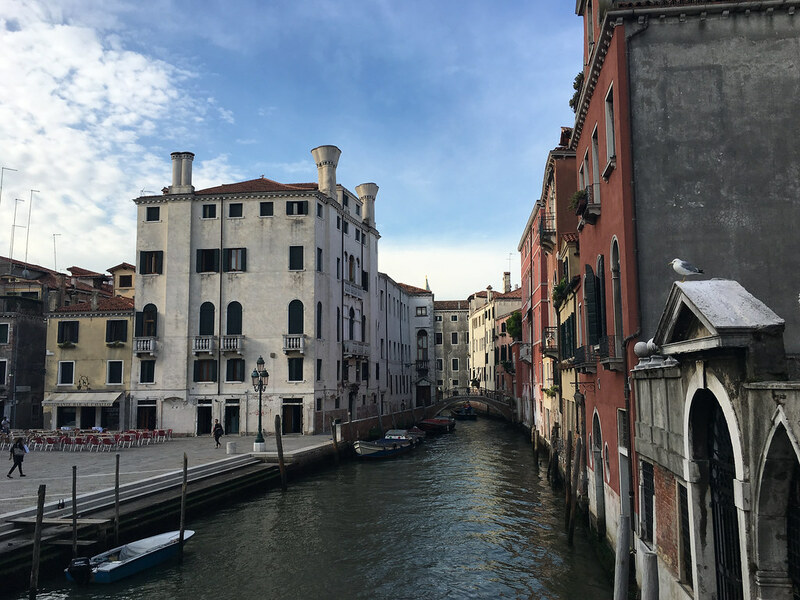 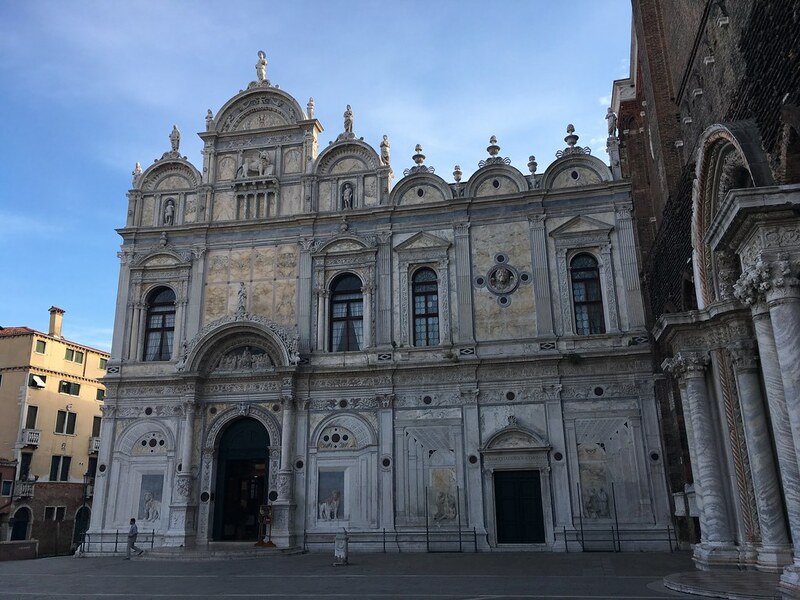 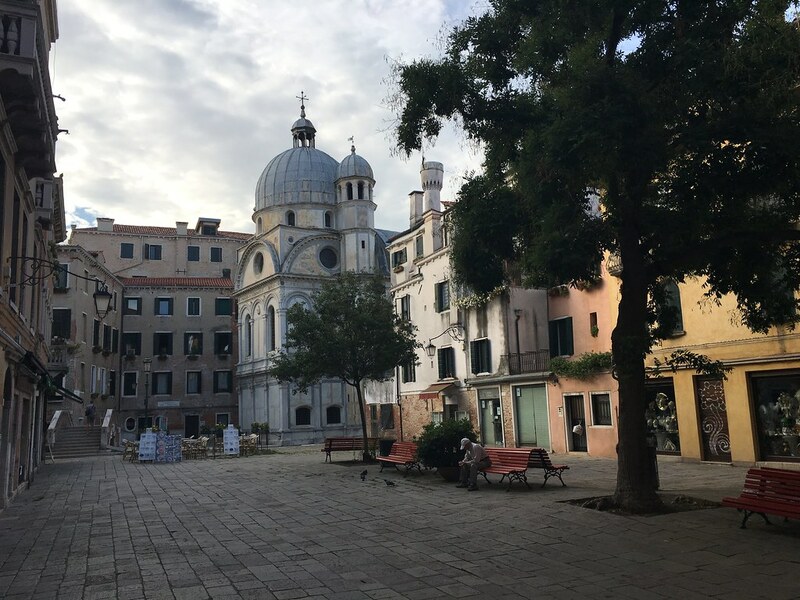 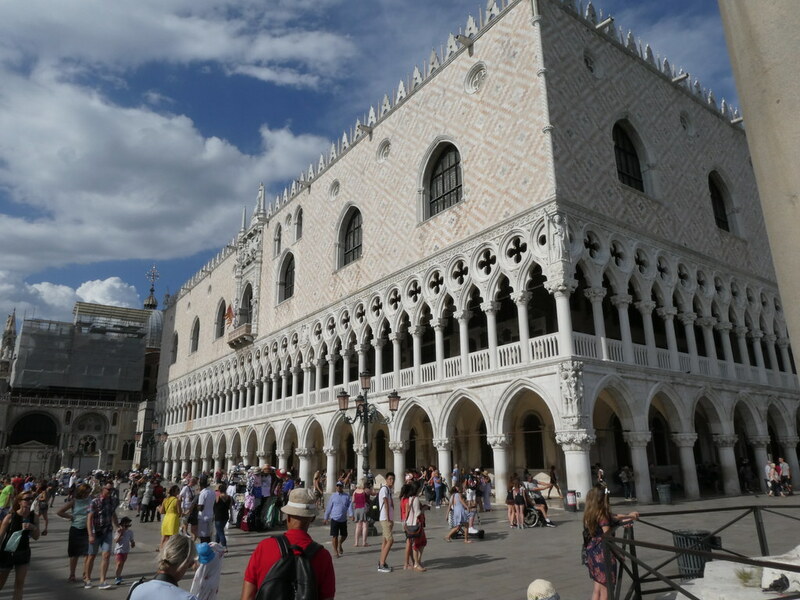 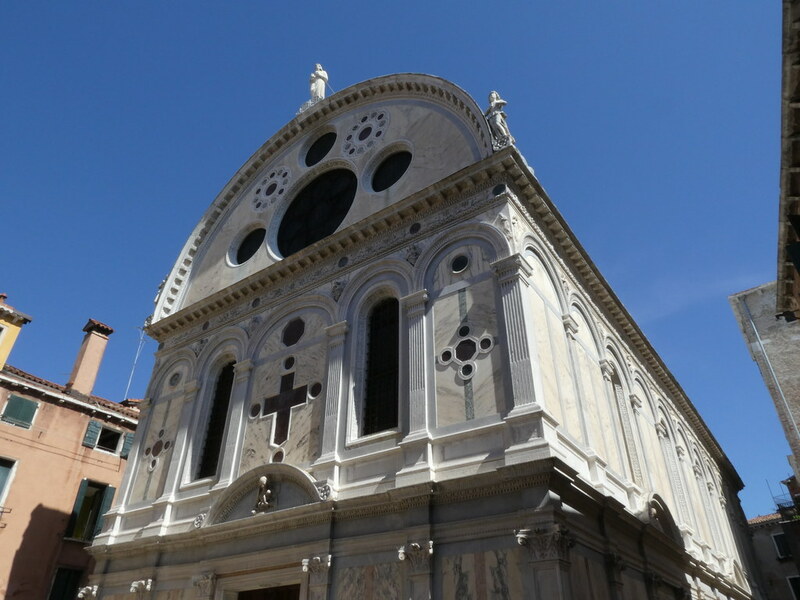 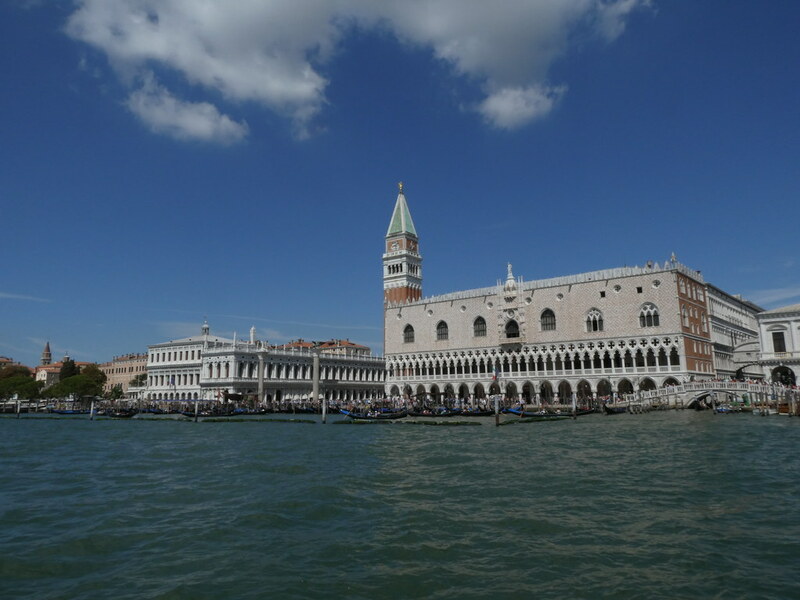 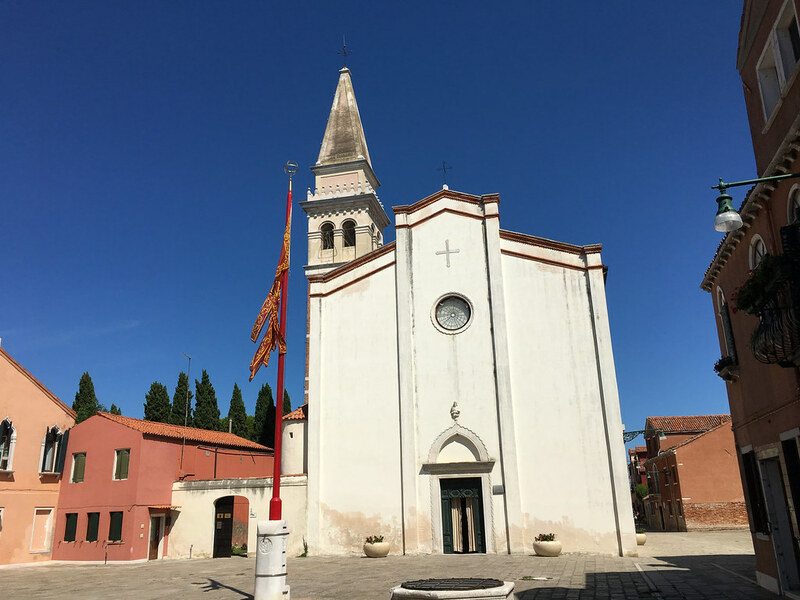 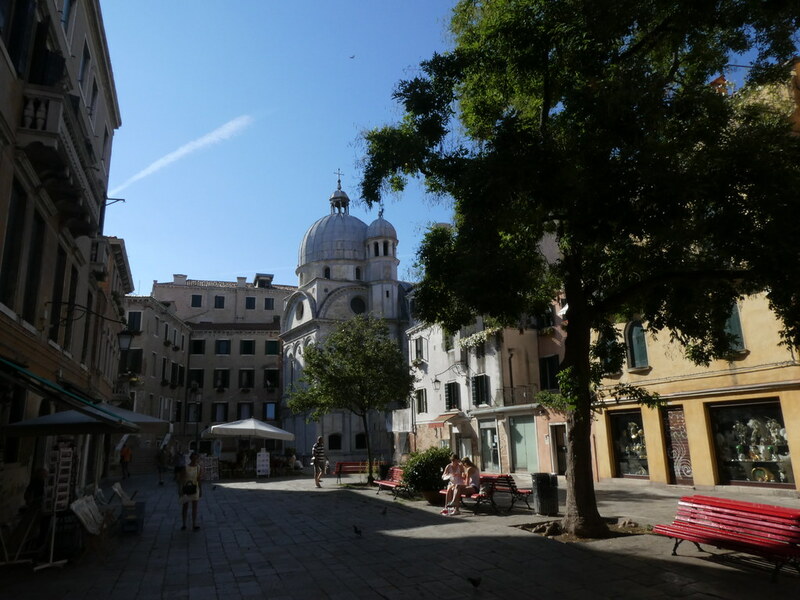 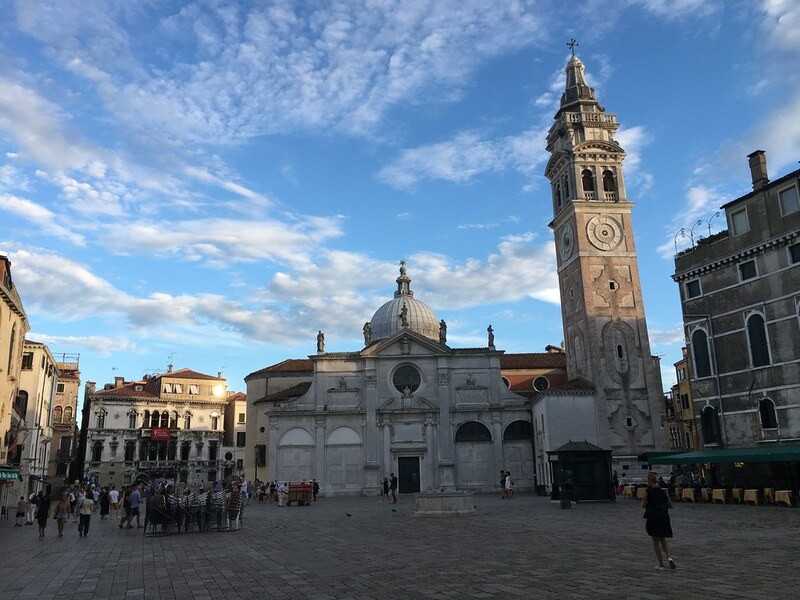 It was the seat of Venice’s government for seven centuries but was gutted by fire in 1577 and restored with white Istrian stone and Veronese pink marble. 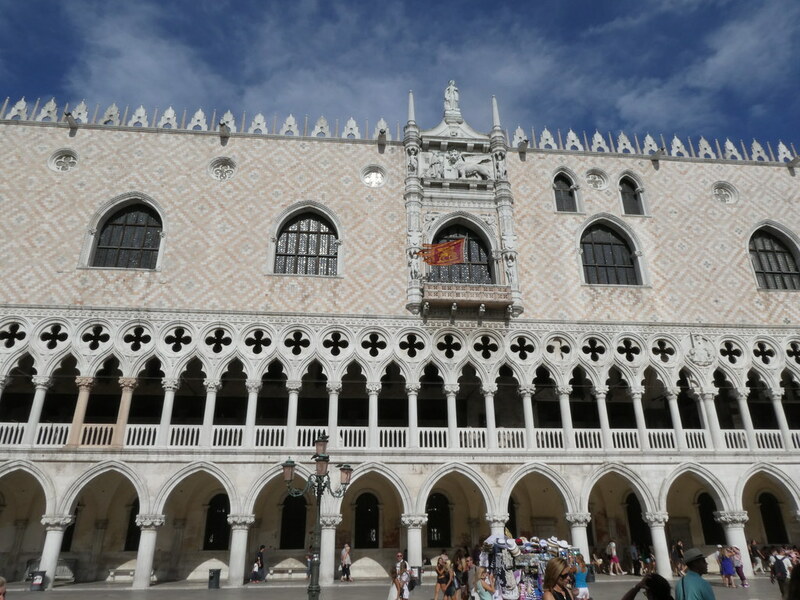 It served not only as a form of parliament but also as a prison, executioners block and grand palace of the Doge, the elected head of state. 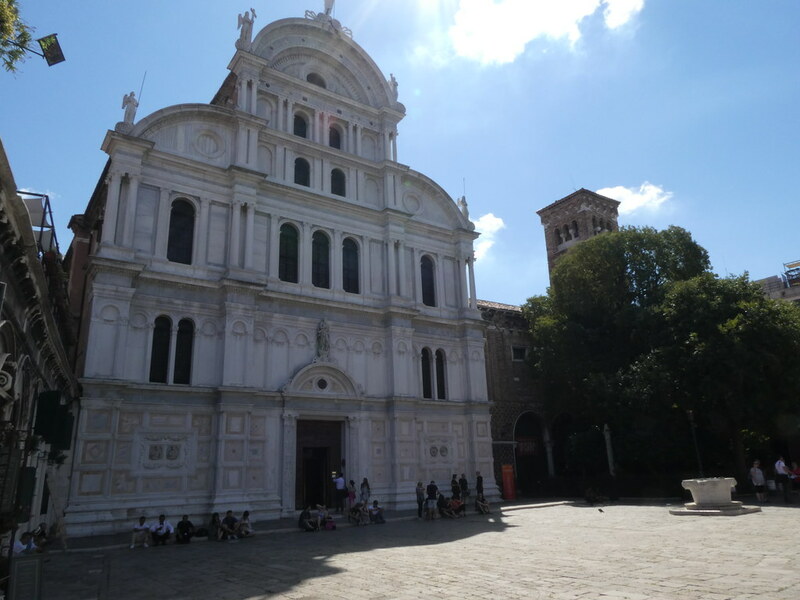 In some respects it can seem rather plain from the outside especially compared to the Basilica next door. 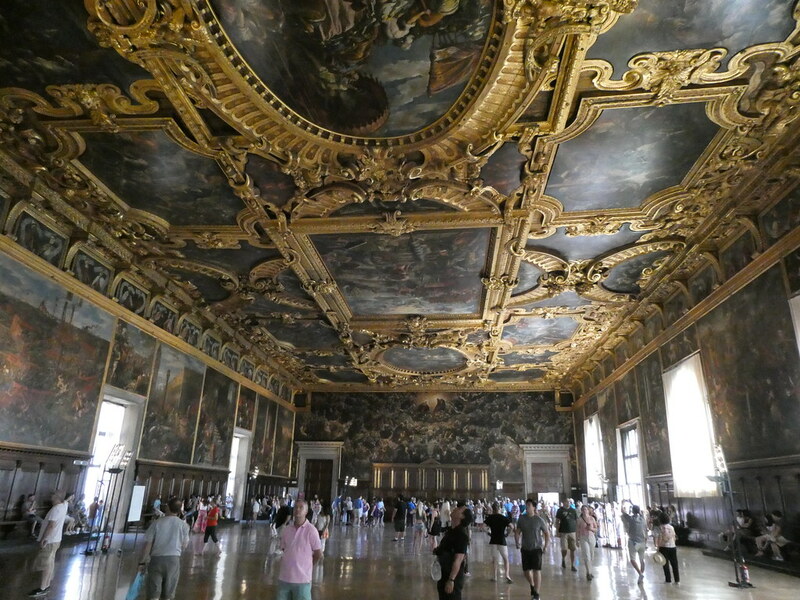 In many other ways its stunning and understated while retaining an air of grandeur and awe that I imagine kept the mortal folk in awe. 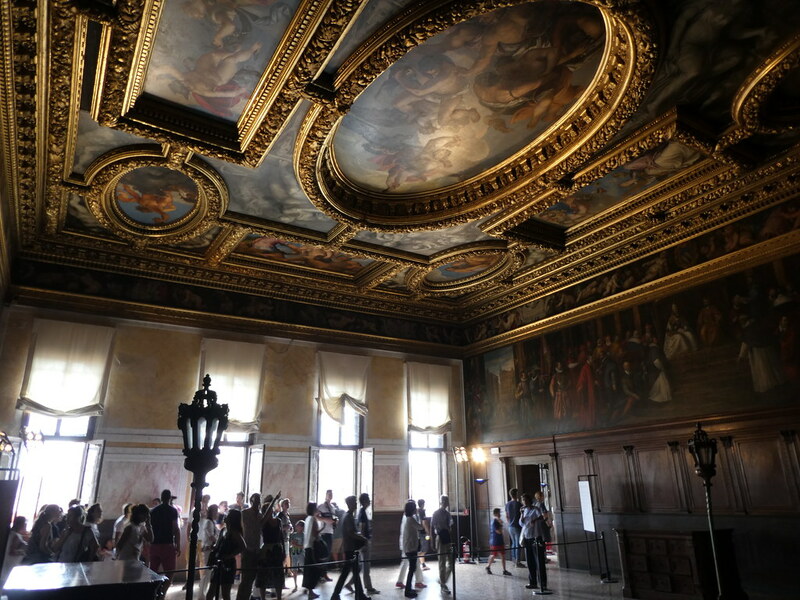 It’s on a tour of the interior that both its dark and shady secrets and its palatial opulence are revealed. 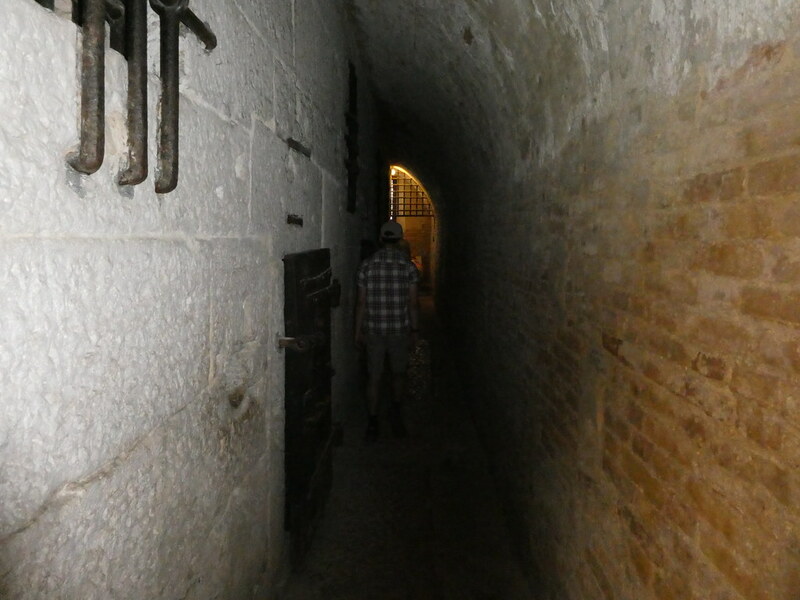 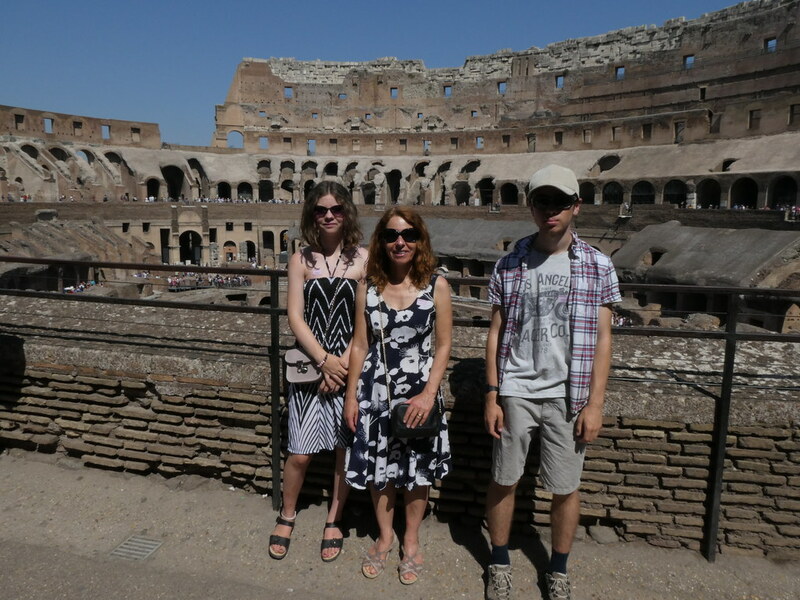 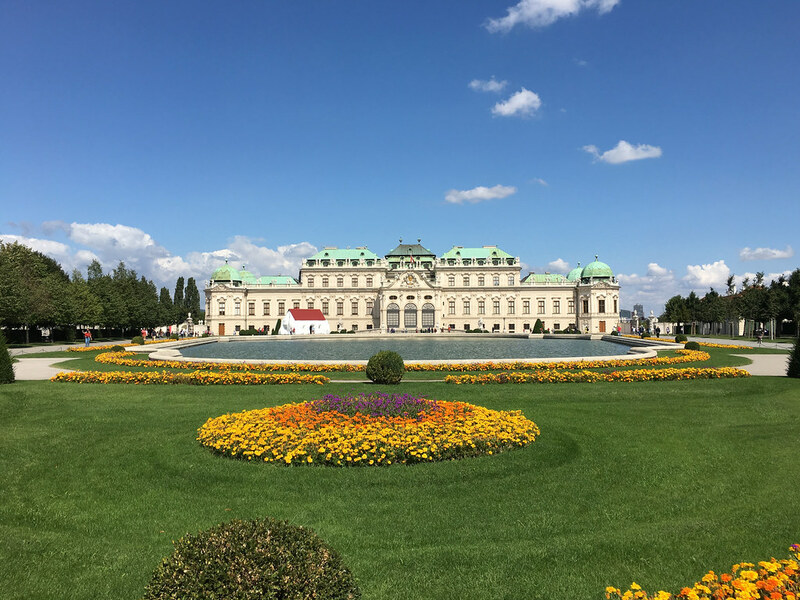 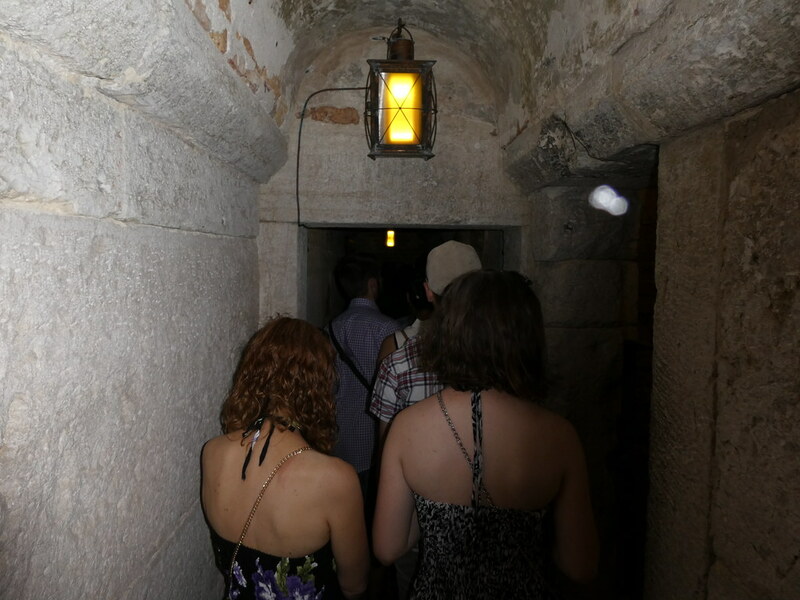 Once we were done with the secret passages tour we were free to rejoin the masses and explore the rest of the palace. 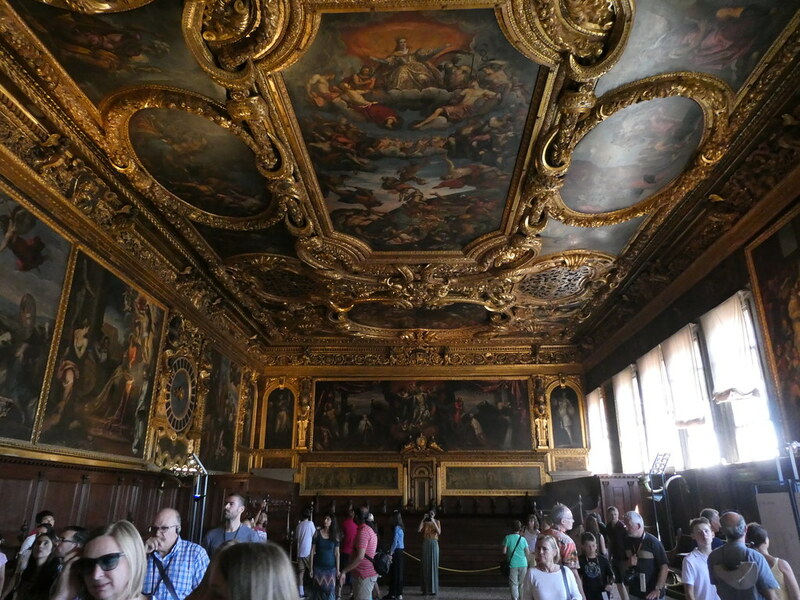 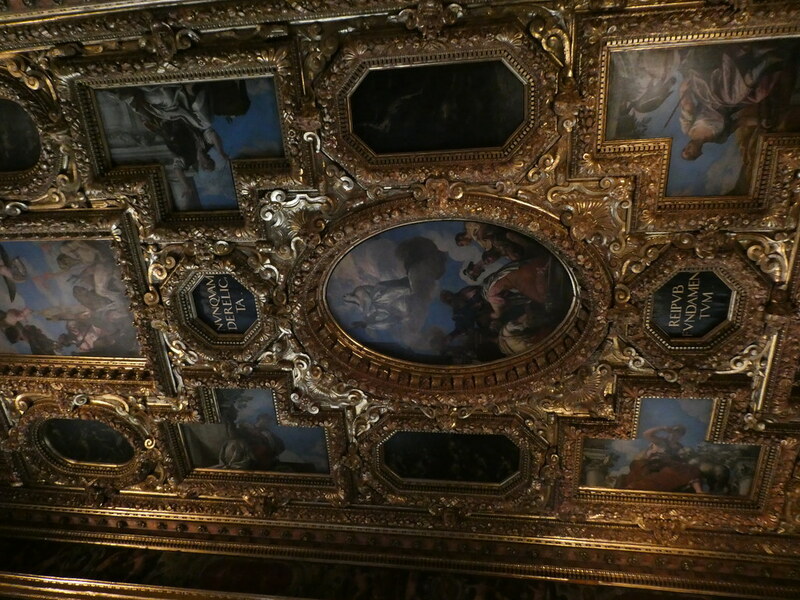 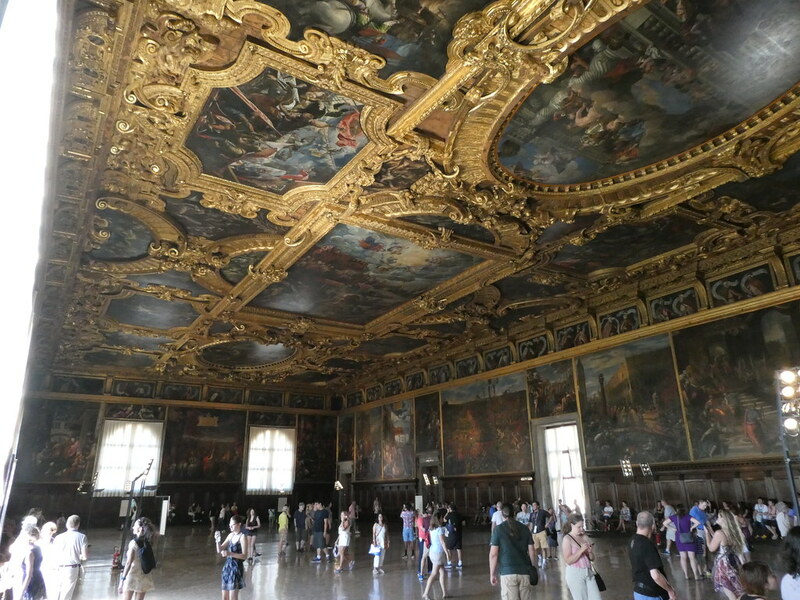 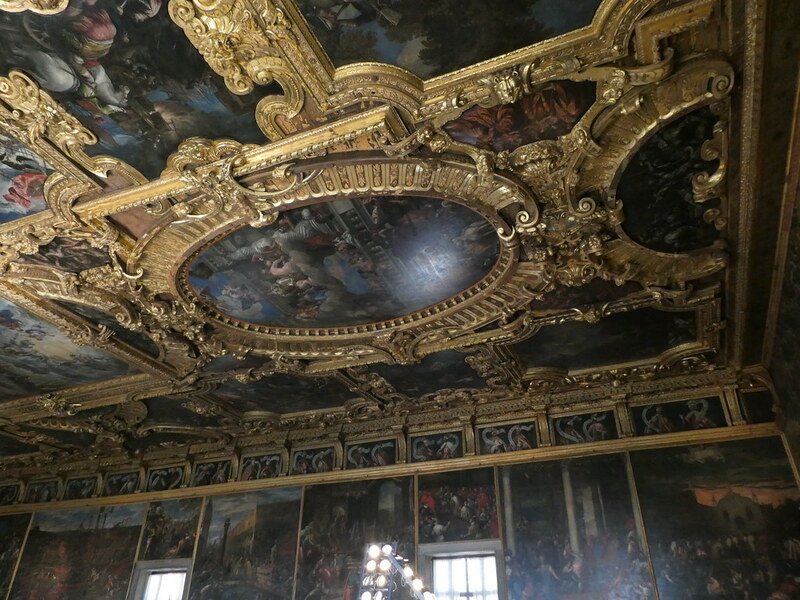 The artwork is simply staggering and there are works of art by many a famous artist such as Tintoretto and Titian adorning the walls and especially the ceilings. 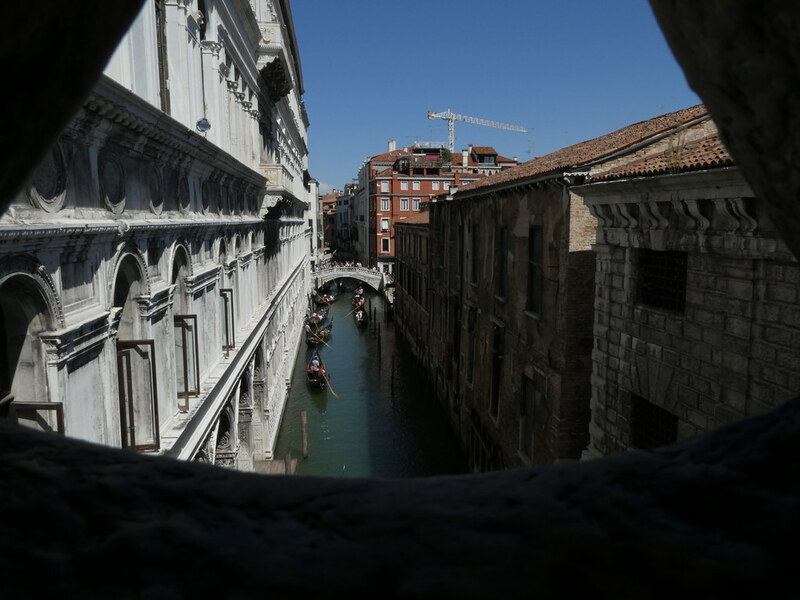 And the view seawards from the bridge. 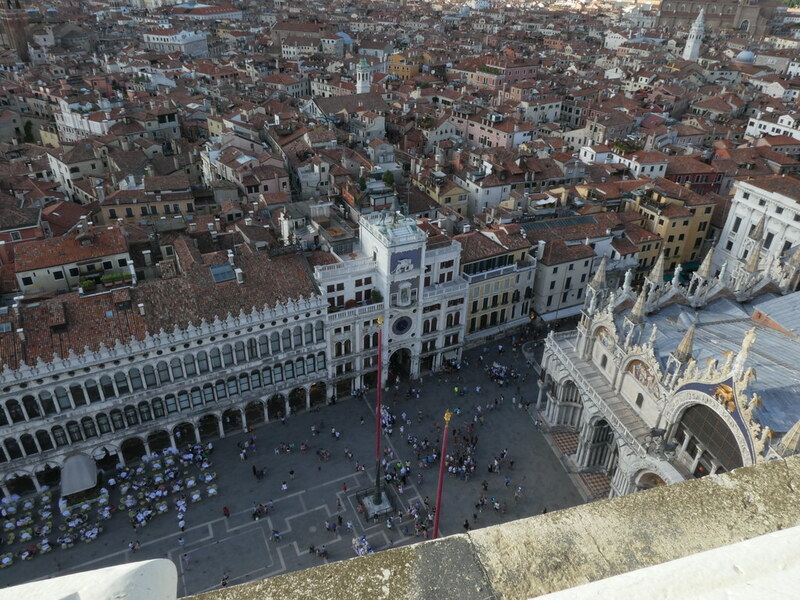 You can see the crowds gathering to take photographs. 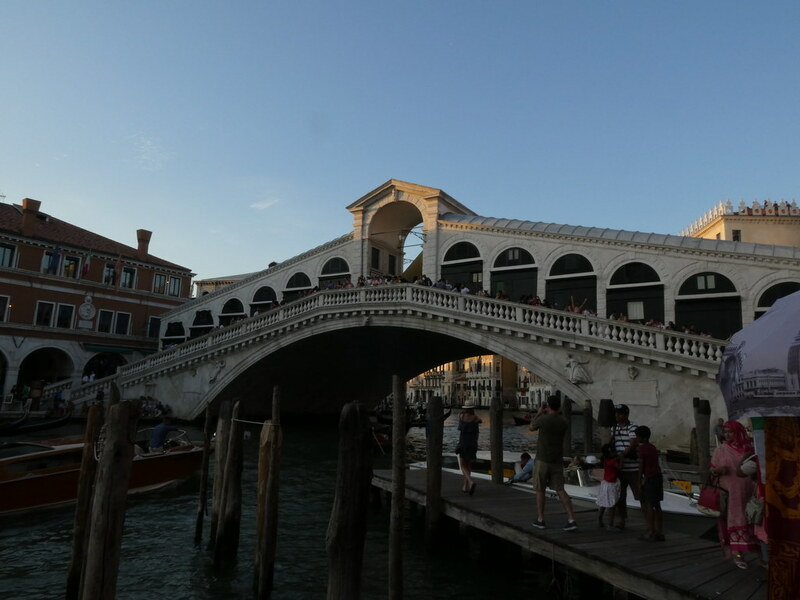 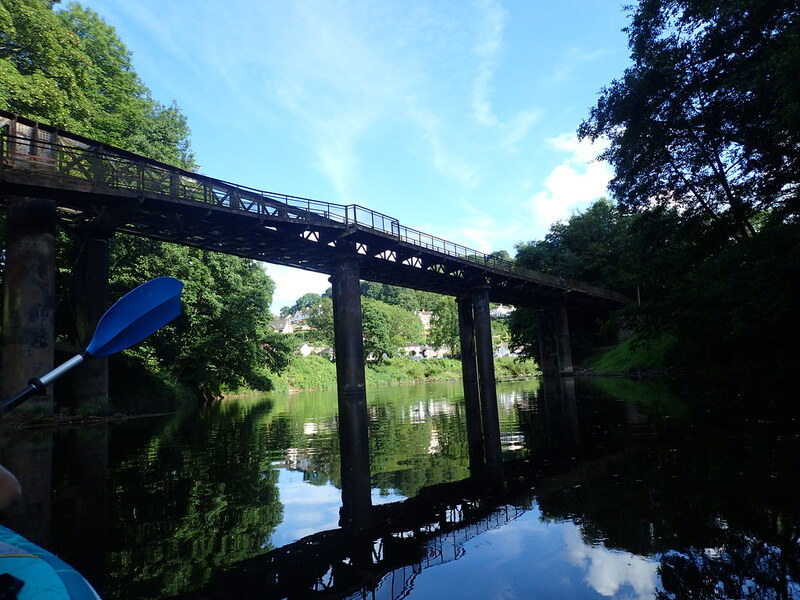 It’s a very small, not especially dramatic bridge so I’m not quite sure why it gets so much attention. 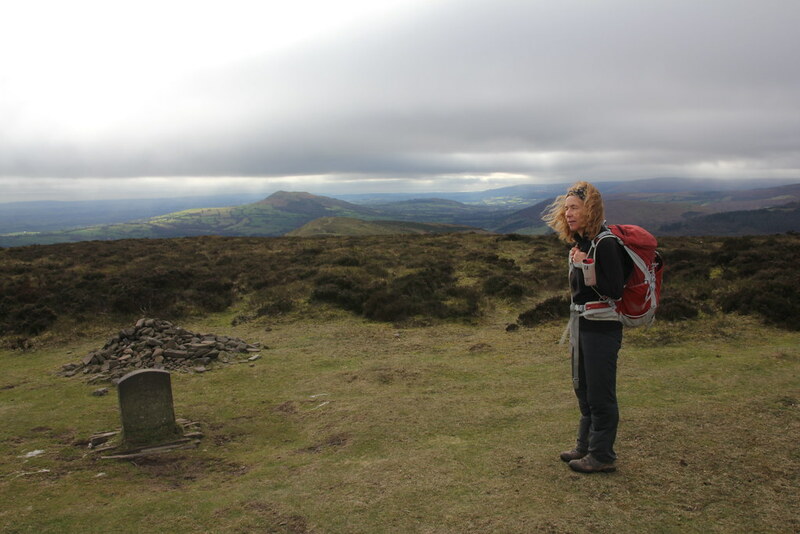 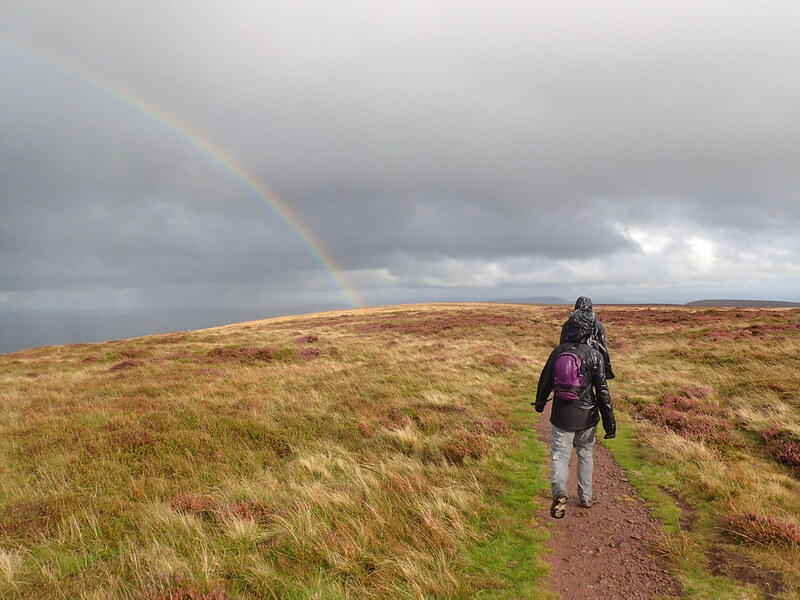 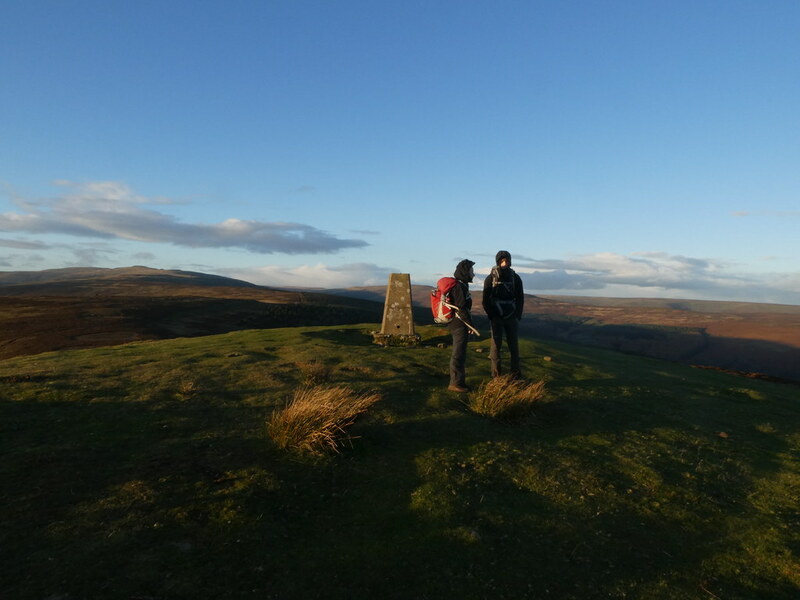 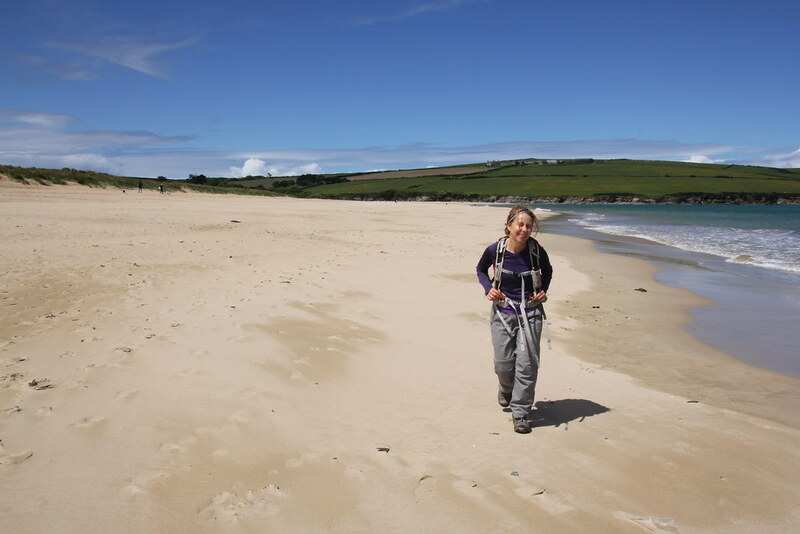 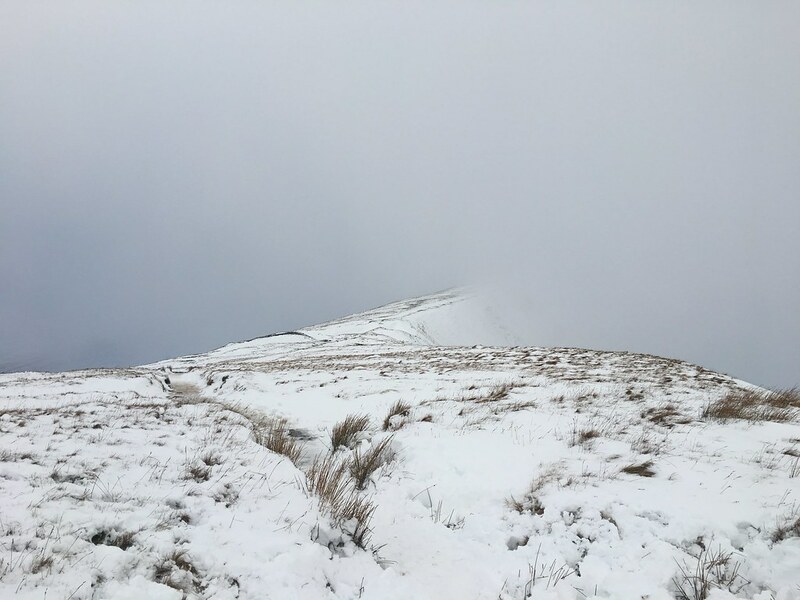 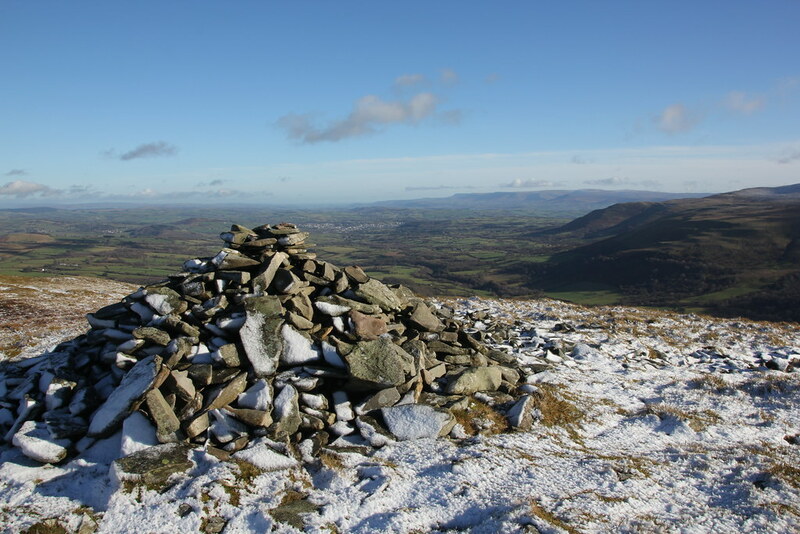 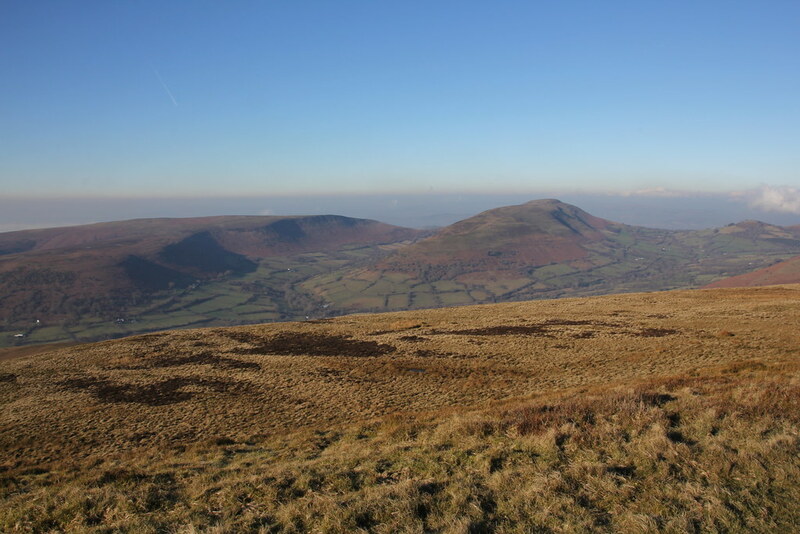 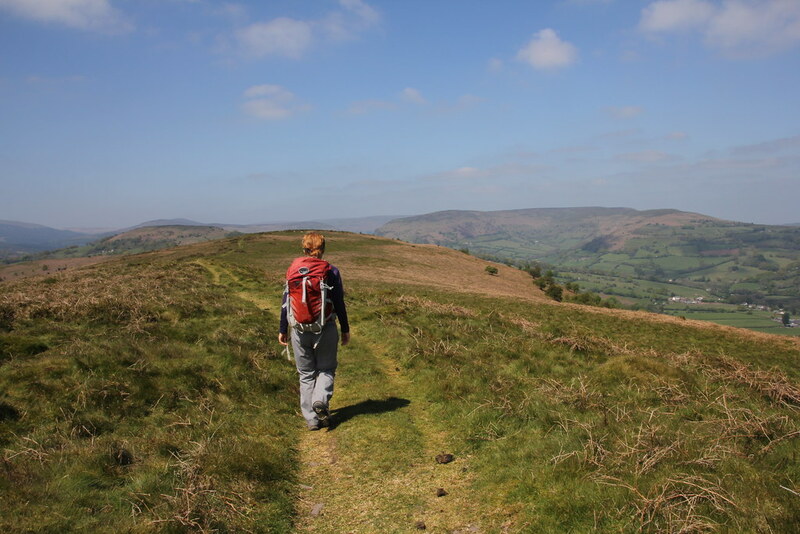 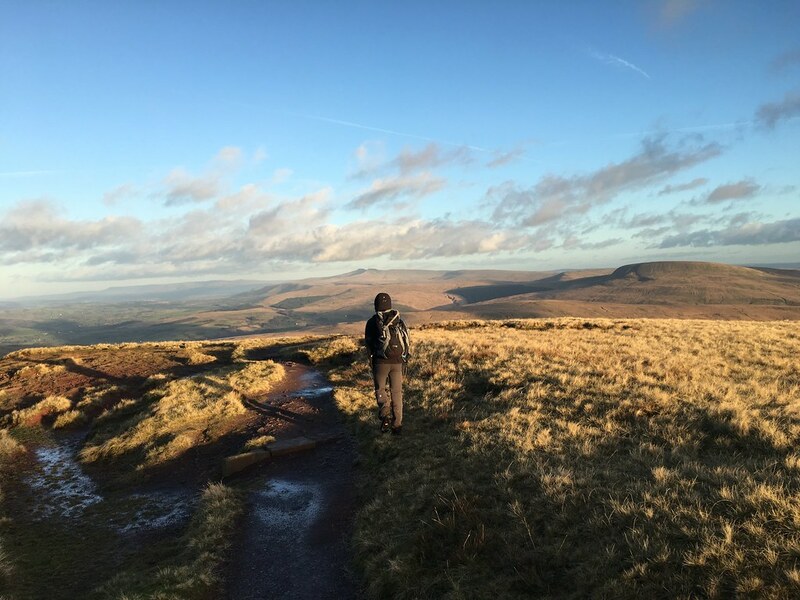 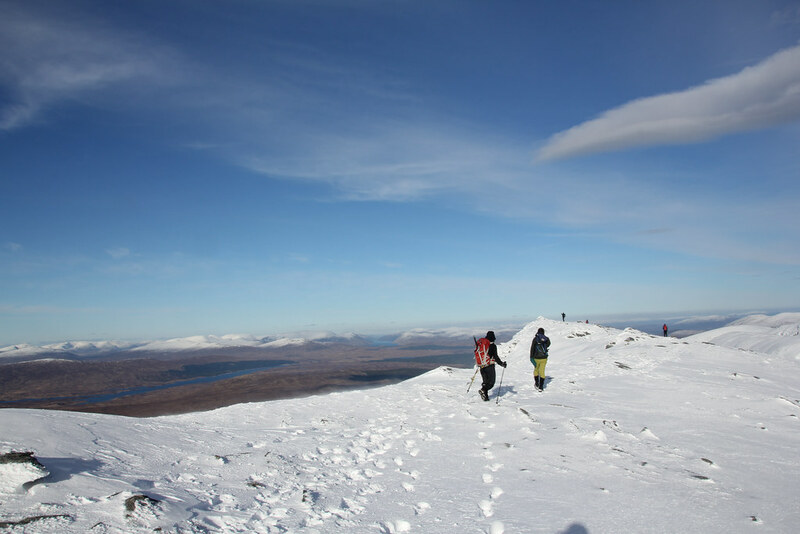 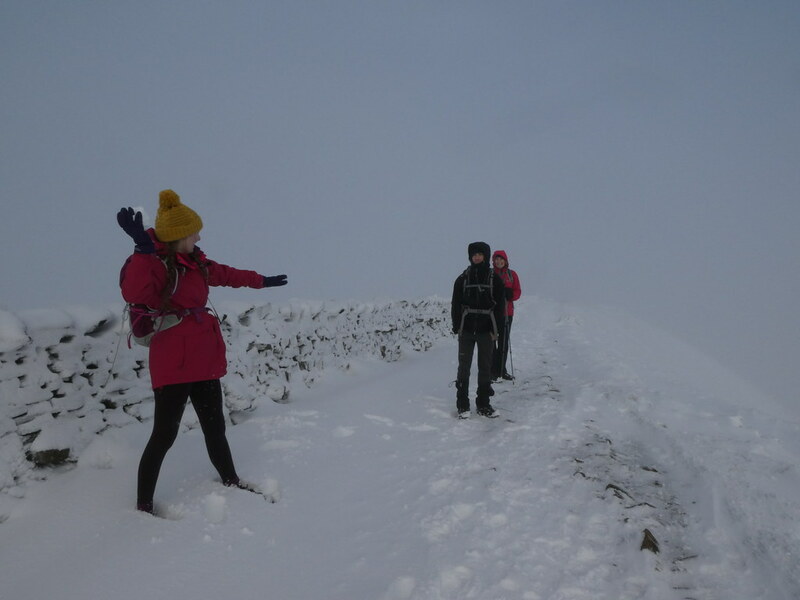 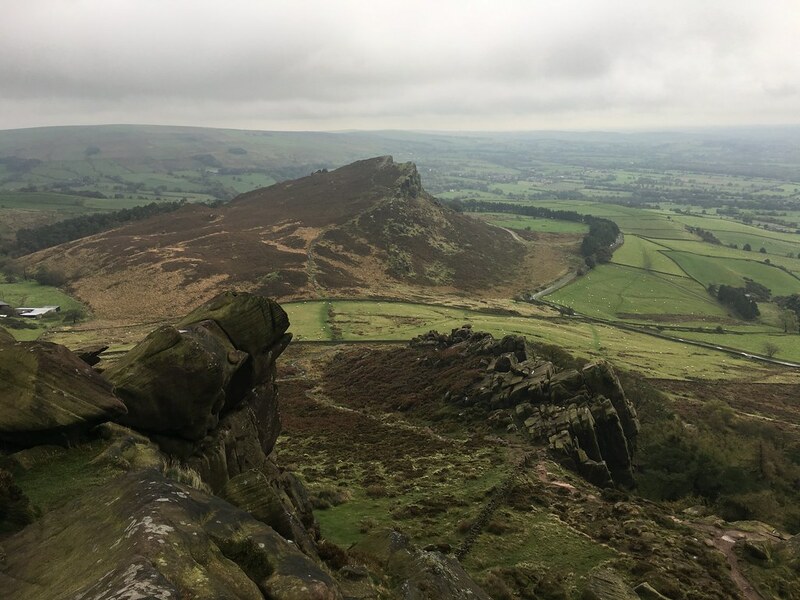 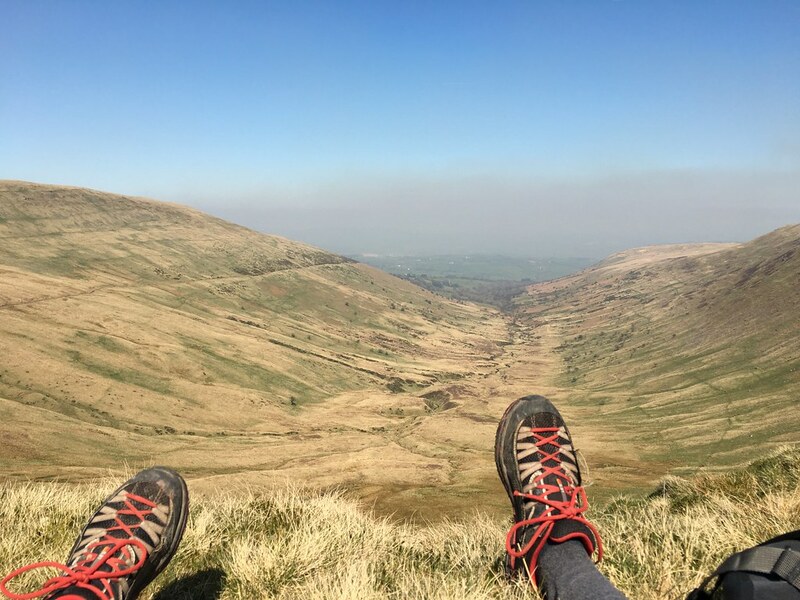 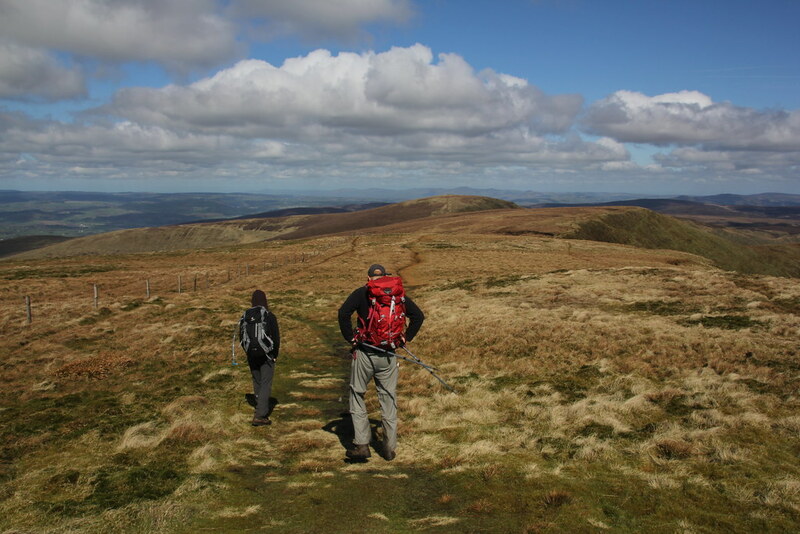 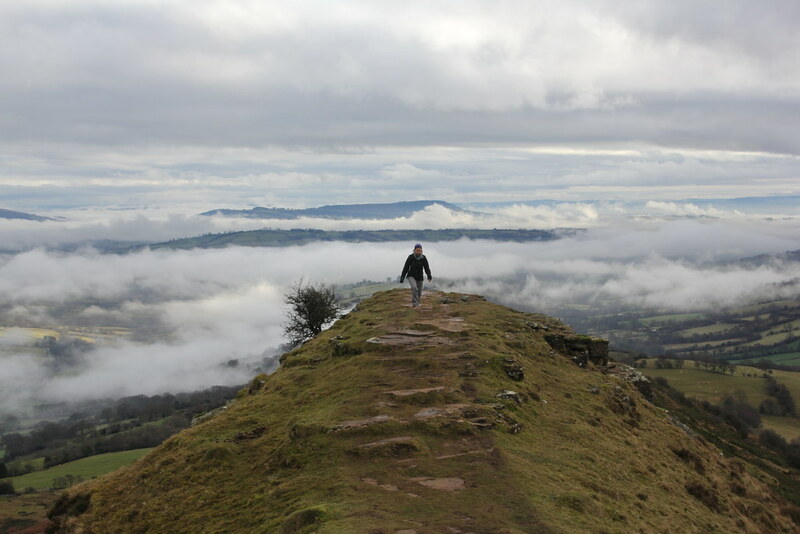 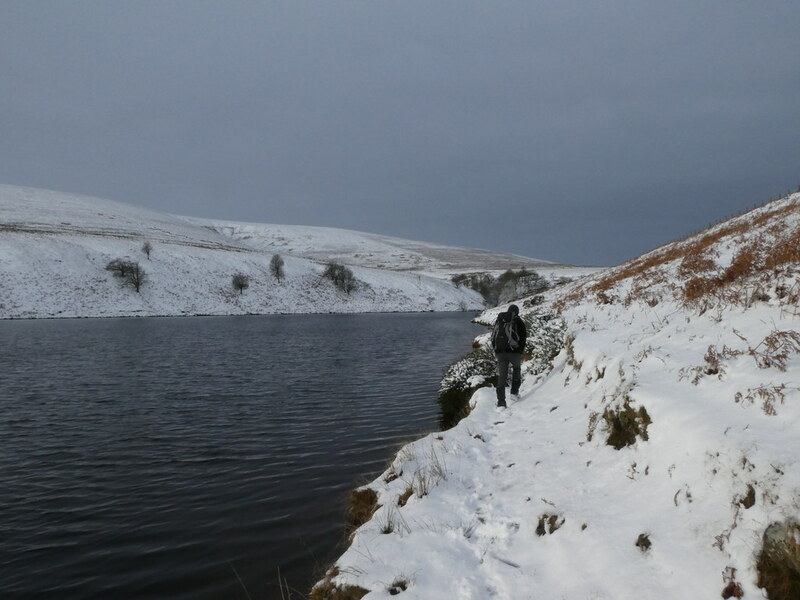 Still, I’m glad I saw it and walked across it – twice! 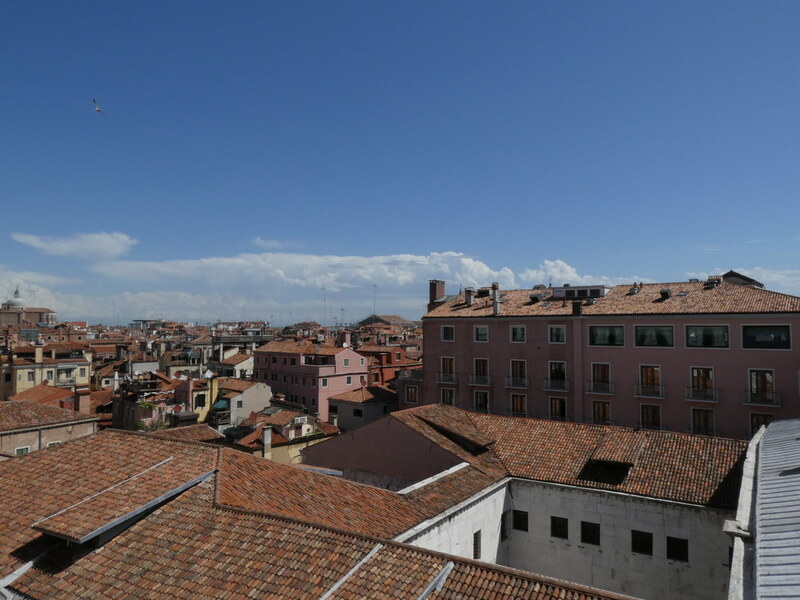 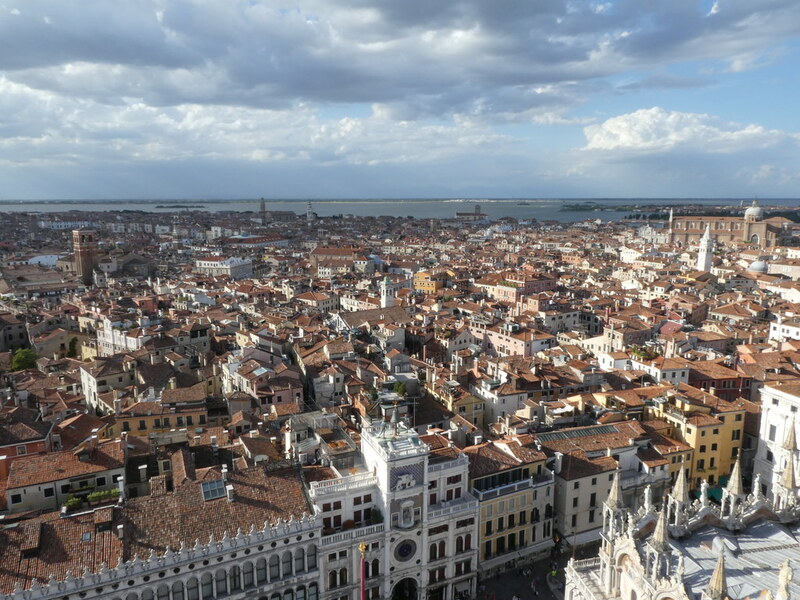 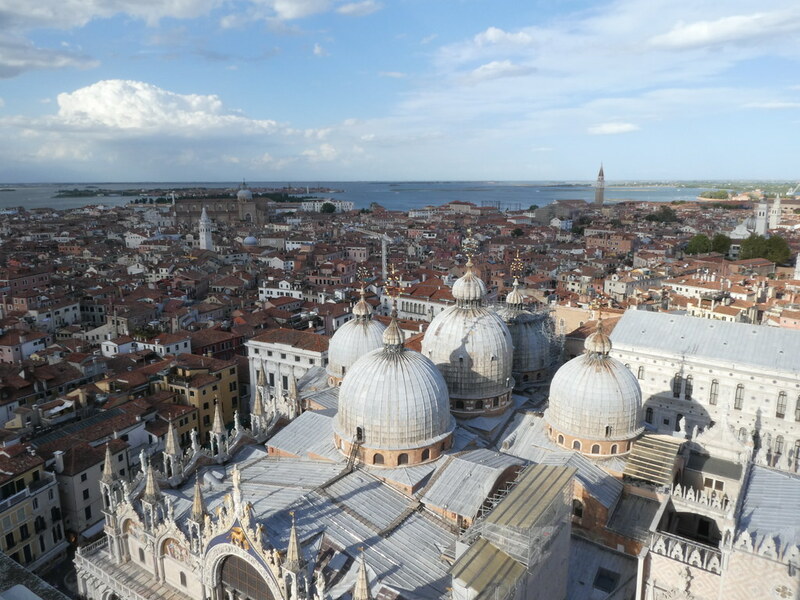 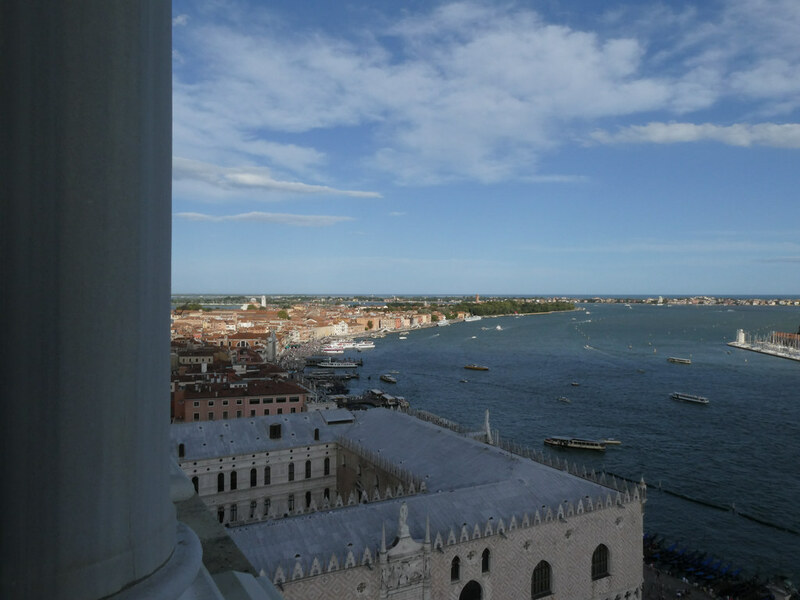 West over the Basilica di San Marco to the Canareggio district.